Nature is painting for us, day after day, pictures of infinite beauty, if only we have the eyes to see them. 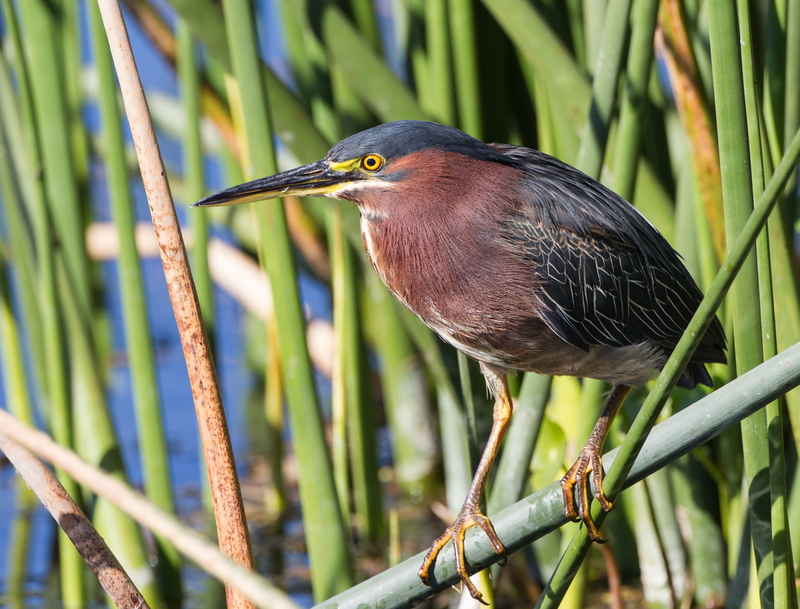 While we saw a variety of wildlife on our Florida adventure, I was a bit surprised we had not seen as many birds as I had hoped. 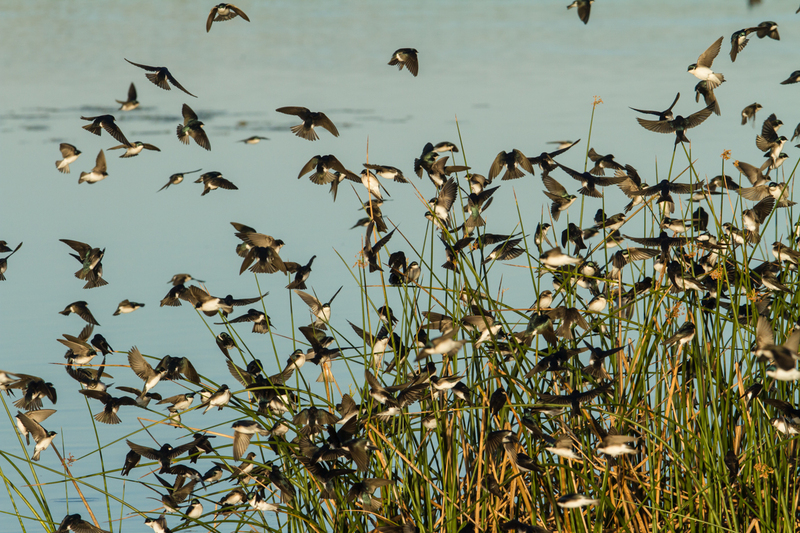 As I mentioned in an earlier post, it has been a wet winter in South Florida, which apparently causes the birds to be more spread out than usual during the winter months. 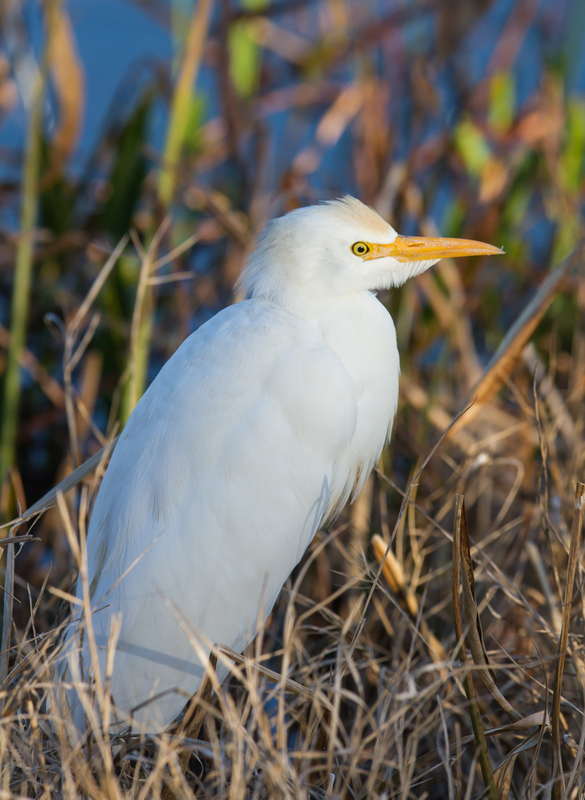 There had been plenty of scattered sightings (and some great views) of egrets, herons, hawks, and song birds, but no large concentrations. On our last evening in Florida, I was hoping to change all that. 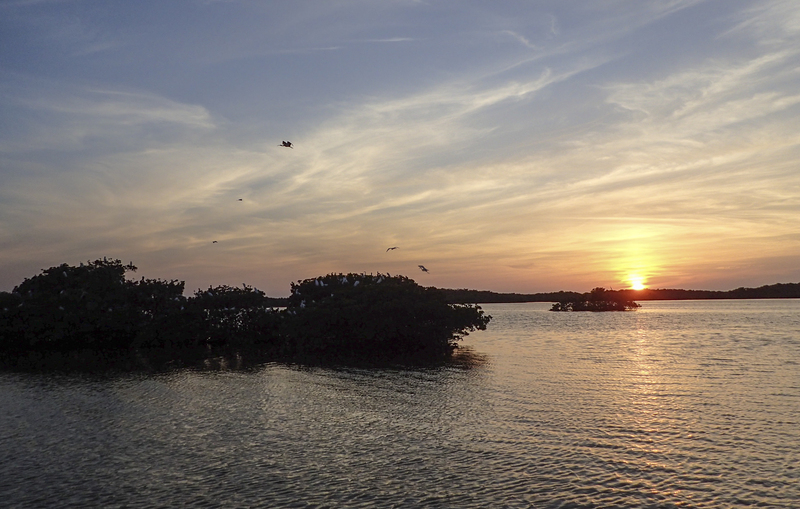 On the advice of our kayak tour company, I had booked a sunset boat tour with Allure Adventures out of Everglades City. 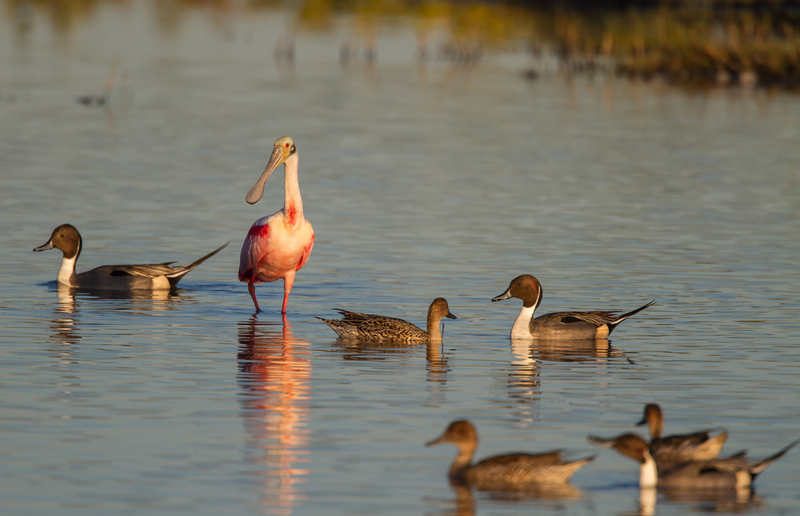 I was told Captain Kent was a long-time local that took small groups out to the mangrove islands at sunset with the chance of seeing lots of birds coming to roost, beautiful skies, and maybe even dolphins and sea turtles. He lived up to the promotion. 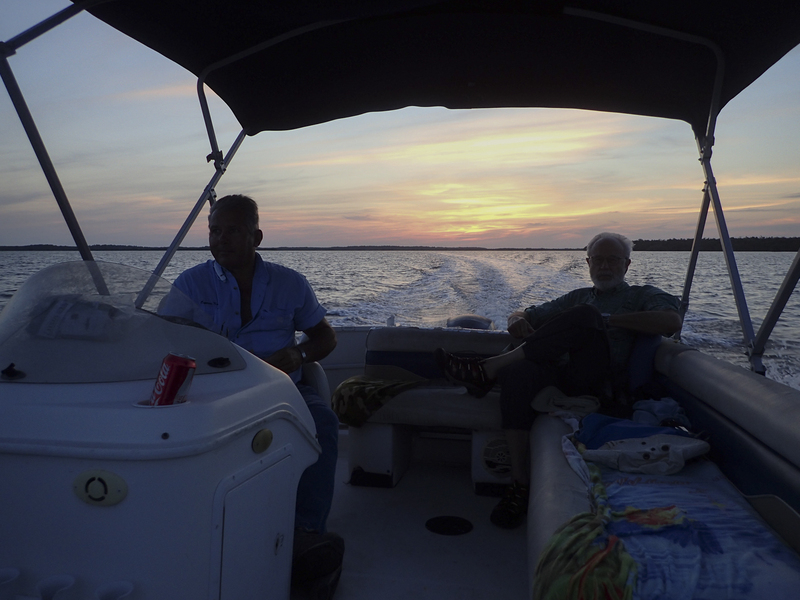 We met him at at the dock at 5:45 p.m., boarded his small boat, and headed out into the area known as Ten Thousand Islands. Close to shore we saw pelicans, a few egrets, some cormorants, and passed by a couple of osprey nests. 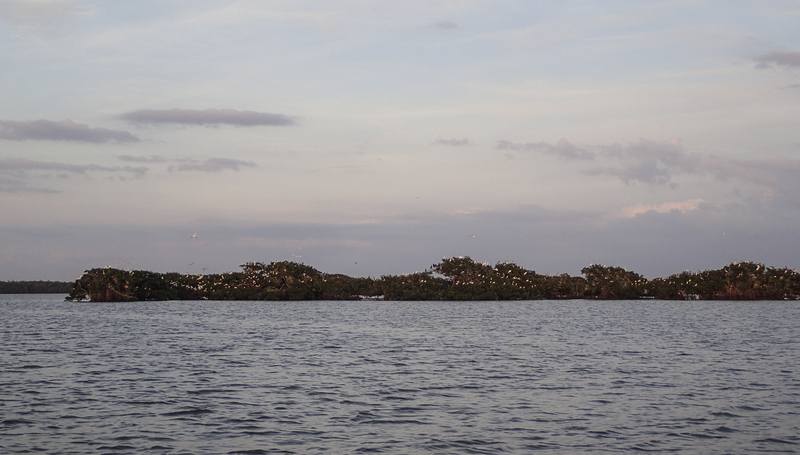 Within a few minutes, we saw a cluster of mangrove islands dotted with birds, lots of birds. 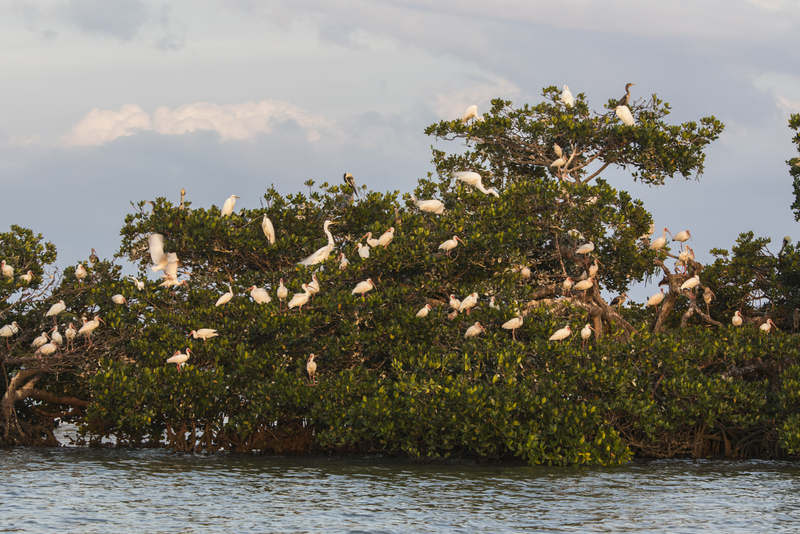 As our boat slowly circled the islands, I could see hundreds of great egrets, brown pelicans, white ibis, cormorants, and other species jostling for position as more of their kind flew in to roost for the evening. 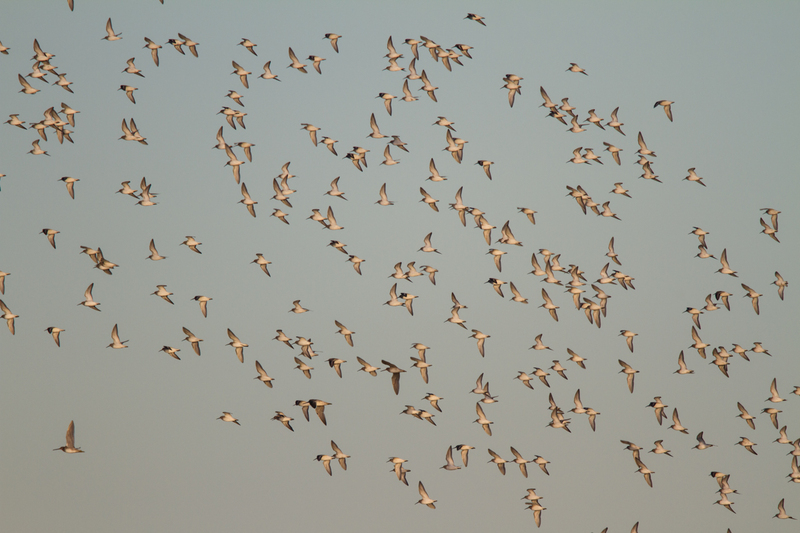 Boats are required to stay a certain distance away from the roosting birds so as to not disturb them. 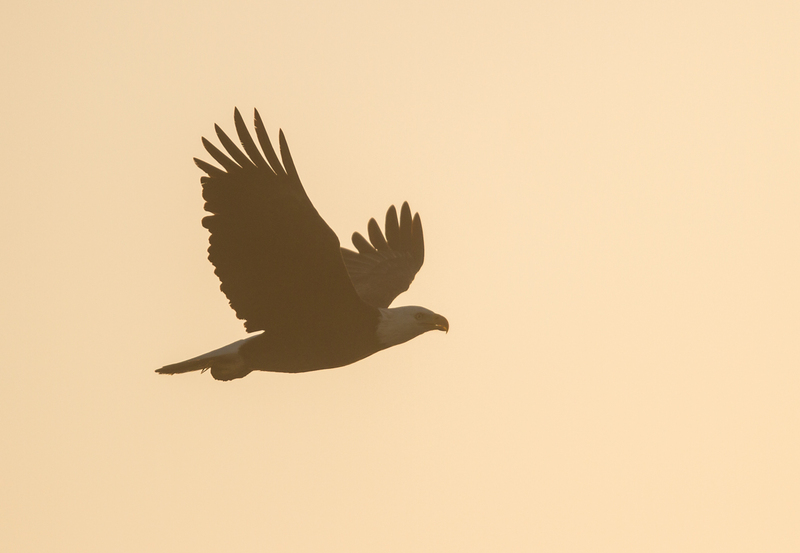 Our slow speed, the calm waters, and a telephoto lens (plus a cropped image) allowed great views and close-ups. Promising we would return before sunset, the captain steered us out through a maze of islands until we came to the edge of the Gulf of Mexico. We beached the boat and got out for a stroll for a few minutes to take in the view and immensity of the scene. Cruising back toward the birds, we spotted a couple of sea turtles, and a small group of dolphins. As we passed through the area where the dolphins had been swimming, the captain said they often like to “play” with the boat. 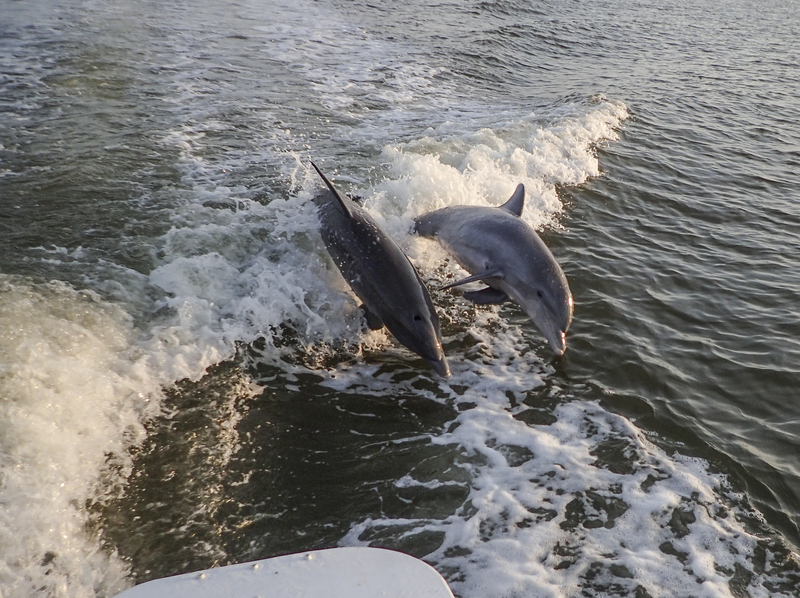 Sure enough, it wasn’t long until we had dorsal fins trailing in the wake of our boat, with dolphins taking turns leaping out of the water behind us. I’m not sure who enjoyed it more, the dolphins or us. We spent several minutes enjoying the company of the dolphins, but the captain soon turned the boat back toward the bird islands. 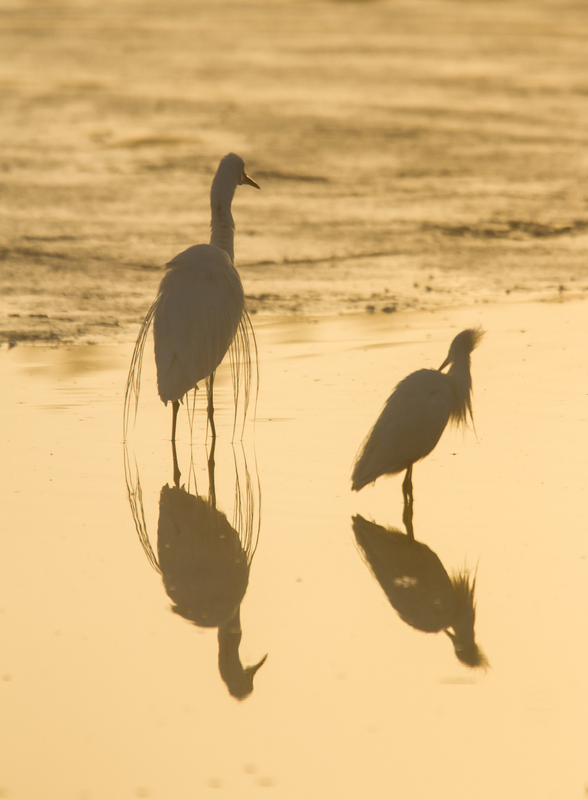 The sun was setting and he wanted us to see how many more birds were now occupying the mangroves. As we approached, the trees were speckled with white and dark shapes, with more coming in from all directions. The color of the sky became a flame orange as we circled the islands one last time. 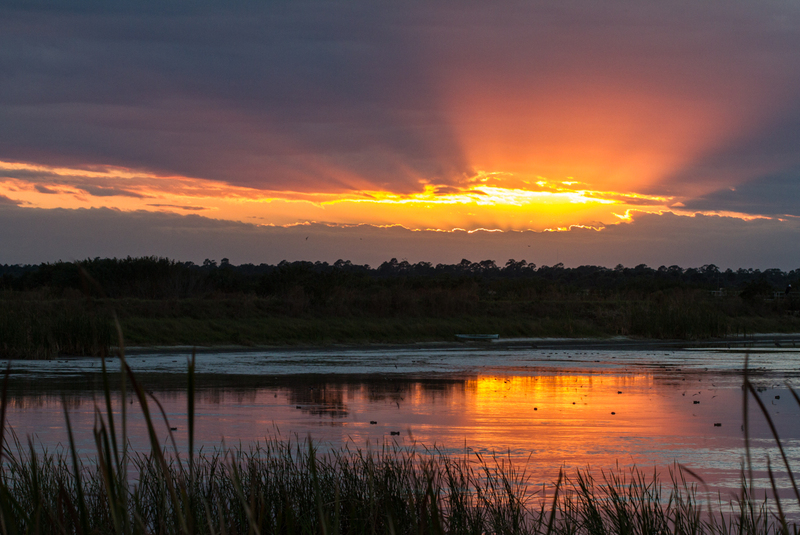 This was what Captain Kent wanted us to see…the bird rookery with a golden sky as a backdrop. 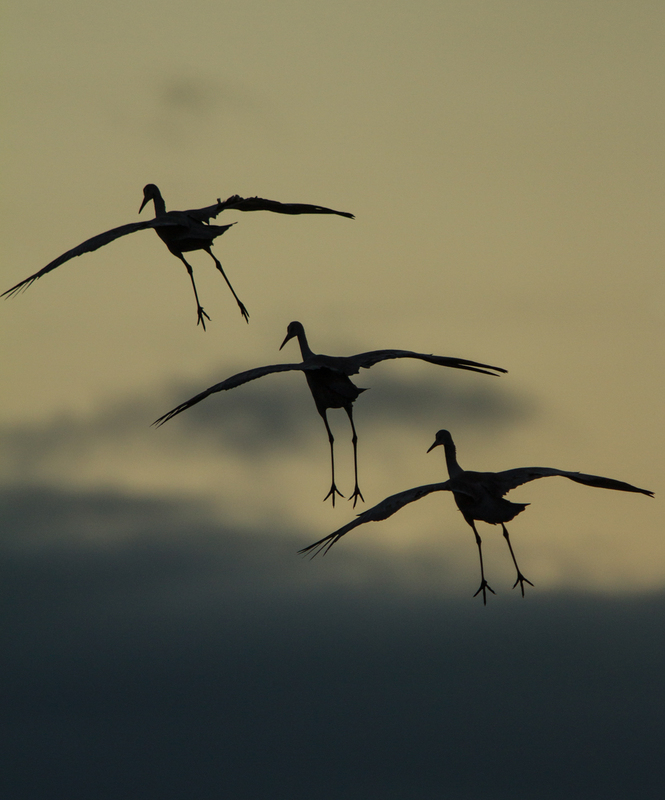 It was a perfect way to end our trip – calm waters, a beautiful sky, and huge numbers of birds flying in for the evening. 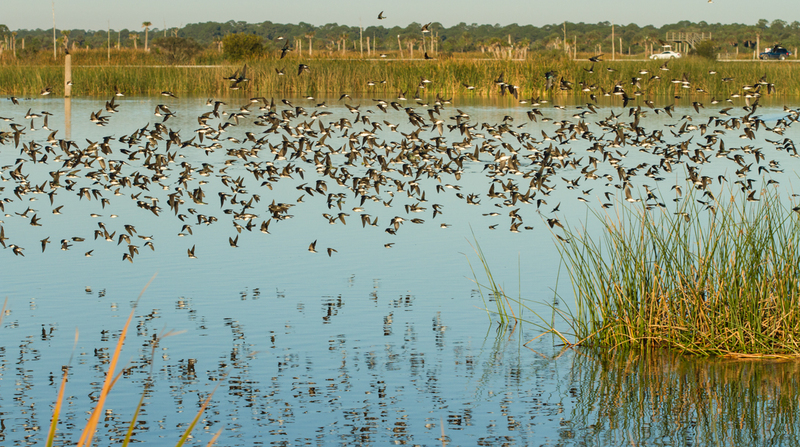 This was what I had hoped to see, the spectacle of wild Florida. And I must also thank Captain Kent for going above and beyond the call of duty. One of our party left behind a pair of rather expensive binoculars, presumably out on the mangrove island we had walked on. The captain made a special effort to look for them on his next outing, and, amazingly, found them. They have been shipped to the owner, and we all thank him for an amazing trip, and his kindness. Now, that IS the perfect ending. If, in the name of progress, we want to destroy everything beautiful in our world, and contaminate the air we breathe, and the water we drink, then we are in trouble. 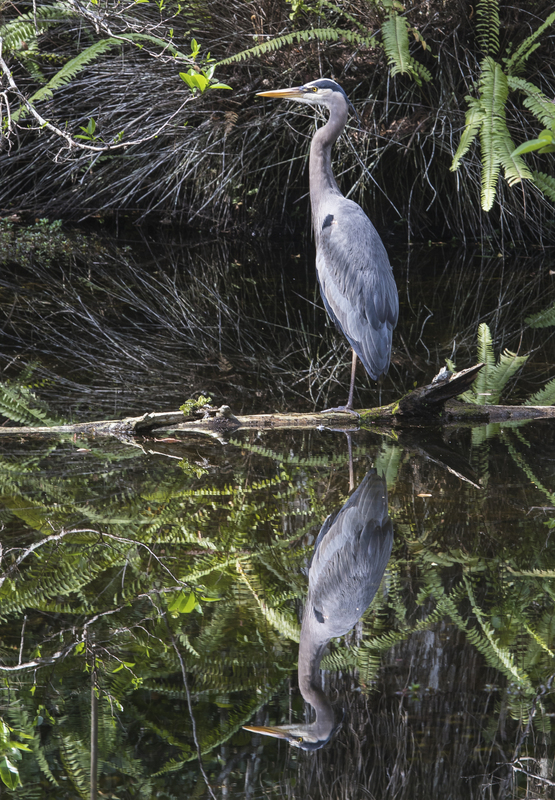 Big Cypress National Preserve was once called the Western Everglades, and was originally supposed to be part of the national park, but was removed from protection before the park was created in 1947. 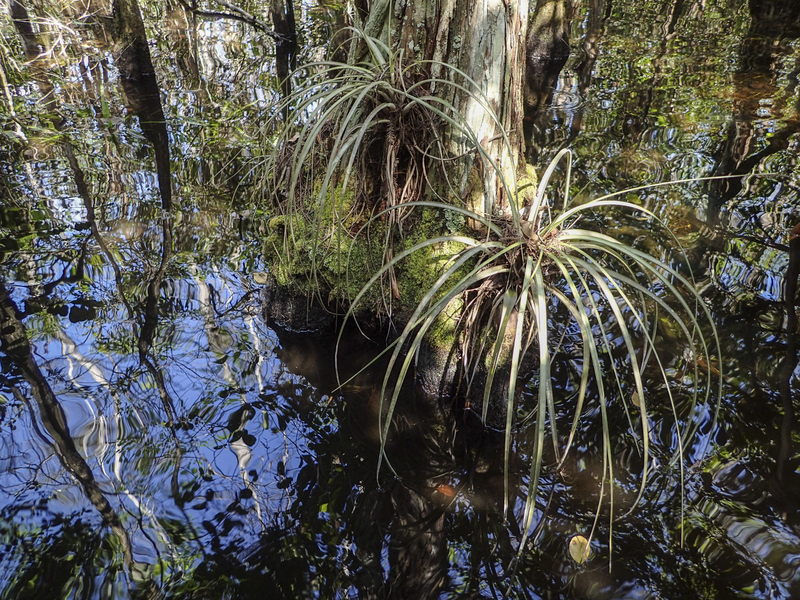 An elevation difference of 1 to 2 feet makes Big Cypress a vastly different ecosystem than the river of grass of much of the eastern portion of Everglades National Park. 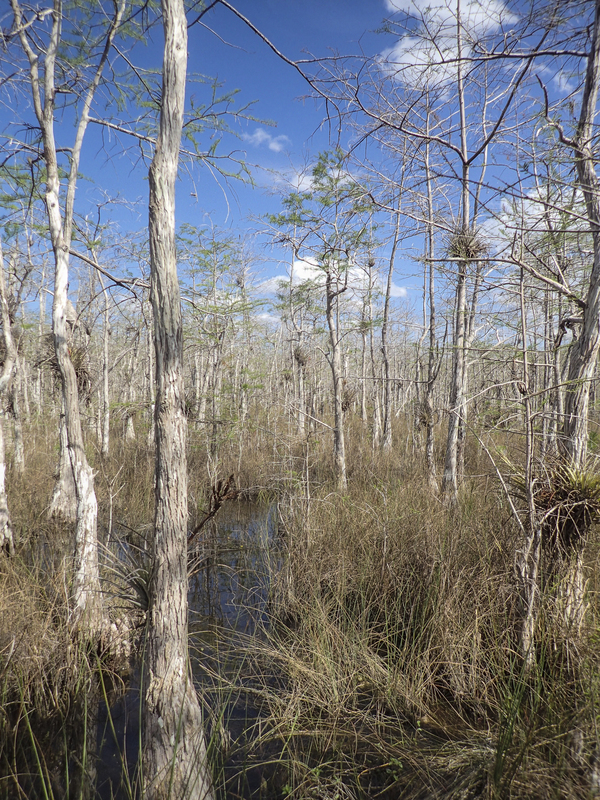 Big Cypress is home to deep water cypress sloughs and strands (linear cypress islands) and is underlain more by peat than the limestone deposits more common in much of the park. 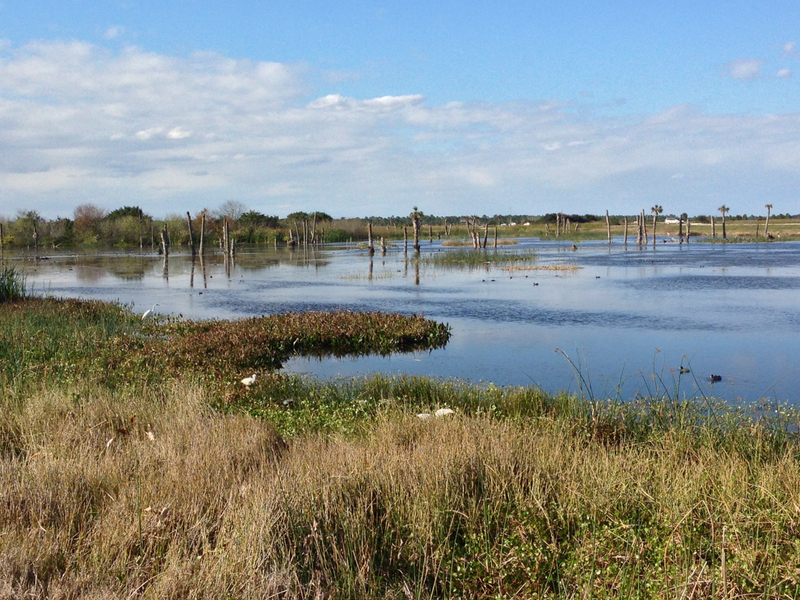 The result is more of a “swamp feel” than the open grass prairies we experienced on our first two days in Florida. 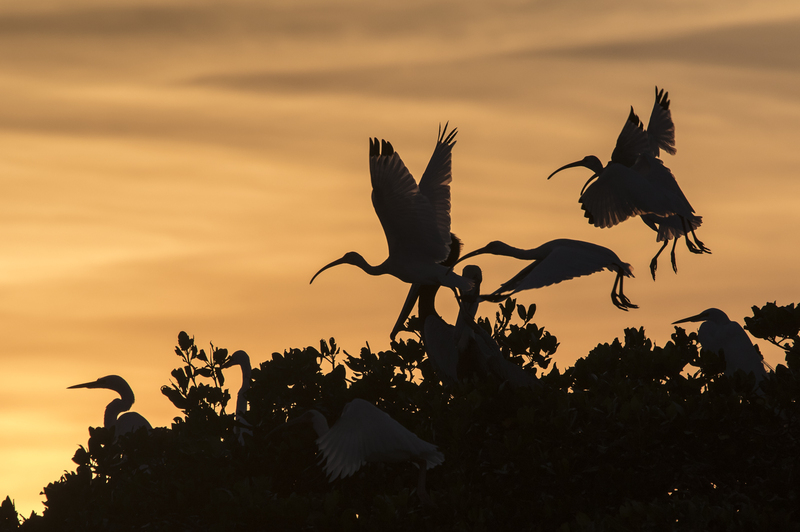 It wasn’t until I returned home that I found out about the contentious history of the effort to preserve what is now Big Cypress National Preserve, the first national preserve in the United States. 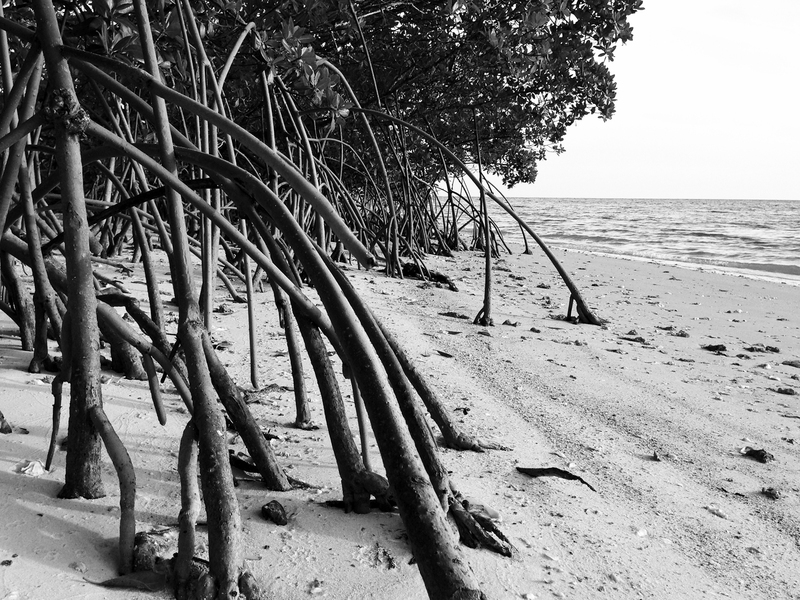 After the virgin cypress were essentially logged out throughout much of the region in the 1930’s and 40’s, the area was proposed as part of Everglades National Park. 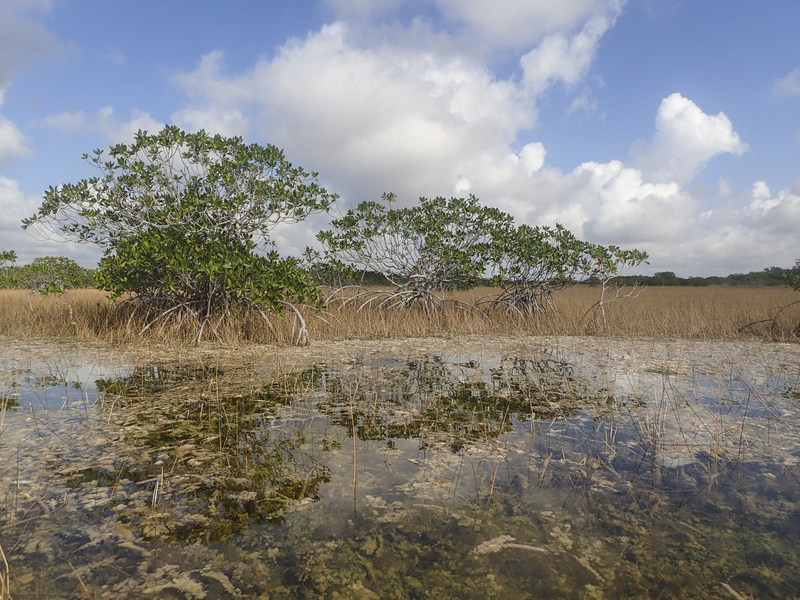 But, when the park was created, the lands encompassing Big Cypress were excluded. More controversy erupted in 1968, when plans were unveiled to create a huge jetport (what would have been the largest airport in the world) in part of Big Cypress. 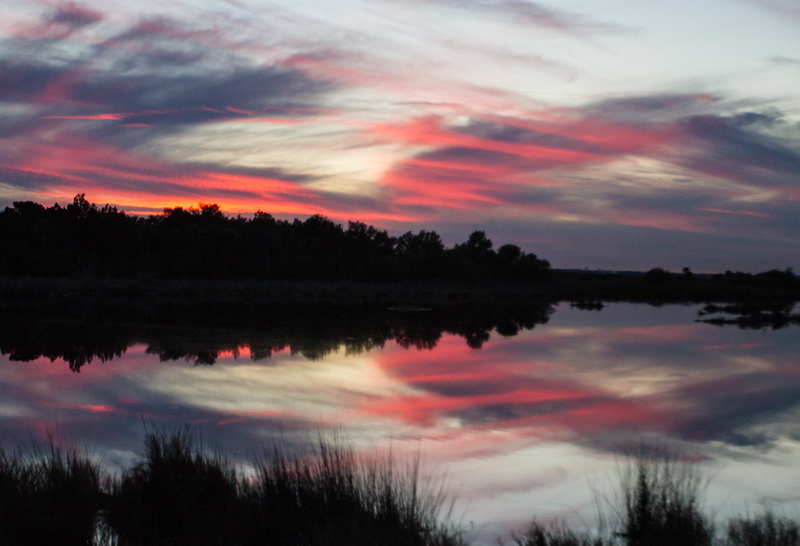 Conservationists joined the fight and the struggle went back and forth until the creation of the 720,000+ acre preserve in 1974. When planning the trip a few months ago, I learned about some unique lodging in an in-holding in Big Cypress – the cabins at the Big Cypress Gallery of famed landscape photographer, Clyde Butcher. 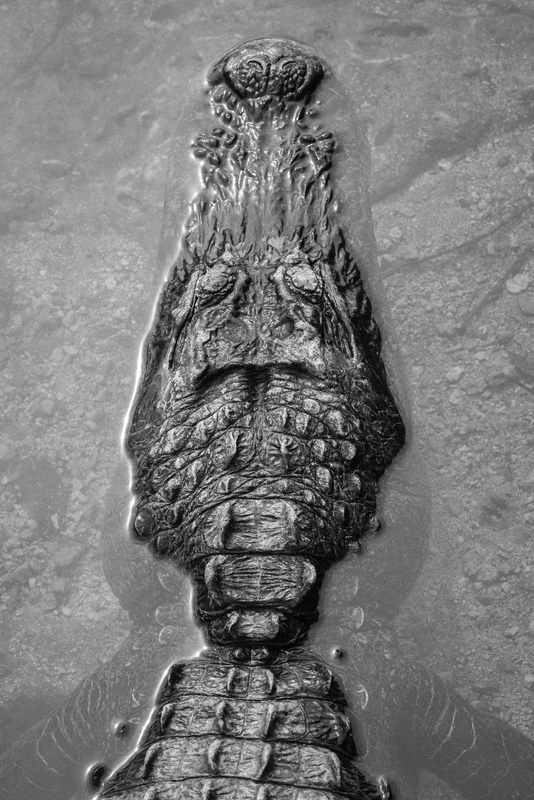 I have been aware of Clyde’s images for many years and he really is the Ansel Adams of the swamp. He is also an ardent conservationist, and has done a great deal to bring the beauty and plight of the region to the public’s attention. When I found out he had lodging in Big Cypress, I couldn’t resist booking it. 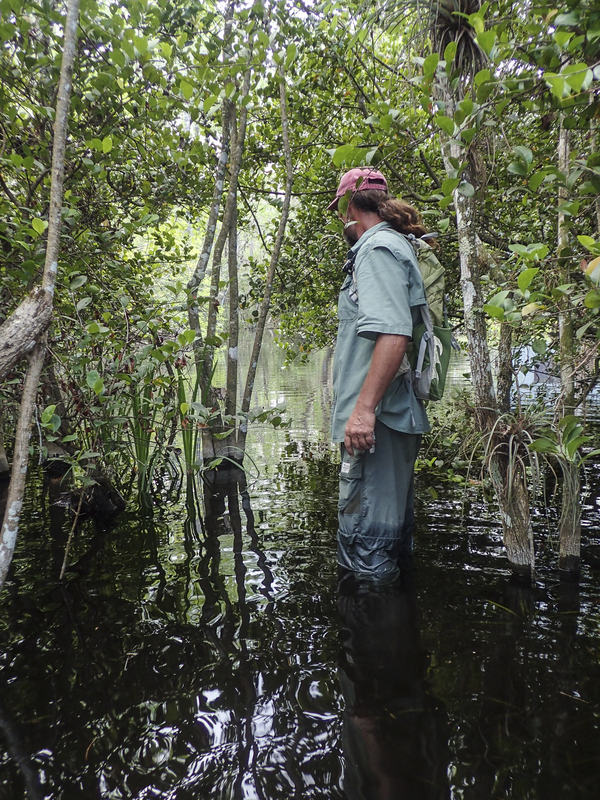 In addition to the wonderful accommodations and surrounding property, he offers guided swamp walks for a fee. Though it is a bit pricey, I am glad we did it. Our guide, Scott, is a wonderful person (as were all the staff we met) and very knowledgeable about the plants and animals of Big Cypress. The swamp walks usually take a couple of hours. 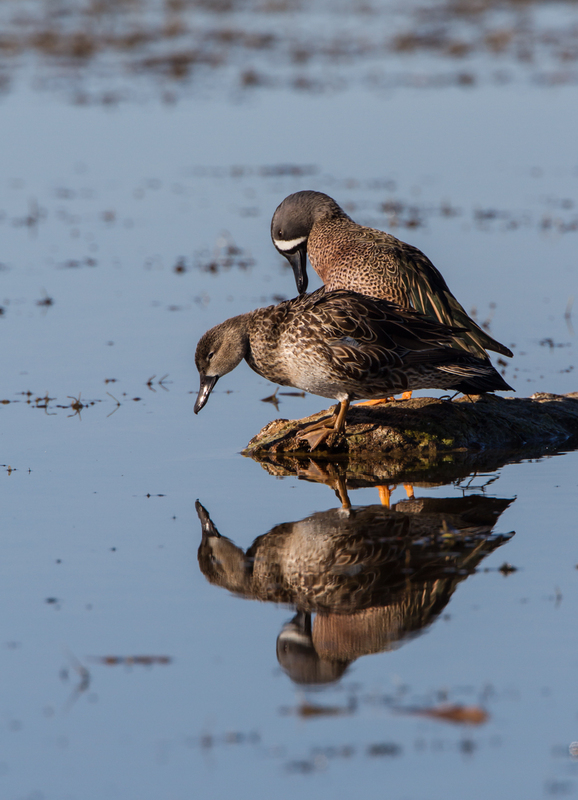 You walk with a sturdy hiking stick (they provide those) on a flooded trail behind the lodging that passes through a variety of habitats, including swamp, prairie edge, and dwarf cypress stands. There was both excitement and some slight apprehension when we began the hike, and I particularly liked Scott’s answer to the question, “how deep does it get”? He said this winter has been unusually wet, so the deepest part was 38 inches. Nothing like a precise answer! Of course, he is 6 feet 5 inches tall, so the deep water comes a little farther up on our bodies than it does on his. 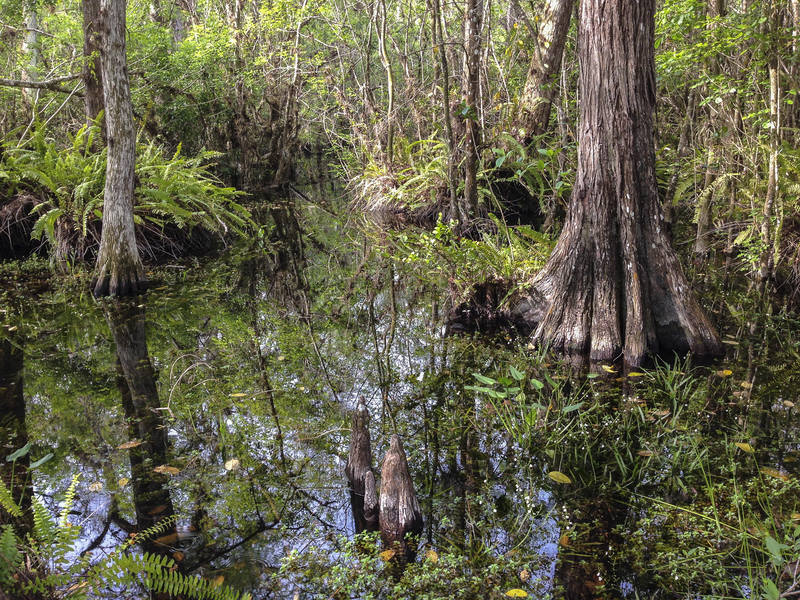 We walked at a slow pace, taking in all the sights, and sounds, that the swamp had to offer. The grunting calls of pig frogs were particularly evident here as they were elsewhere on our trip. And the diversity of plant life is amazing! At one point, the trail opened up into a mix of small cypress trees and grasses. Many of these trees are surprisingly old, stunted due to growing on the porous limestone bedrock of this particular part of Big Cypress. We saw relatively few animals until we got right to the end of the trail. 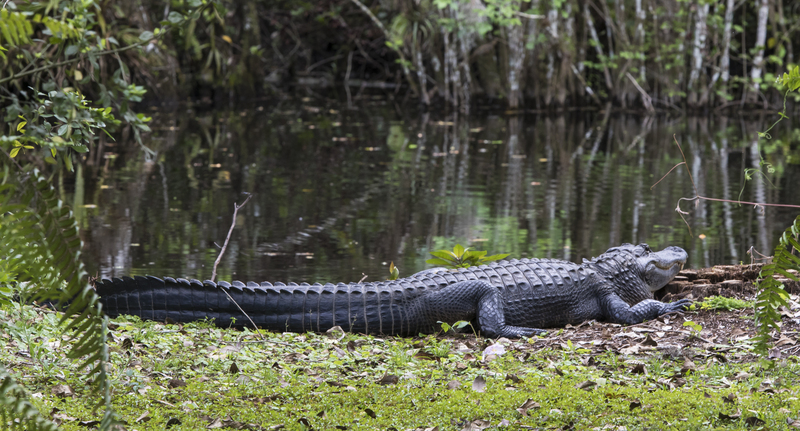 There, in a small pond behind one of the cabins, was a large female alligator (maybe 7 ft+ in length), along with several of her babies and a few 1 and 2 year old gators. She came over to greet us as we stepped out of the swamp onto dry ground, and hissed loudly to let us know we should not disturb her youngsters. Not to worry, we gave them a wide berth. and shouldn’t need to be reminded with signage:) We did all wonder what it must be like to live next to such large reptiles. I will admit, I scanned the surroundings with my flashlight more than usual when I went outside at night. 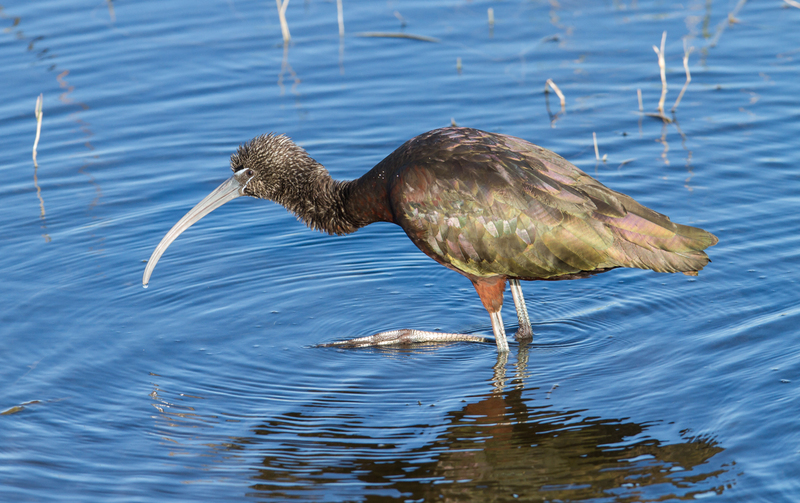 Neotropical migrant birds are beginning to appear in South Florida (and should be here in NC soon, if not already). 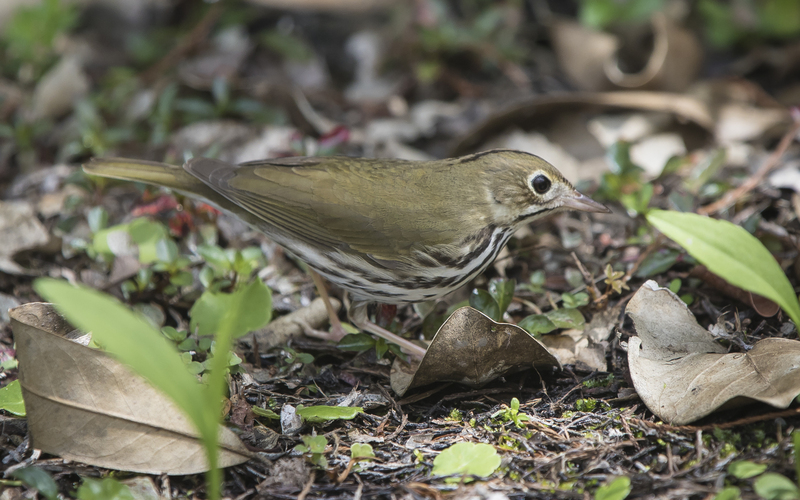 On a short walk at our lodging, I saw Northern Parula Warblers, Blue-gray Gnatcatchers, a Louisiana Waterthrush, Black-and-white Warblers, and several Ovenbirds. Our first full morning in Big Cypress was spent with Shurr Adventures on their sunrise kayak tour on the Turner River Paddle Trail. I had picked this group since they were highly rated online, and I saw they do Yellowstone tours in the summer (how could I go wrong with that combo?). It turned out to be a great choice. The kayaks were very stable, with comfortable seats, and the guide was very personable and knowledgeable. 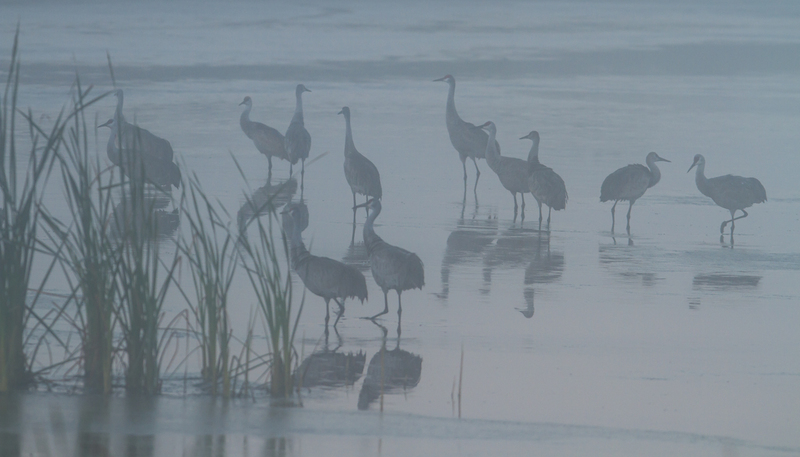 The morning started out foggy, and we saw, and heard, lots of wildlife. All sorts of bird life was active that morning, and the kayaks allowed us to get close to several species. When we headed south of the put-in point, we even got a pretty good view of one of my target species, a limpkin (unfortunately it was in thick vegetation , so not the best photo op). 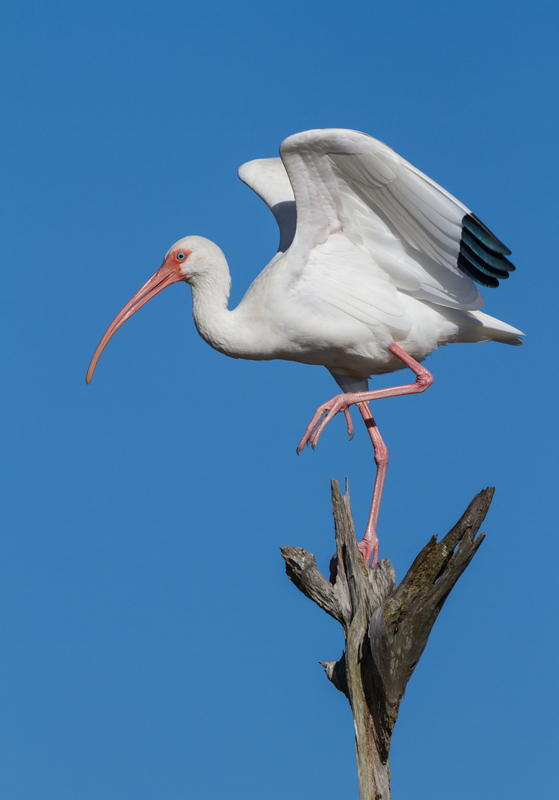 Florida is awash in exotic invasive species, both plant and animal. While paddling the Turner River, we were introduced to one of the more recent invaders, the island apple snail. 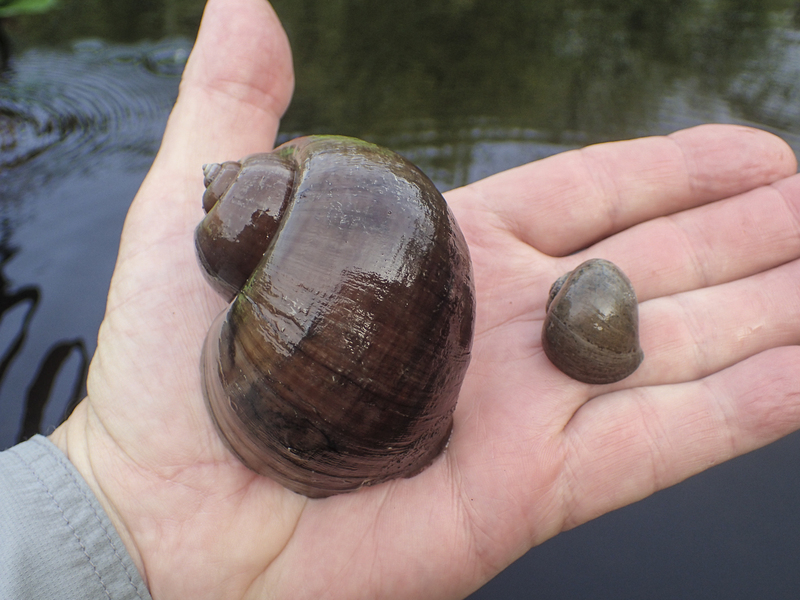 Believed to have been introduced by releases from the exotic pet trade, this, and a few other species of exotic apple snail, are creating real concern for scientists in the Everglades. 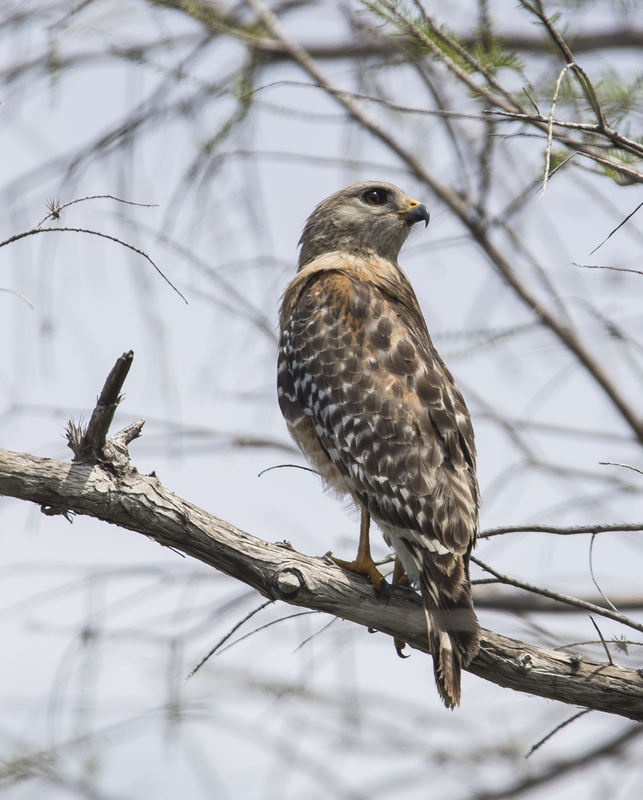 The native Florida apple snail, Pomacea paludosa, is much smaller than this invader, and is the primary food source for the endangered snail kite. 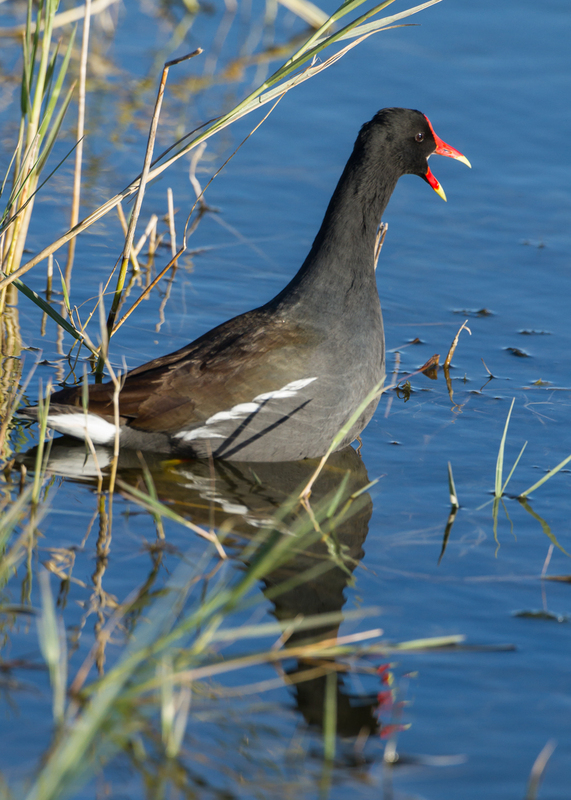 The larger size, fecundity, and voracious appetite of the invader snail, P. insularum, is cause for concern, both in terms of altering the wetlands plant community, and out-competing the native species of snail, with potentially disastrous results for the kite. 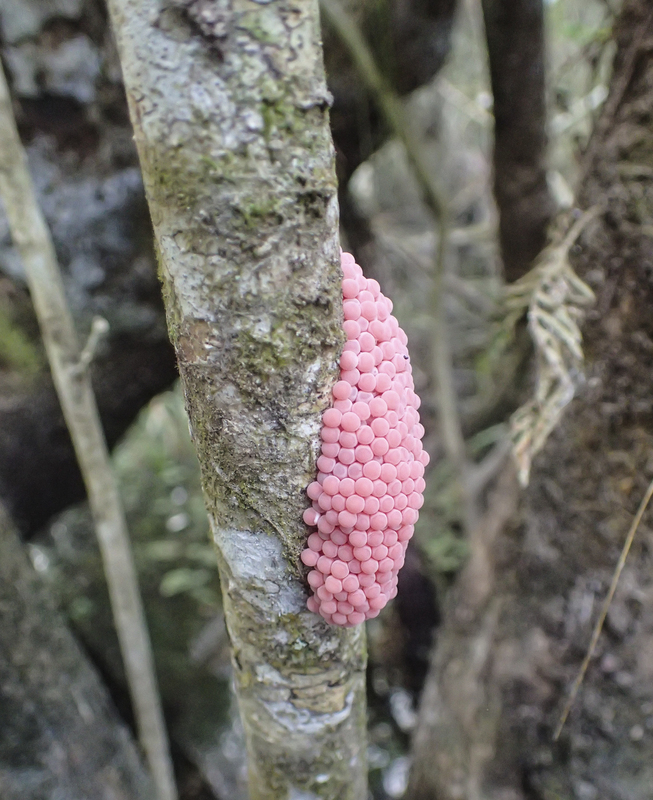 During our stay, I found one egg mass of a native apple snail, but we saw many egg masses of the invader, especially in the Big Cypress Swamp area. 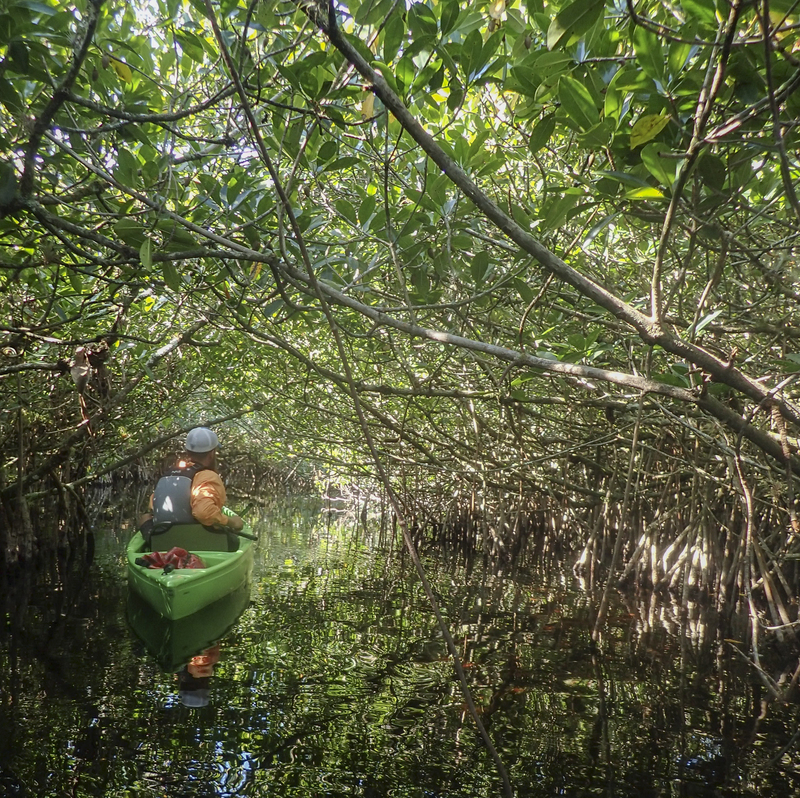 When we headed south of the Tamiami Trail in our kayaks, the plant community changed from a cattail fringed swamp forest to an expanse of red mangrove tunnels. Kayaking through the mangroves turned out to be a lot easier than paddling a canoe through them, like we had done at Nine Mile Pond, but you did need to break down the longer kayak paddle to avoid catching it on every prop root. After finishing our morning trip, we returned to Clyde Butcher’s place for some rest and exploration. 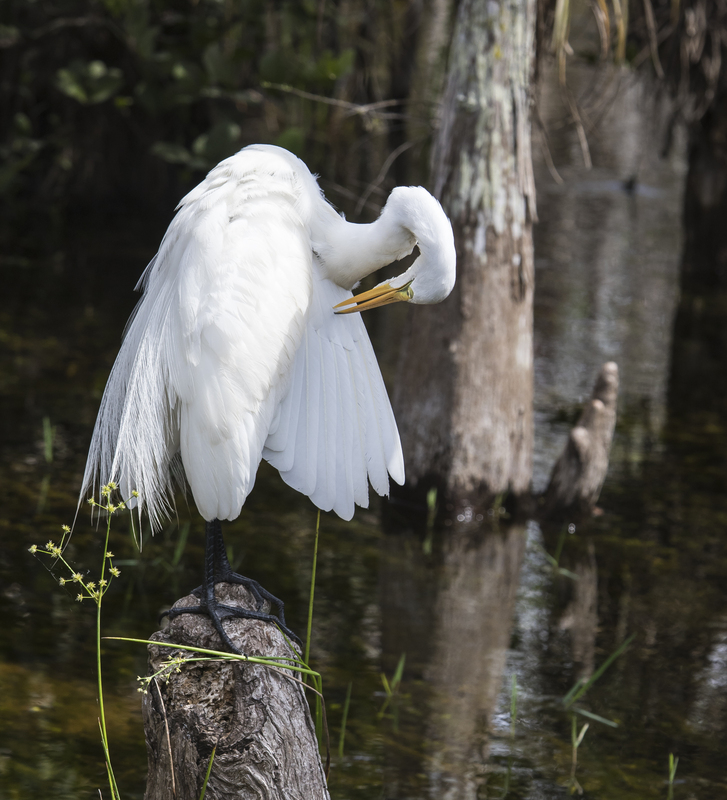 I drove out to scout our route for our final day in the area (a dirt and paved thoroughfare called the Loop Road), and came across all sorts of birds and a seemingly endless supply of alligators. If you have the time, I recommend the Loop Road as a leisurely pathway to observe some of the scenery and critters of Big Cypress. The entire wild region was a great way to relax before heading back to the hectic pace of Miami for our flight home. 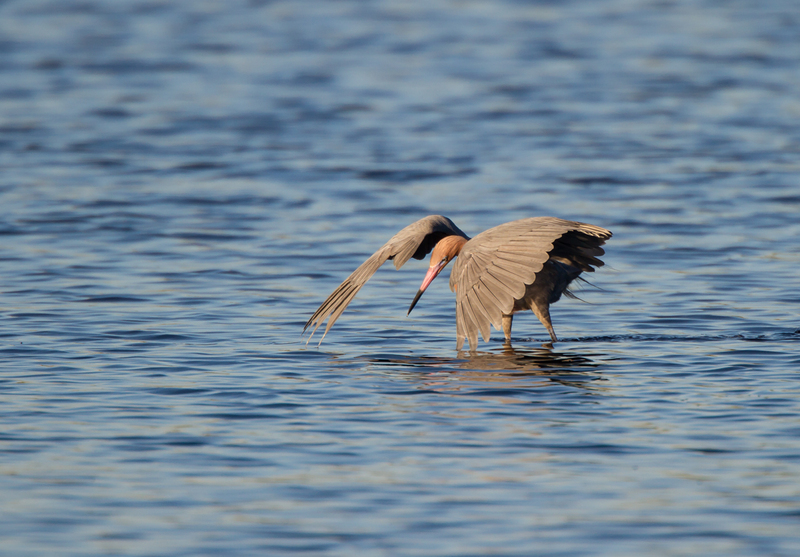 Below are some more images of our time in Big Cypress. I look forward to a return visit in the near future. 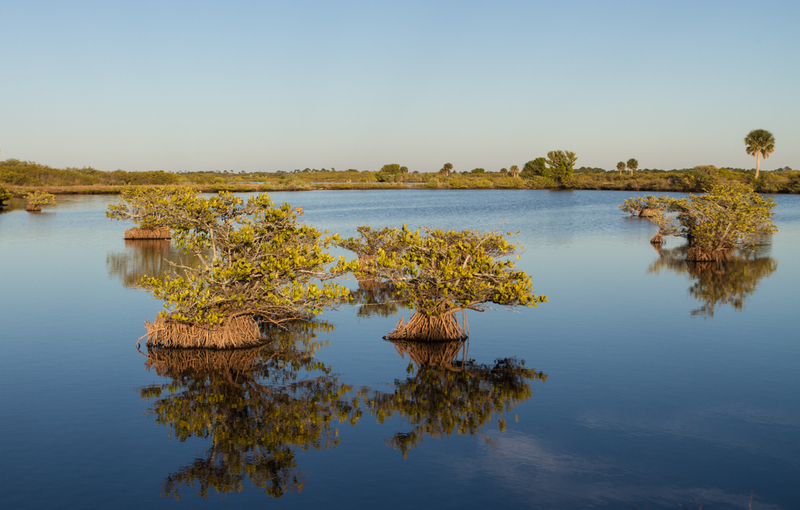 There are no other Everglades in the world. They are, they have always been, one of the unique regions of the earth, remote, never wholly known. 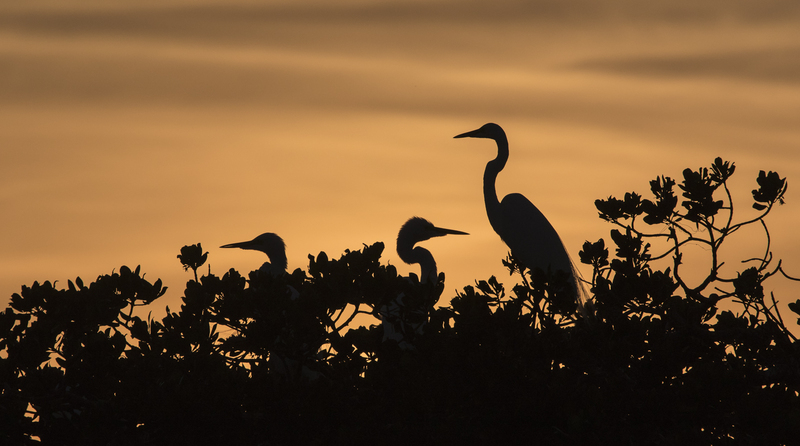 Sitting by the fire yesterday afternoon, I can hardly believe I spent last week in the Florida heat and humidity, in one of the most extensive wild places I have ever been – Everglades National Park. Years ago, I drove across the state on I-75 (aka Alligator Alley) going from Miami to Tampa Bay, but I had never been in the park. So, it didn’t take much convincing when a group of friends asked if I wanted to join them on a trip. After flying into Miami (and getting a bit lost trying to get out of the city), it is a relatively quick drive through extensive farm fields, of every imaginable type of crop, to the sudden transition to the park. 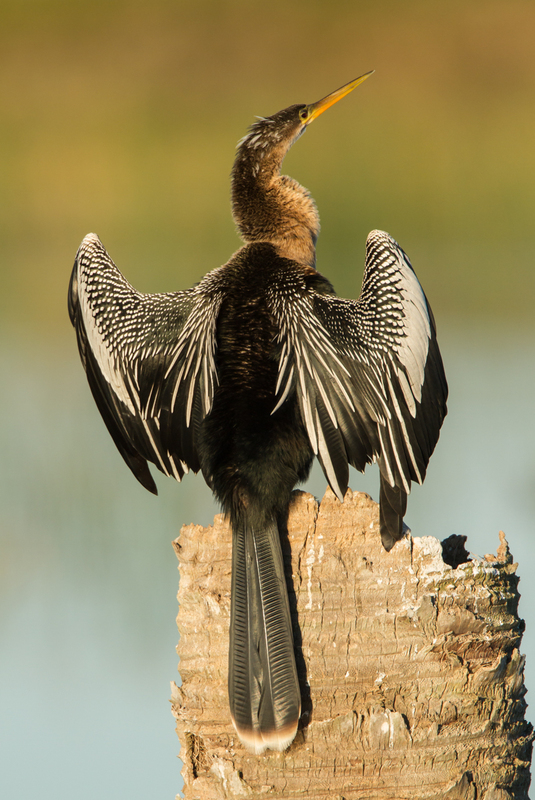 Our first must-see stop was the famed Anhinga Trail, on the east side of the park. It is not far from the entrance and is said to be one of the best places to see some of the park’s iconic wildlife up close and personal. And even though it was crowded with visitors (and, I am happy to report, several school groups), it did not disappoint. 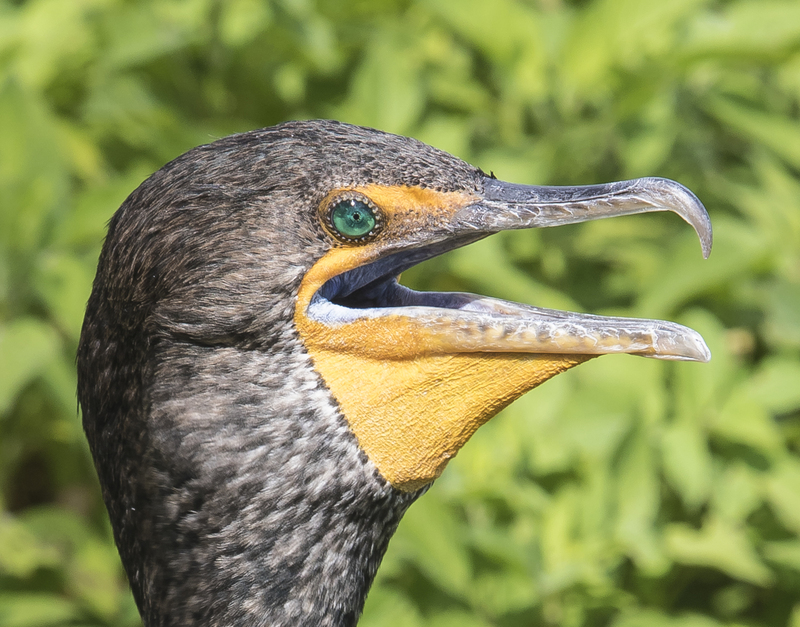 After spotting an alligator near the trail head, we walked by a double-crested cormorant, standing right next to the paved trail, and panting in the 80+ degree heat. I shot several close-up photos before moving on. I must admit, I always love seeing their emerald green eyes. This bird was so close to the trail, and seemingly so unafraid, that it also allowed me to appreciate the delicate feather pattern on its back. 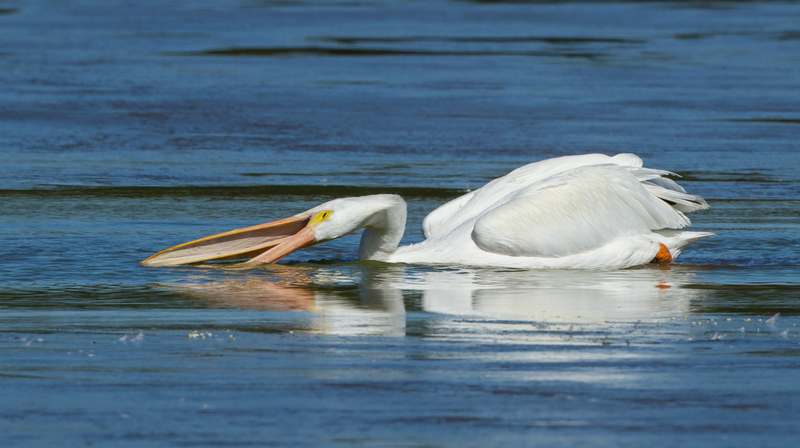 A few feet further along, a very tame great egret was hunting in a culvert that passed under the paved trail and spearing small fish. 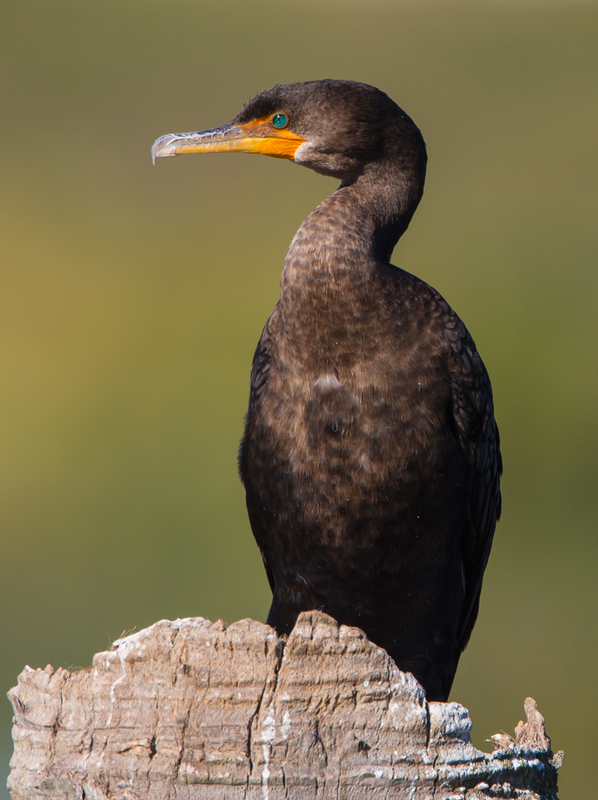 This time of year is the start of their breeding season and these elegant birds undergo a dramatic color change on their face – the lores (the skin between the eye and bill) turns from the usual yellow to a chartreuse green, and the bill changes from yellow to blackish-orange. 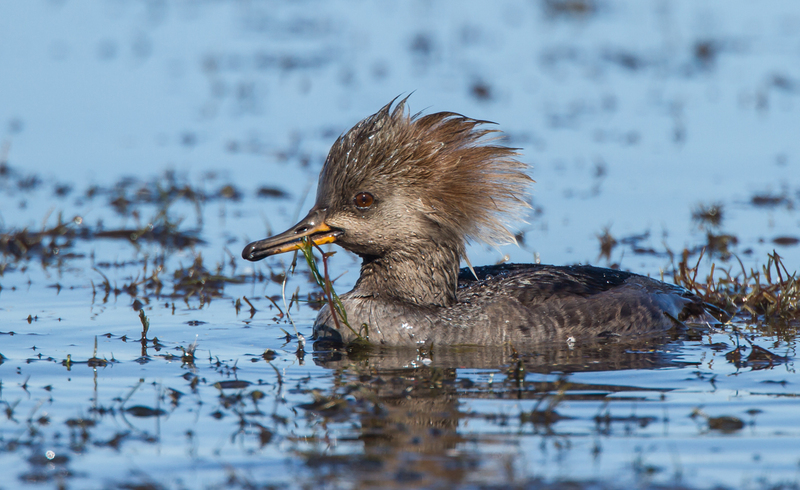 They also develop long nuptial plumes, called aigrettes. 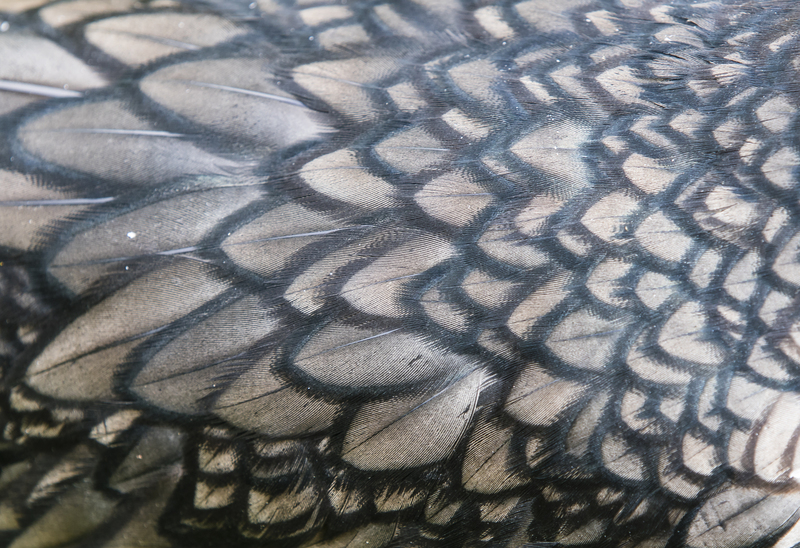 These elegant feathers almost led to the extinction of egrets by plume-hunting in the early 20th century, when the feathers were used to adorn ladies’ hats. 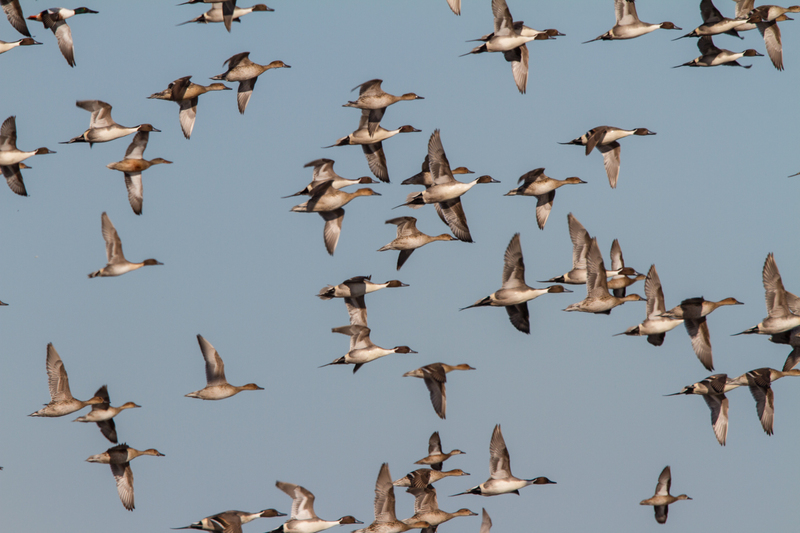 Luckily, conservation efforts helped stop the demand and the birds have recovered over much of their range. 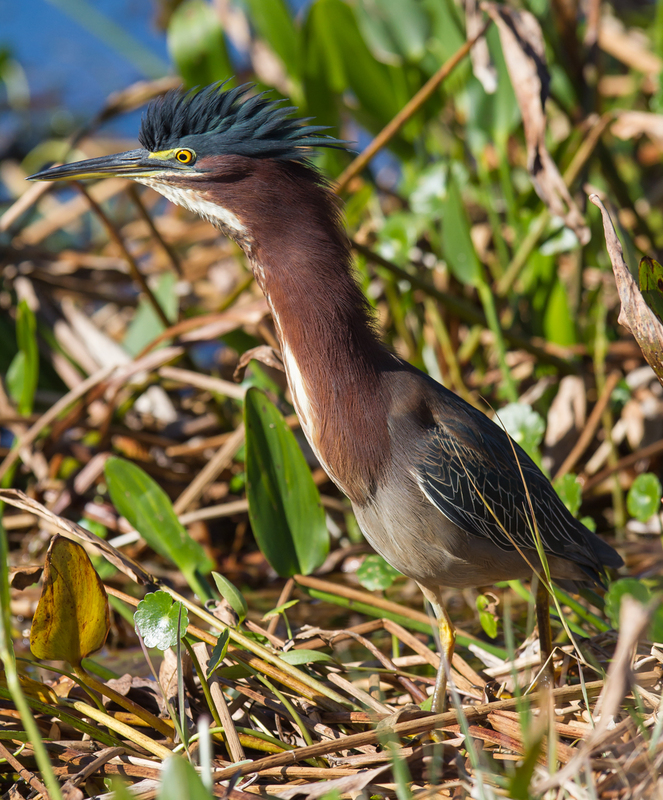 Walking out on one of the boardwalk sections, we spied numerous green herons, some more alligators, and the trail’s namesake, an anhinga. 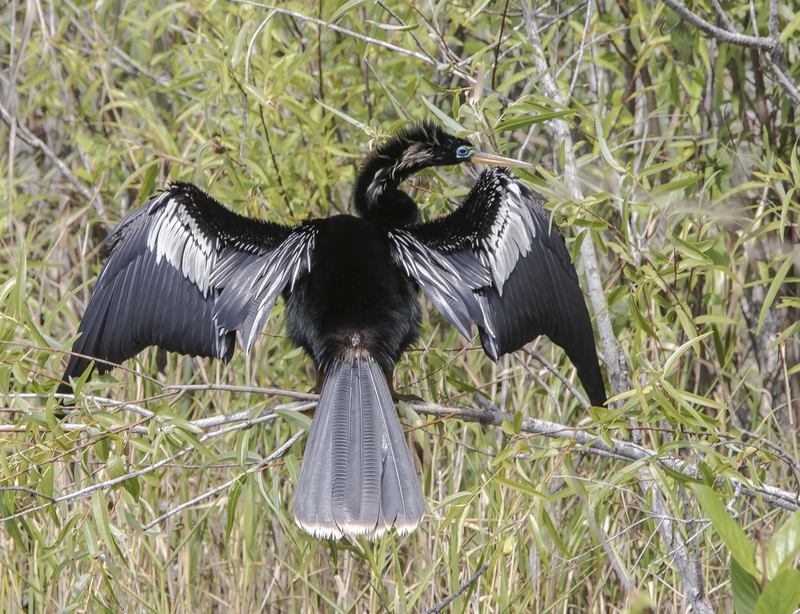 Anhingas are oddly beautiful birds that go by other names such as water turkey (their tail does resemble that of a wild turkey) and snake bird (for their habit of swimming with just their neck and head above water). 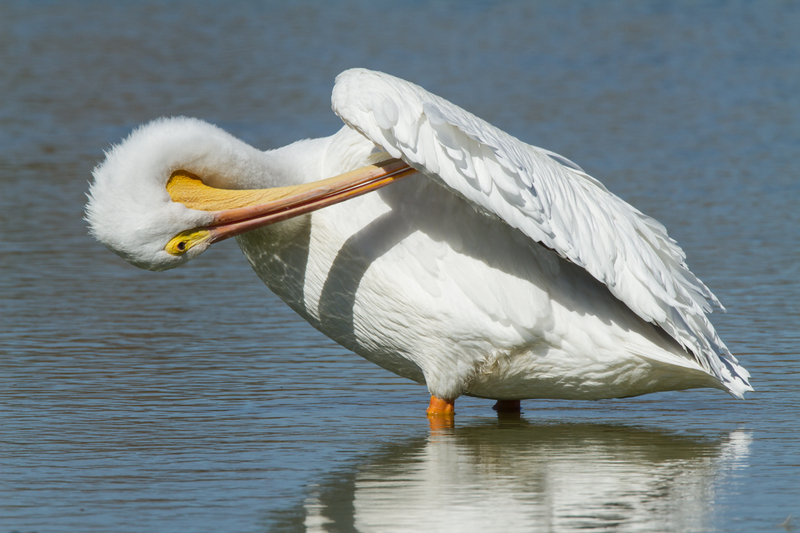 This wing spreading behavior is to allow them to dry their feathers after swimming for their favorite prey, fish. 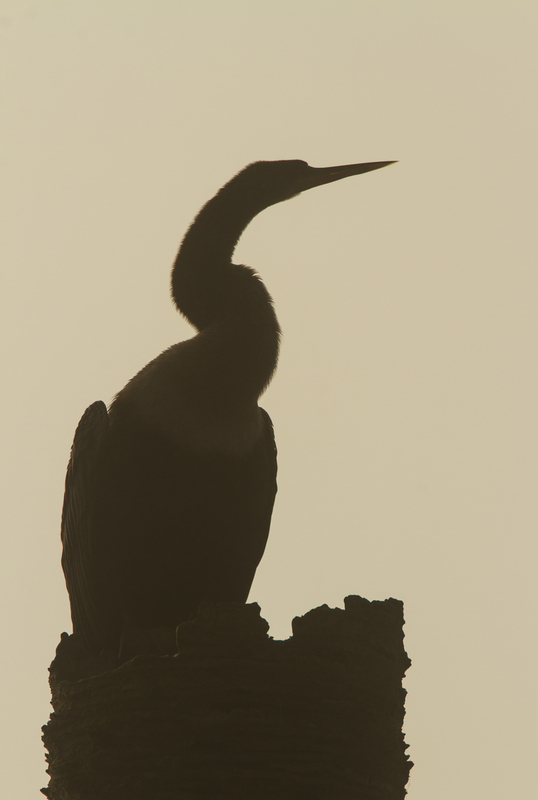 Anhingas and cormorants are primitive birds that lack the oil glands to waterproof their feathers that other water-loving birds possess. 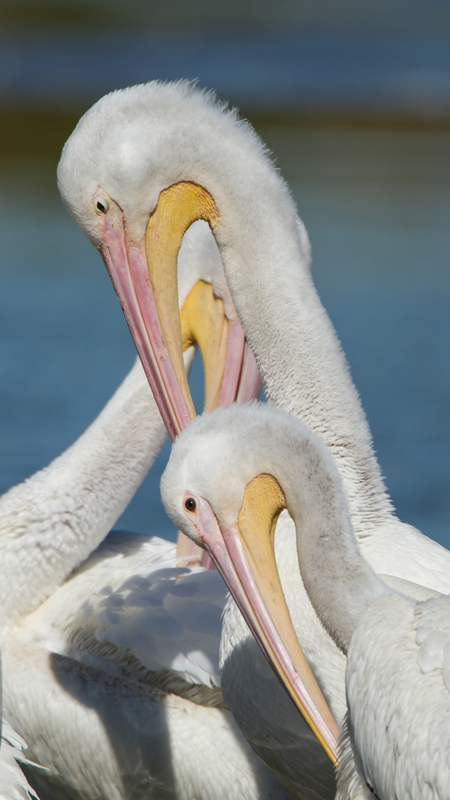 During the breeding season, the skin around their eyes turns a bright blue. 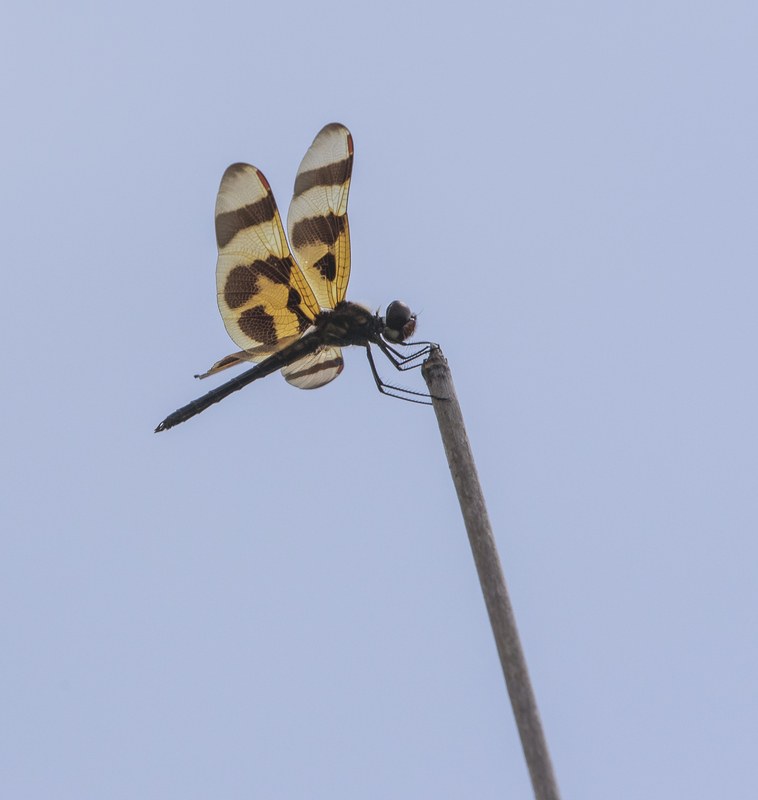 Probably the most common flier we saw was not a bird, but a species of dragonfly, the Halloween pennant. 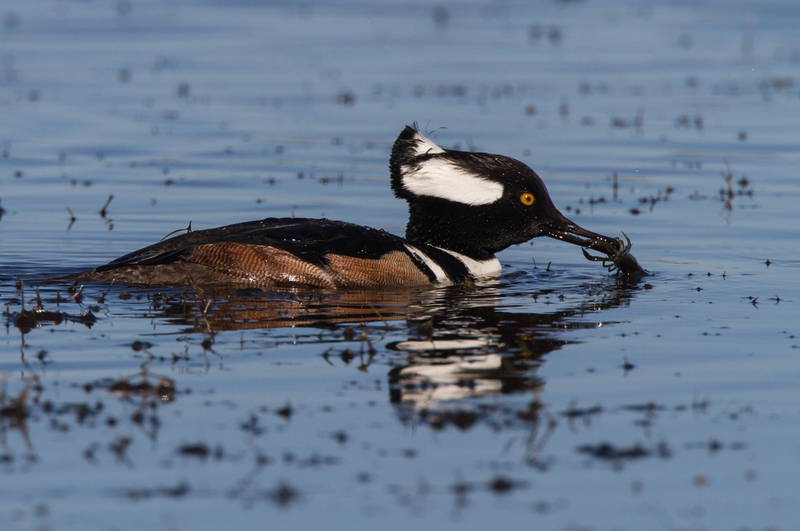 It is easily recognized by its distinctive wing colors – orange with dark splotches and bands. 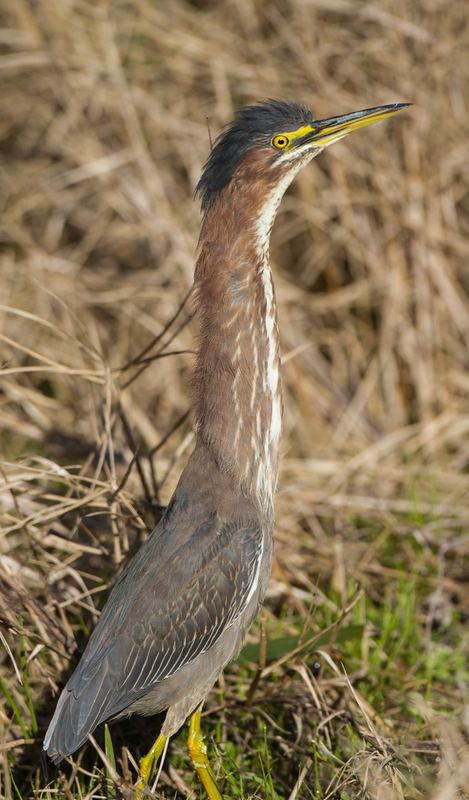 It is often seen perched atop vegetation, swaying in the wind. 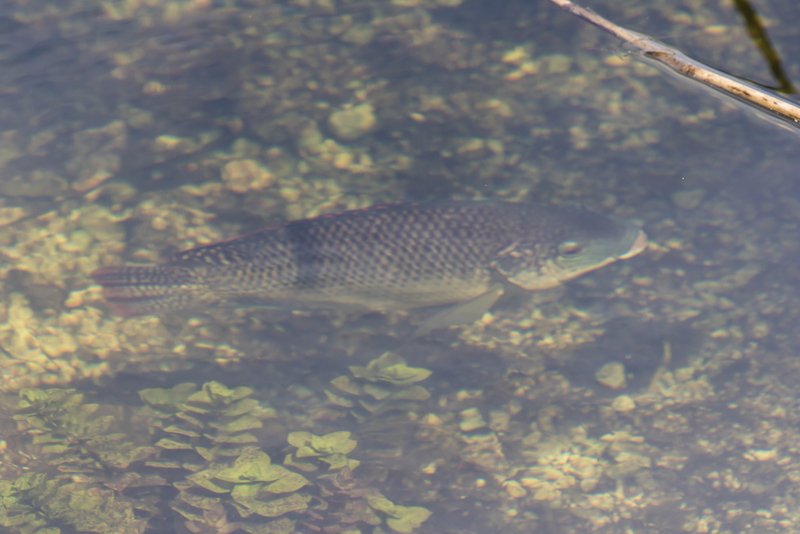 The clear water allowed us to see many species of fish along the canals and pools throughout the park. 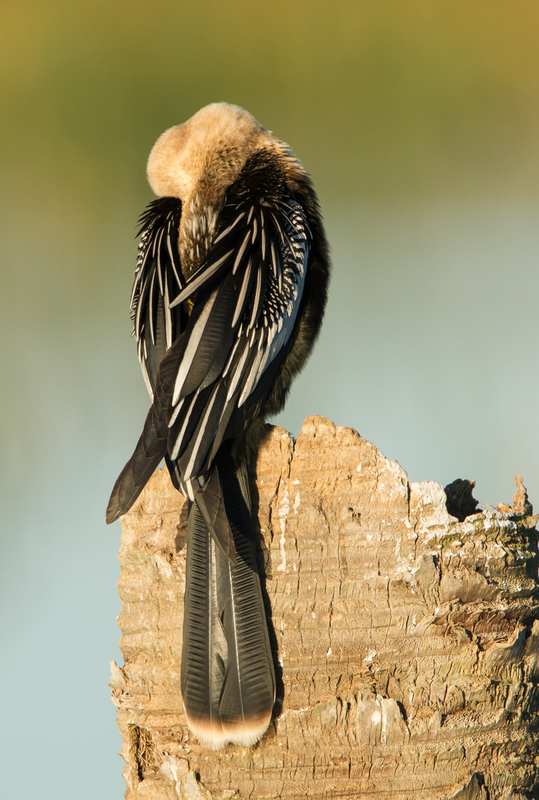 At the Anhinga Trail, one of the most common was baffling at first. It turned out to be an introduced exotic, the blue tilapia, native to Africa and the Middle East. These fish were everywhere in the canals and their large excavated nests were clearly visible in the dark water. 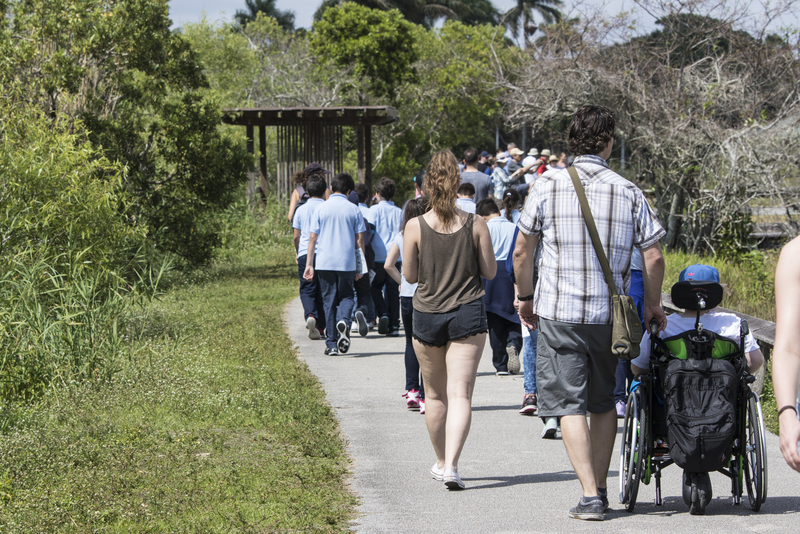 South Florida is, unfortunately, a haven for all sorts of exotic plant and animal species. 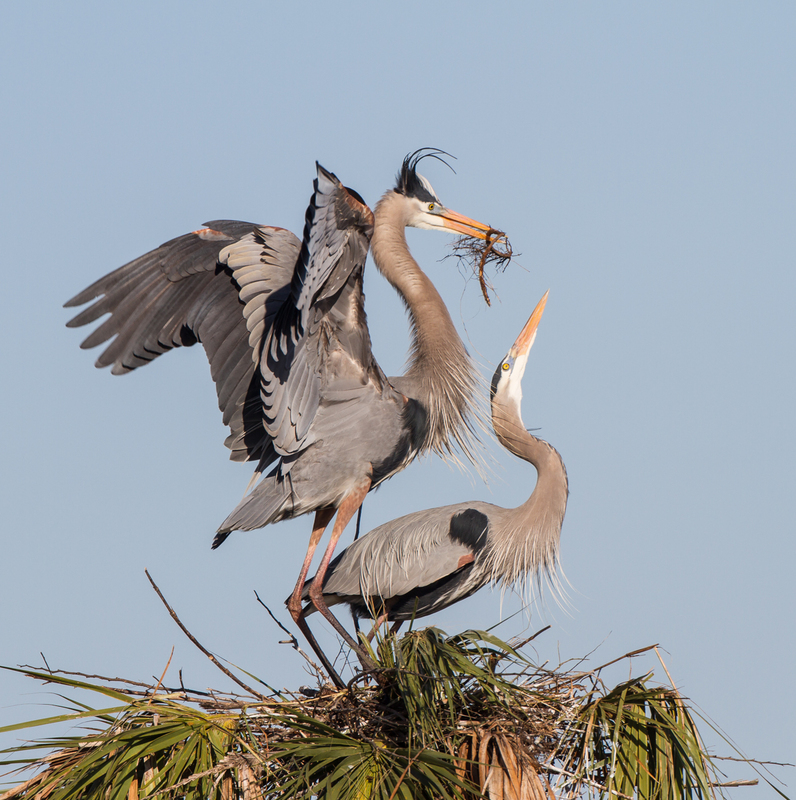 A few native fish species are also very abundant and easily observed including largemouth bass, various species of sunfish, and Florida gar. While many of the birds and other wildlife are species that I found familiar, many of the plant species in this portion of the park are more tropical in origin, but were vaguely familiar from my museum trips to Belize years ago. One we saw throughout our travels is the bizarre strangler fig, Ficus aurea. 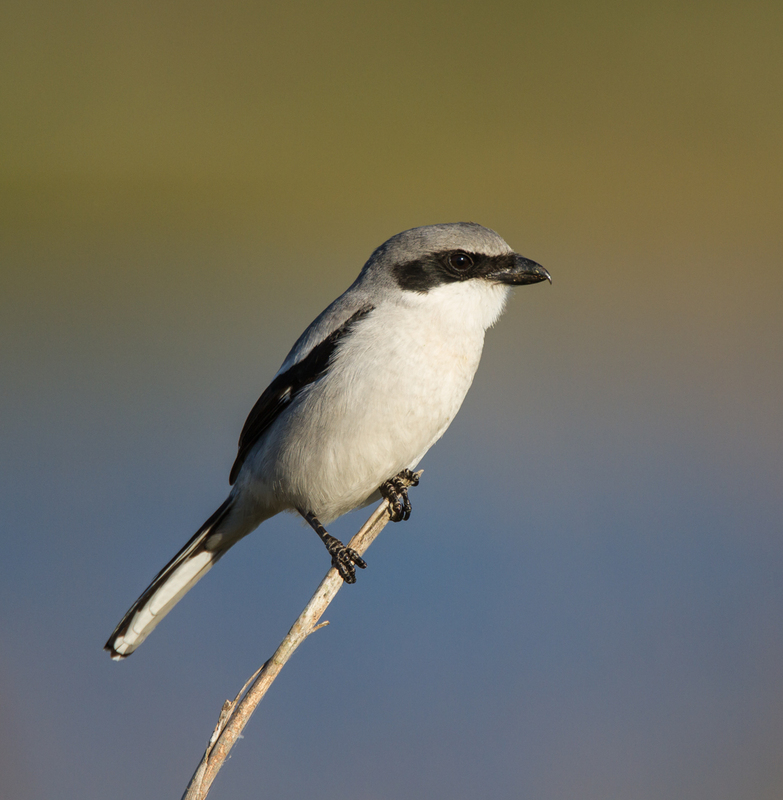 The life cycle starts when a bird or other animal eats the fig fruit and deposits the sticky seed on the trunk of another tree. 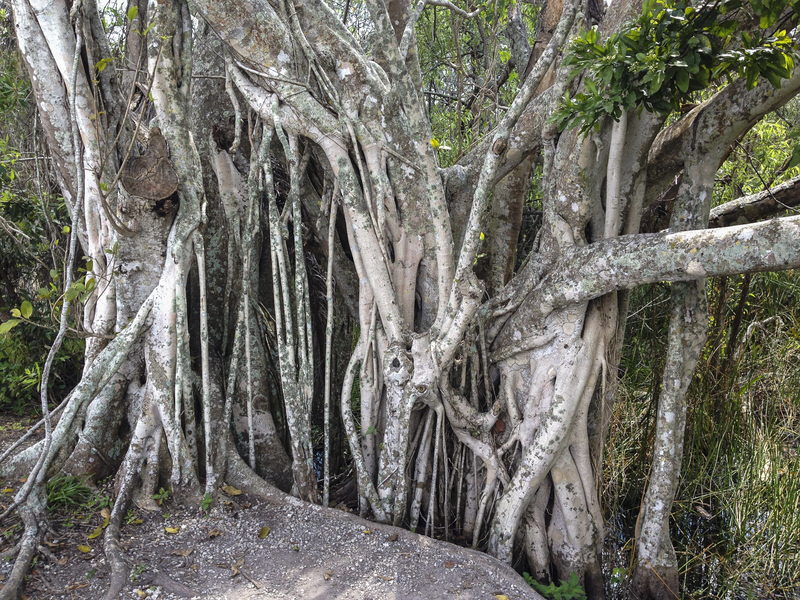 The fig often begins as an epiphyte, but soon sends roots twining down the trunk of its host to reach the soil. It then grows to the top of the host, sends down aerial roots, and leafs out in the crown of the tree, shading out the leaves of the host plant. The fig continues to develop its crown and root system, often completely enveloping, and eventually killing, the host tree. 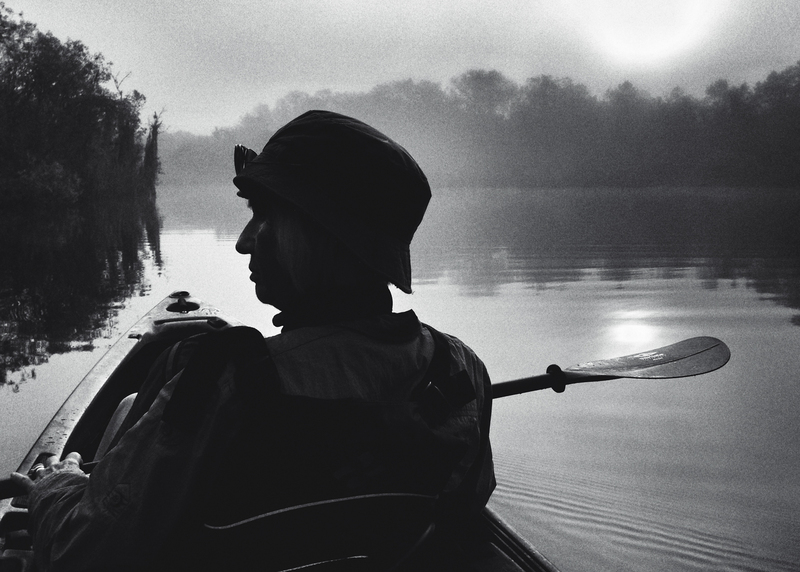 On our second morning, I had arranged a ranger-led canoe trip at Nine Mile Pond. 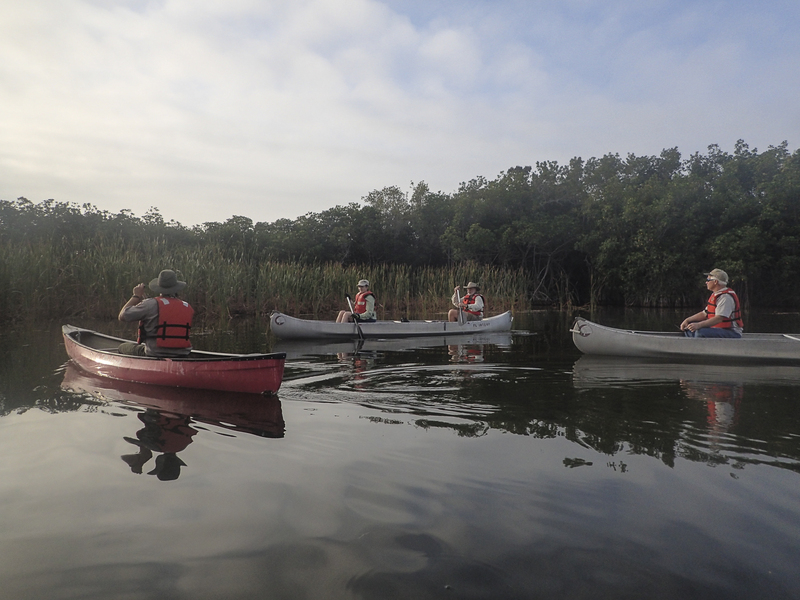 We had 6 canoes, plus the ranger, on a 4 hour paddle through mangrove tunnels and marshes. 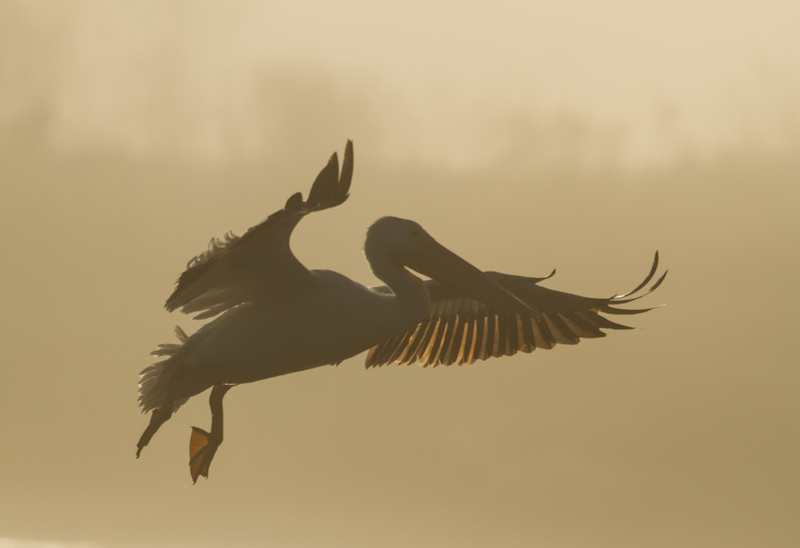 We started with a fantastic sunrise and enjoyed numerous alligator sightings, a gentle breeze that helped with the rising heat, and blue skies punctuated by white puffy clouds. 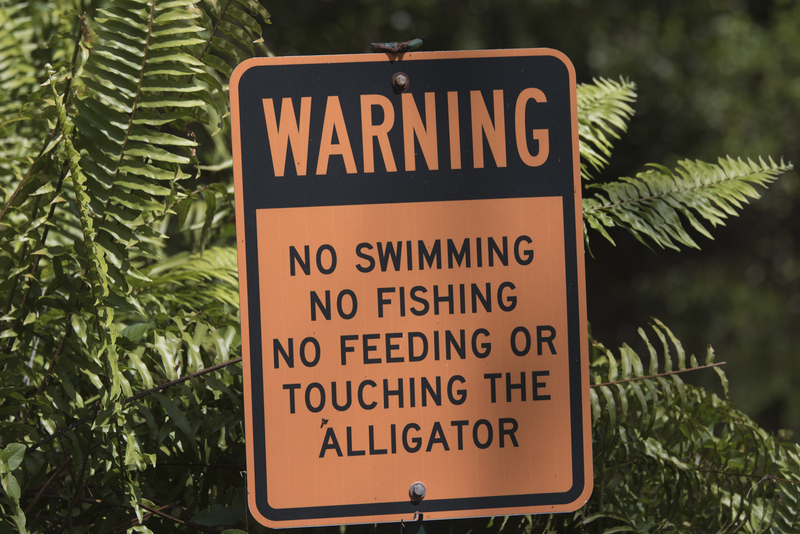 The highlight for me was some serious alligator bellowing at one of our stopping points. 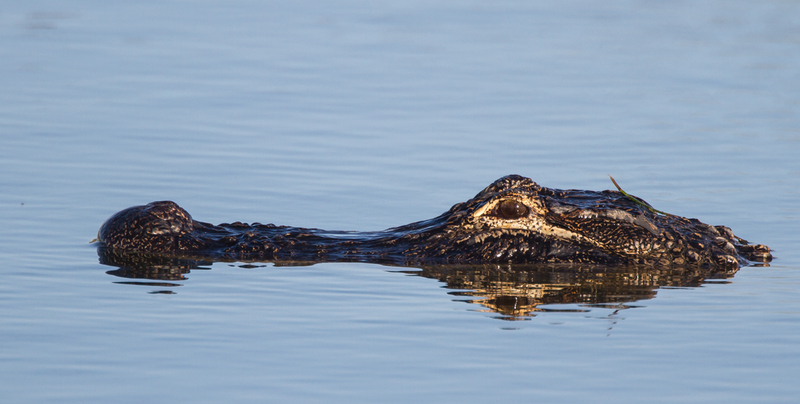 It is the start of the gator breeding season and the big bulls bellow to attract a mate. It is one of the most impressive wild sounds in the southeast, reminding me of a roar of a lion or a bison bull. Can you find and identify the three bird species in this tree? The road through this section of the park ends at Flamingo, a small enclave along Florida Bay with a marina, visitor center, and cafe. We spent time here on both of our first two days, enjoying the breeze and the abundant bird life. 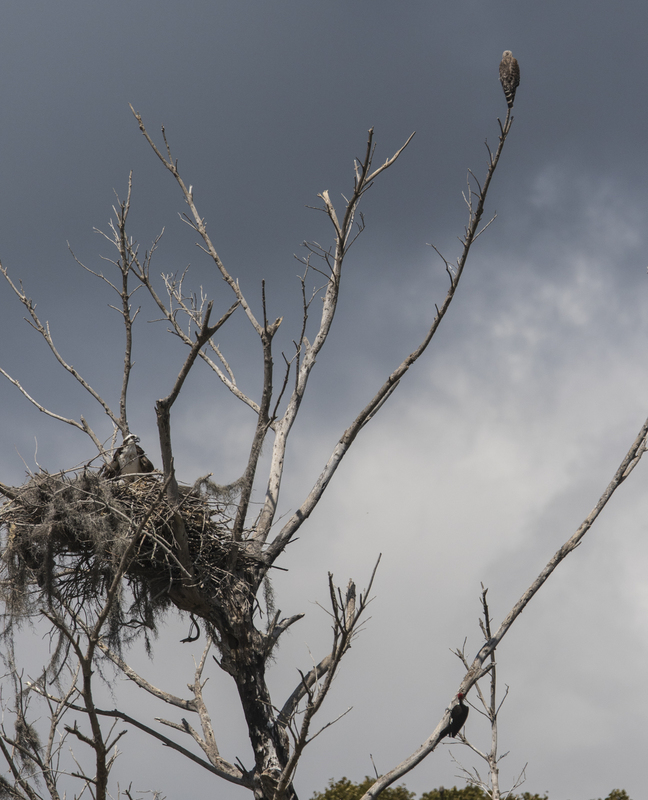 Osprey nests dotted the trees, mangrove islands, and man-made towers. 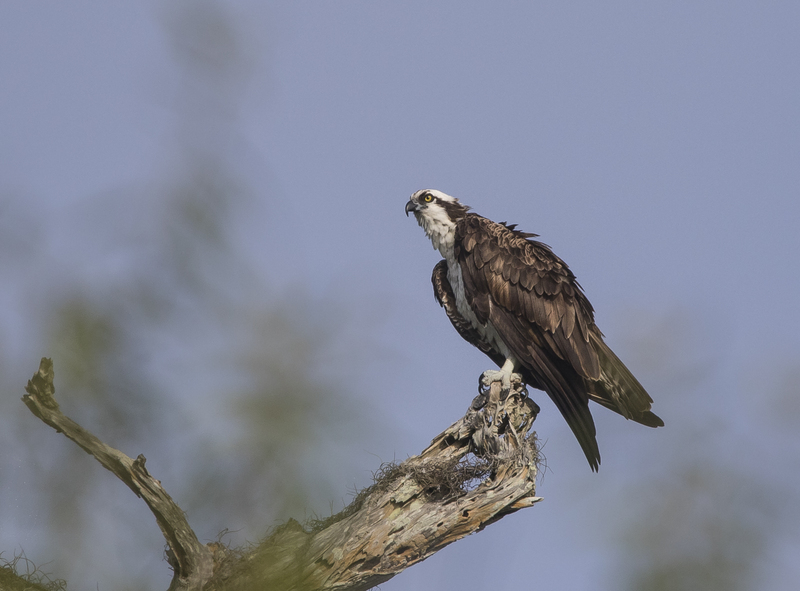 At one point there were three great bird species in a tree near the parking lot – an osprey in its nest, a red-shouldered hawk, and a pileated woodpecker. 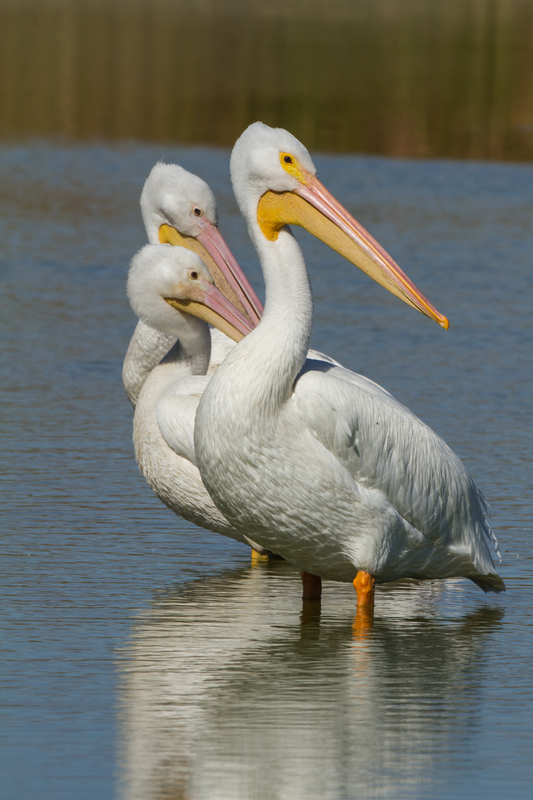 Out in the Bay, we spotted American white pelicans, white ibis, brown pelicans, black skimmers, and numerous gulls, terns, and shorebirds. 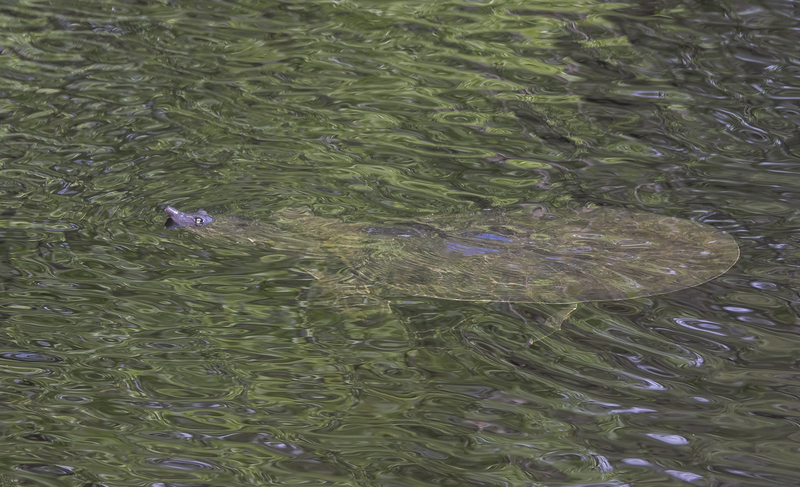 And, on a stroll to the marina (without my camera, unfortunately), we had great views of a huge American crocodile (this is the best place in the park to see this rare reptile) and four manatees. Needless to say, Flamingo is well worth the drive. 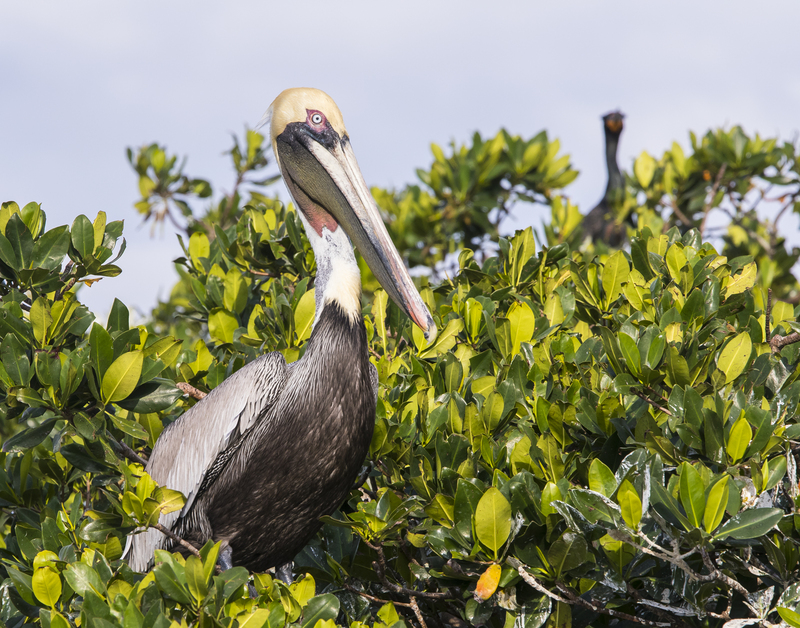 When I started planning the trip, I bought a copy of Exploring Everglades National Park and the Surrounding Area (A Falcon Guide), and it proved a valuable asset in choosing which of the many trails and boardwalks to visit in our brief stay. One of the highly recommended stops is the Pa-Hay-Okee Trail. 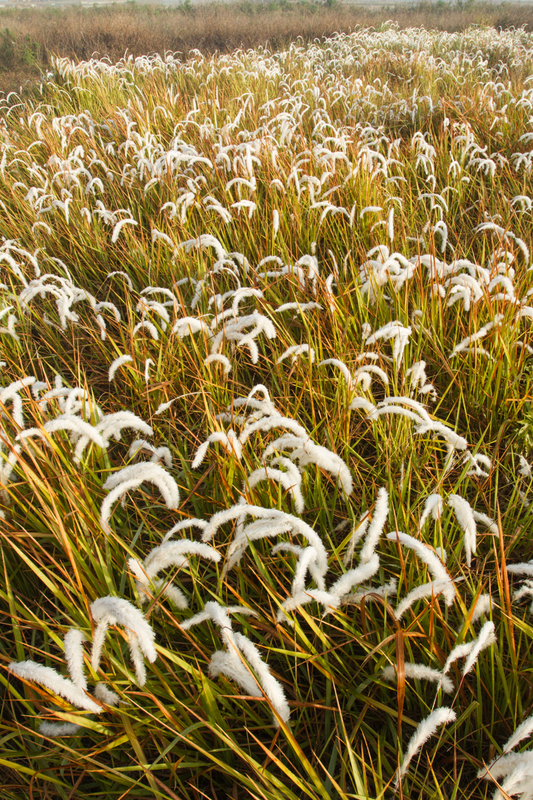 The name is derived from a Seminole word meaning “much grass in water”, a reference to the vast saw grass prairies that make up much of this region. 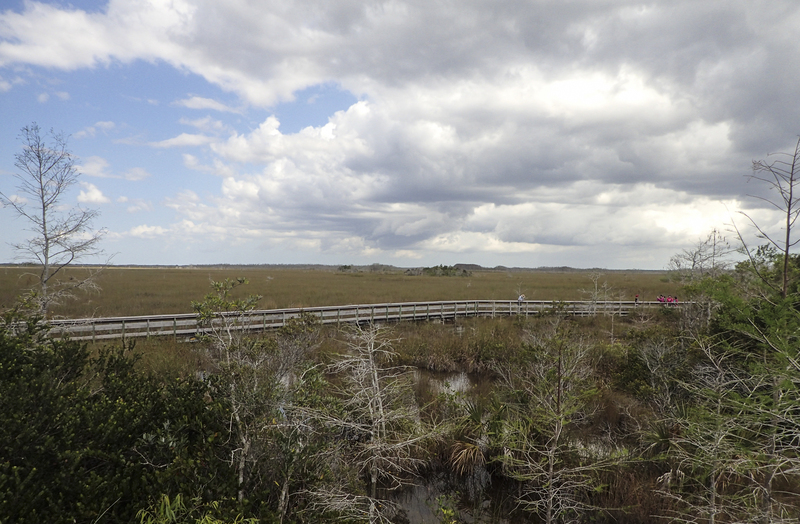 There is an elevated section to the boardwalk which gives an incredible view of the “river of grass” that is the lifeblood of the Everglades. Another must-see stop is Shark Valley. We arrived mid-morning and drove right in (there can be considerable wait times to get in on busy days – but you can drop your riders off and park along the main road outside the entrance and walk back in). 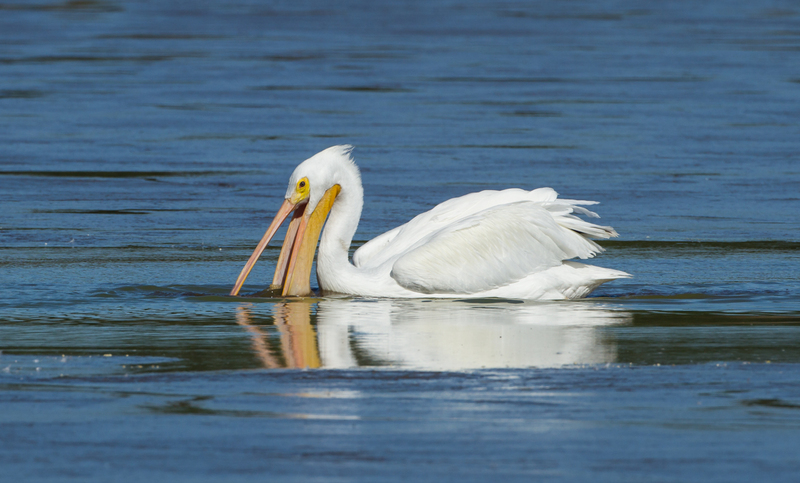 There is a small visitor center, restrooms, a few picnic tables and a 15-mile paved trail (accessible by walking, bicycling, or taking a concession-operated tram tour) through the saw grass prairie. 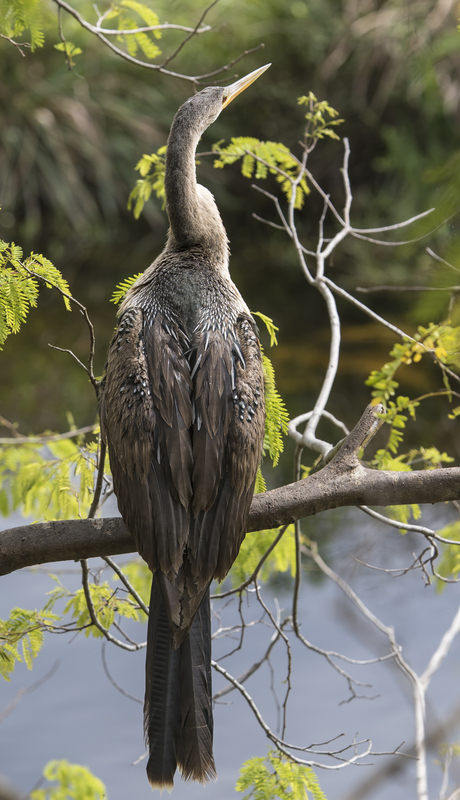 Along the trail is a canal that retains water even in the dry season, concentrating wildlife such as alligators and wading birds, for easy viewing. 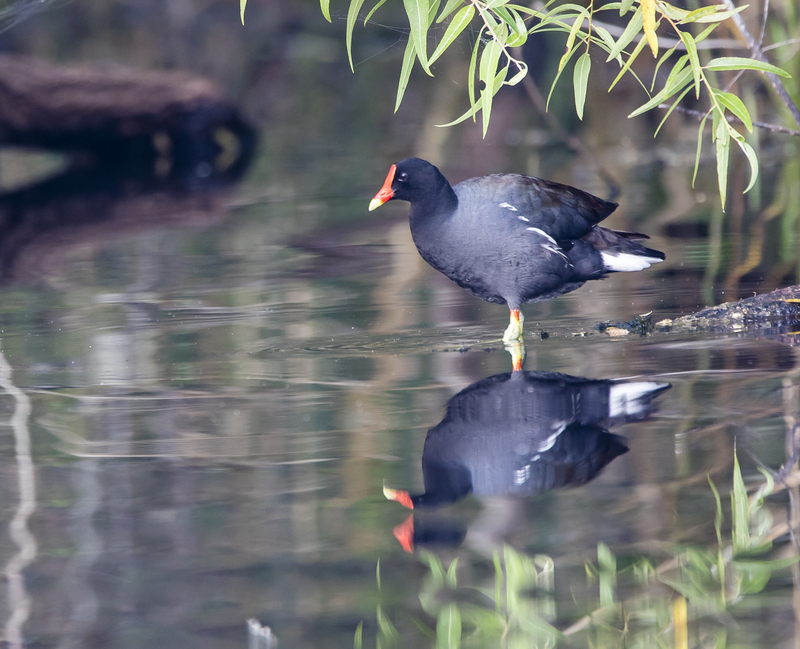 Even though this winter has been an unusually wet one, which has caused much of the wildlife to remain dispersed throughout the vast wetlands, there were still plenty of things to see as we walked a short distance along this easy path. 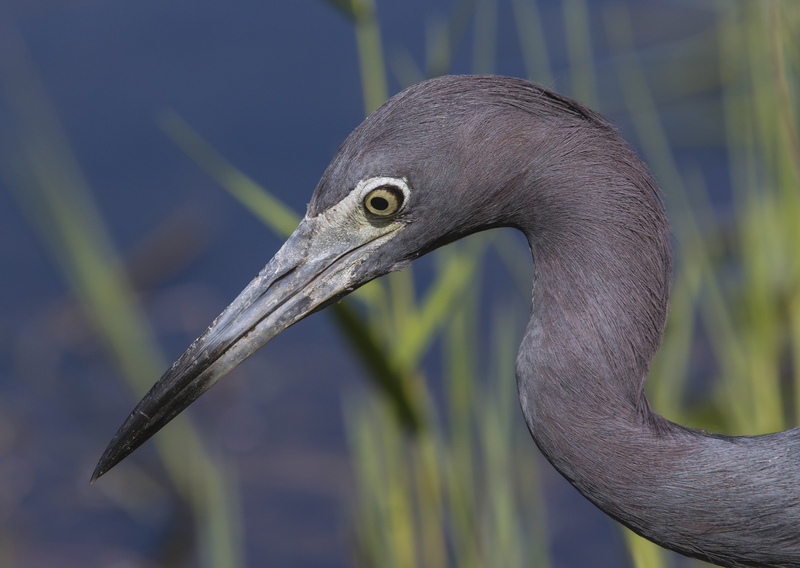 A little blue heron hunted patiently within a few feet of the walkway, periodically snapping up tiny fish and gulping them down. 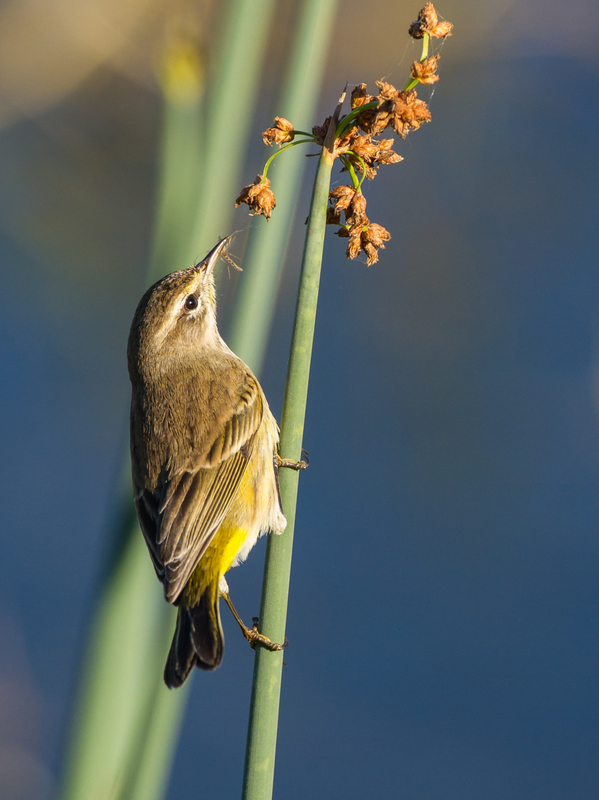 Several species of warblers and other songbirds were seen and heard in the thickets along the canal (especially the ubiquitous white-eyed vireo). 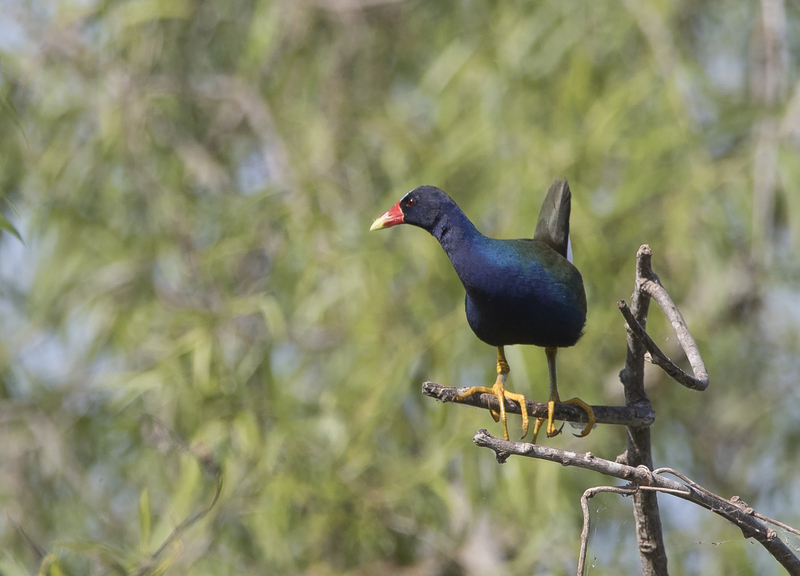 And we finally caught a glimpse of one of the “specialty birds” of this trail, a purple gallinule. 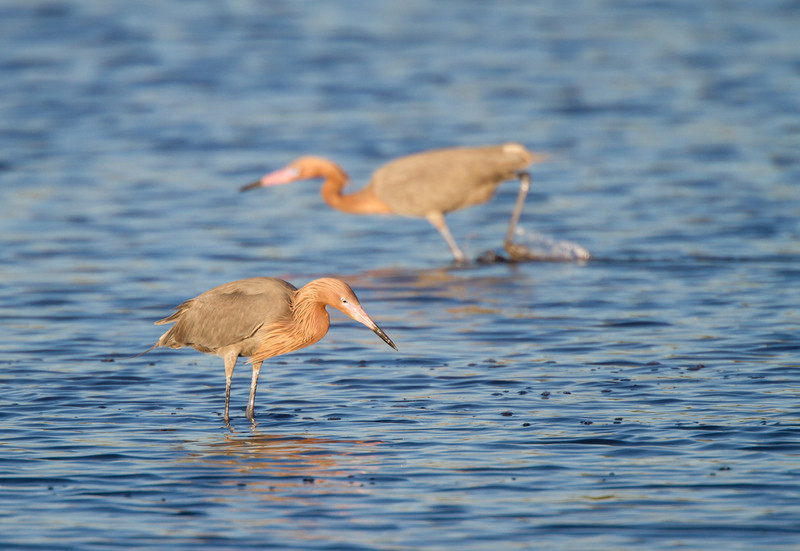 These brightly-colored members of the rail family feed on a variety of plant material and invertebrates. 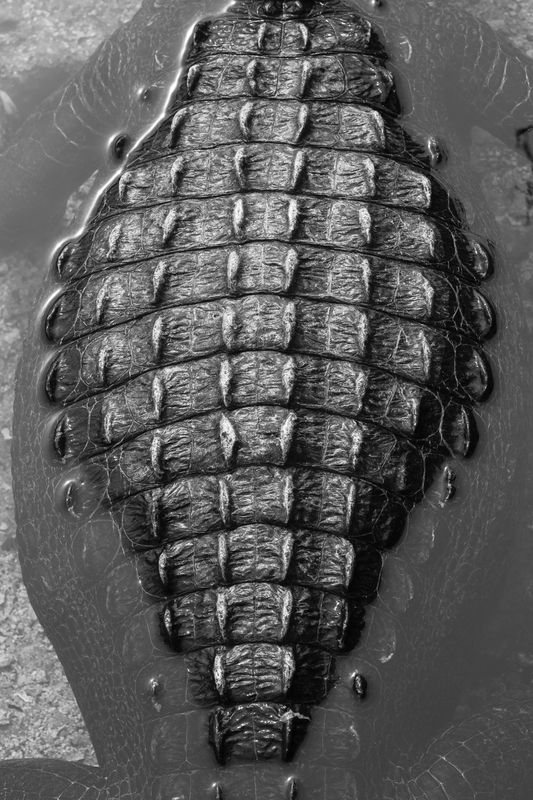 Their enormous feet are useful for clinging to shrubbery and walking on floating vegetation such as lily pads. Alligators were all along the canal, and we even had several baby alligators sunning themselves on lily pads. 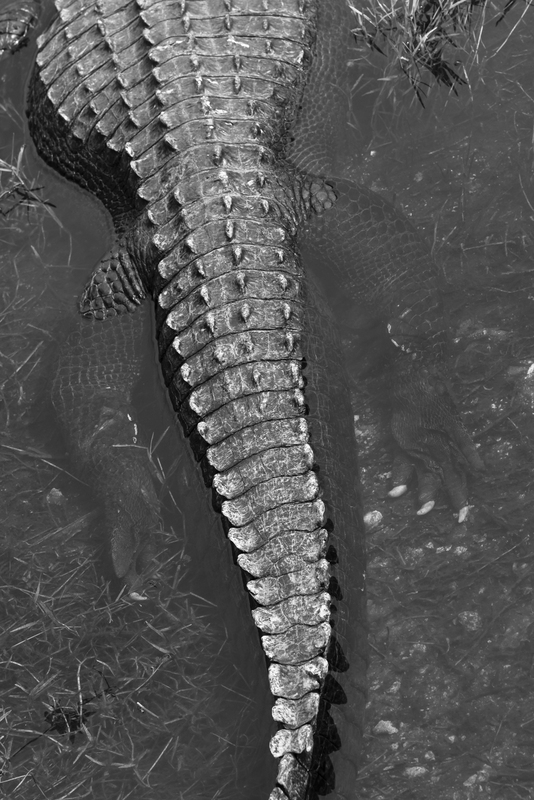 One walked across the pavement, as people stopped and wondered where the usually protective mother gator might be hiding and watching her brood. After a brief stay at Shark Valley, we headed out of the park and to our next destination, Big Cypress National Preserve. I feel like I only scratched the surface of the Everglades experience. It is the third largest national park in the continental United States at 1.5 million acres and is one that lies just outside the major metropolitan areas of Miami and South Florida, and the huge agricultural lands that provide food for countless Americans. 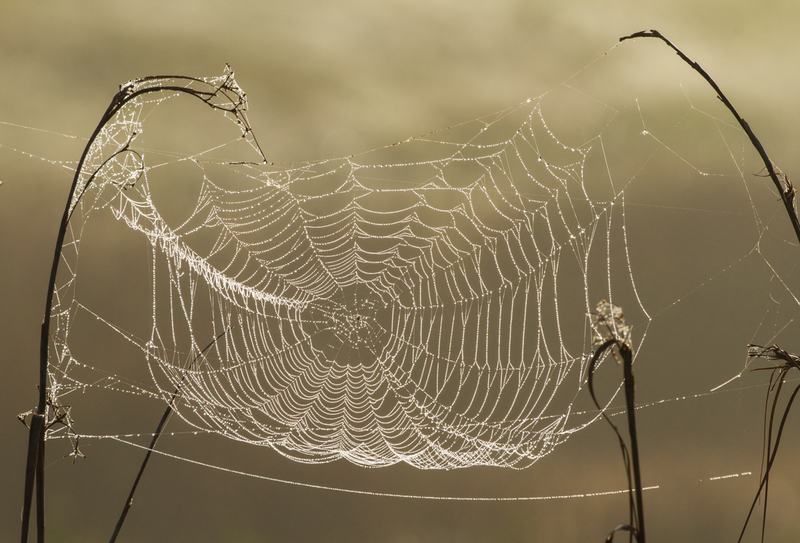 Even though the park represents a large portion of land, the ecosystem is highly altered from its original condition. 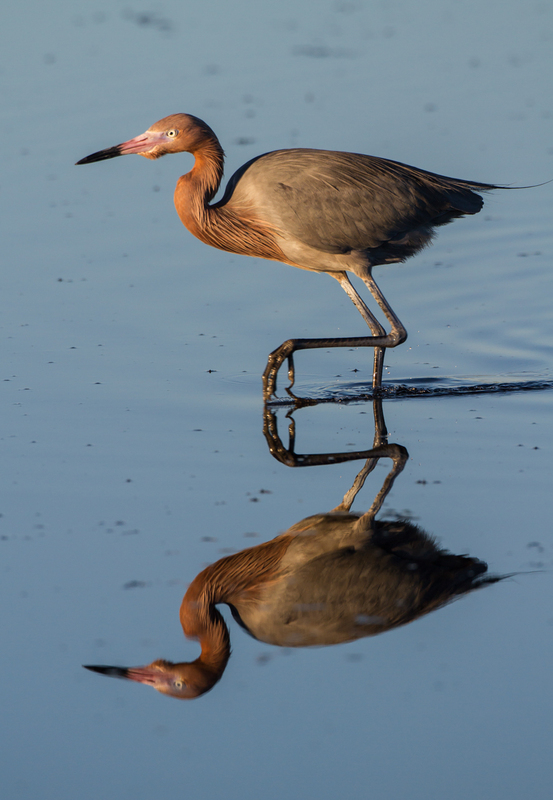 Roads and drainage canals have greatly reduced the flow of water from lands north to Lake Okeechobee, and agricultural chemicals are impacting the water quality. 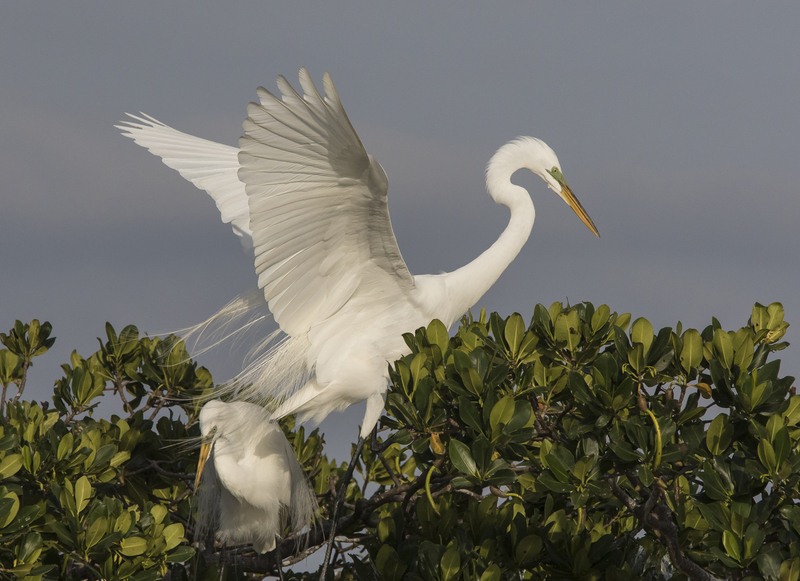 But, the Everglades still present a wild side of Florida that people need to experience. 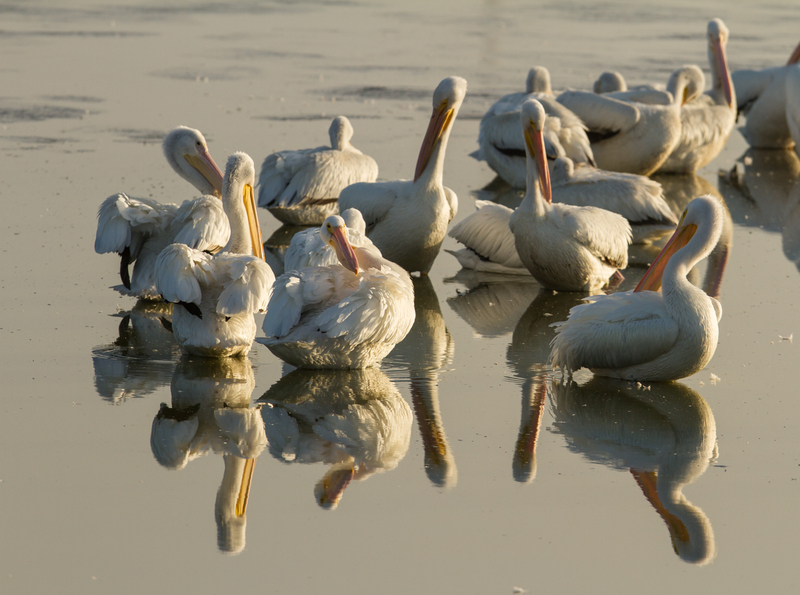 A visit to this park helps you understand why we must all continue to work together to protect out public lands and the incredible diversity of life that call them home. 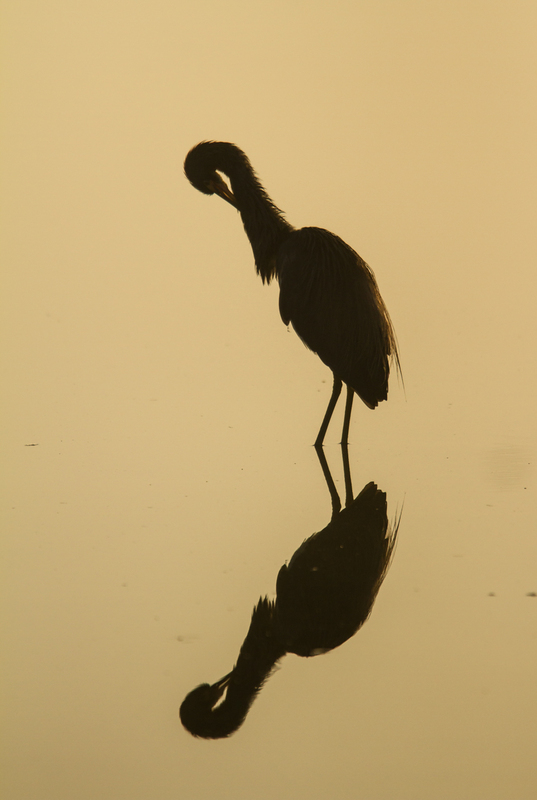 I admire herons, herons of all sorts. 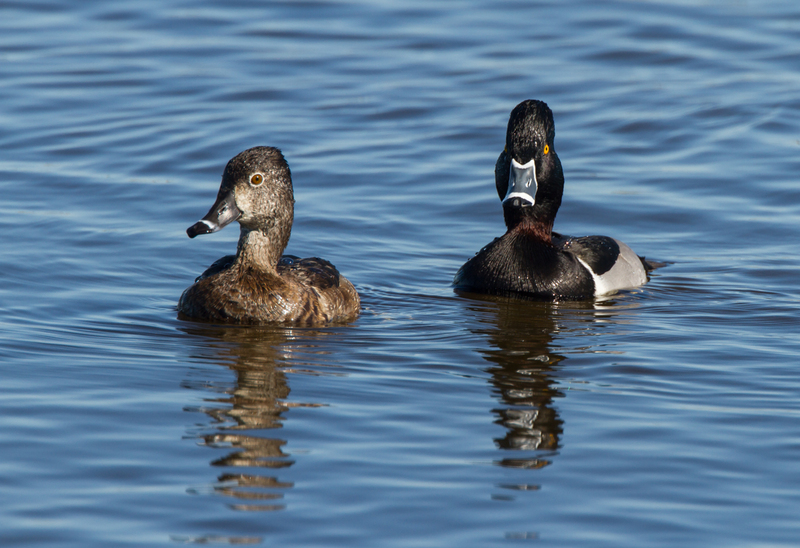 They have a stately posture, epitomize patience, and have bright eyes that can stare down anyone. 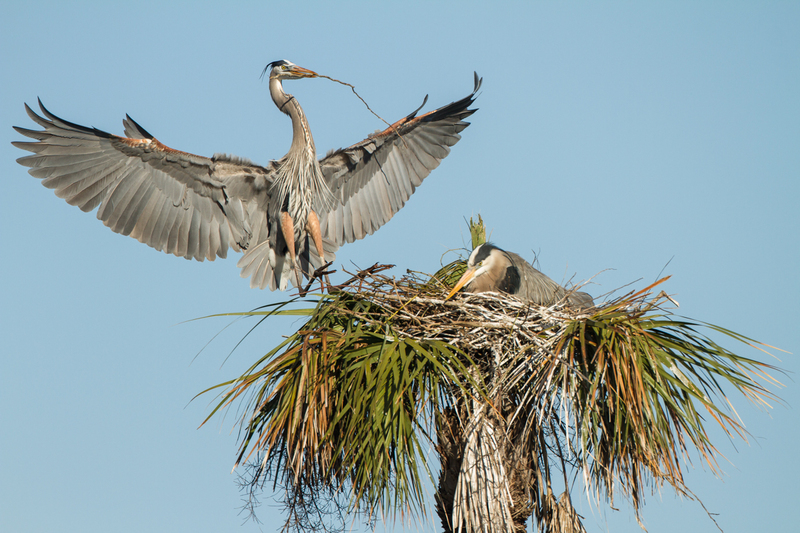 My recent trip to Florida had lots of heron highlights. 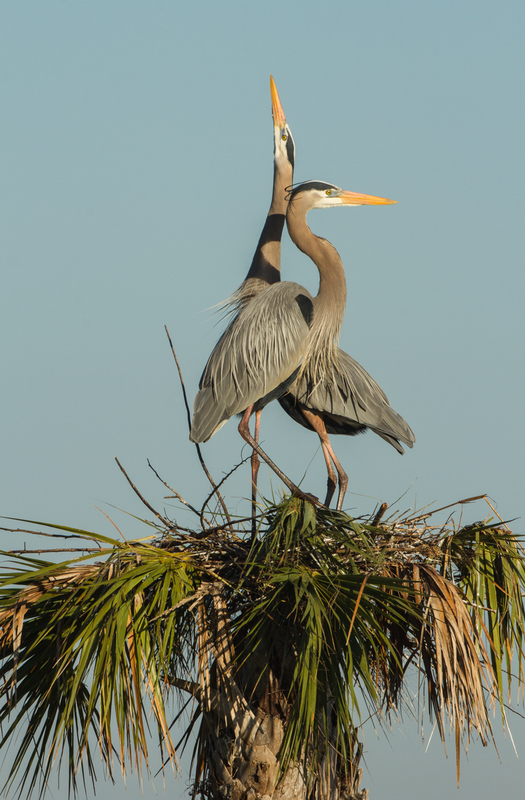 Here I report on the long and short of it, Great Blue Herons and Green Herons. 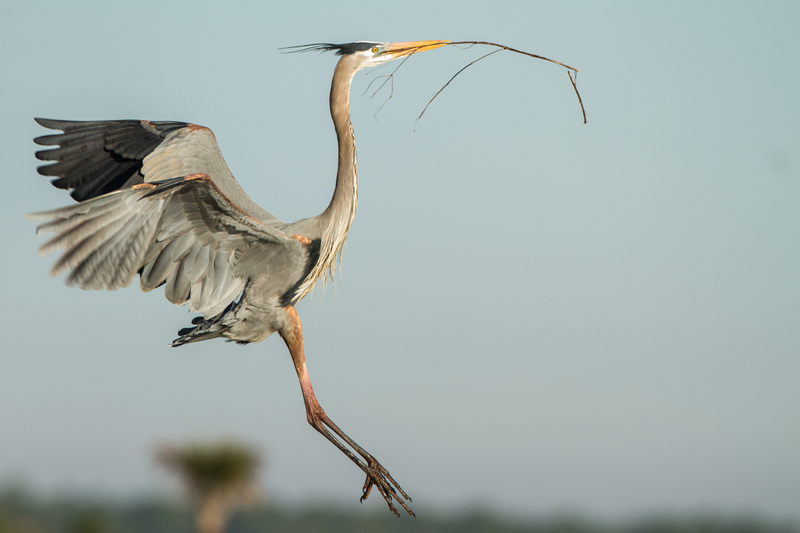 Standing four feet tall with a wing span of six feet, Great Blue Herons are among our largest birds, even though they weigh in at only 5 or 6 pounds. 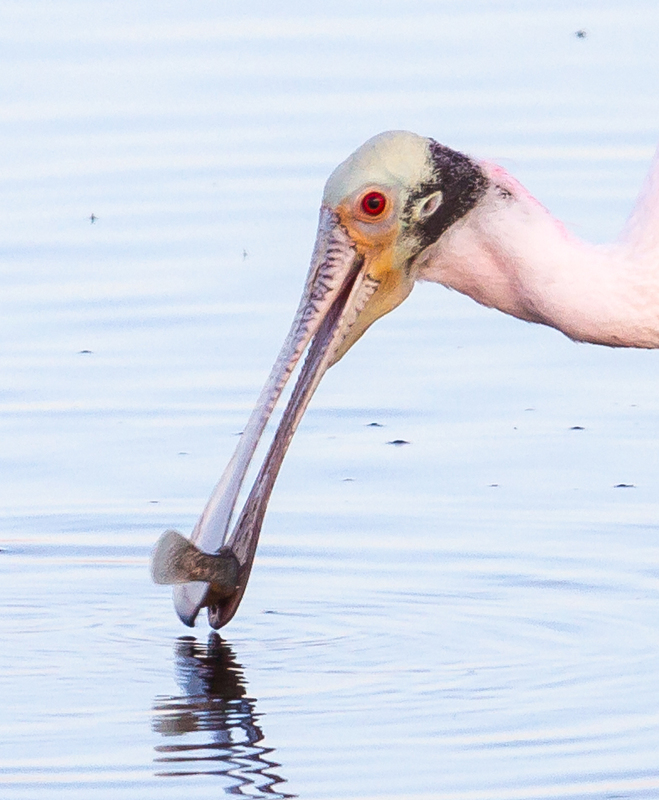 I was surprised to see them already nesting at Viera Wetlands. 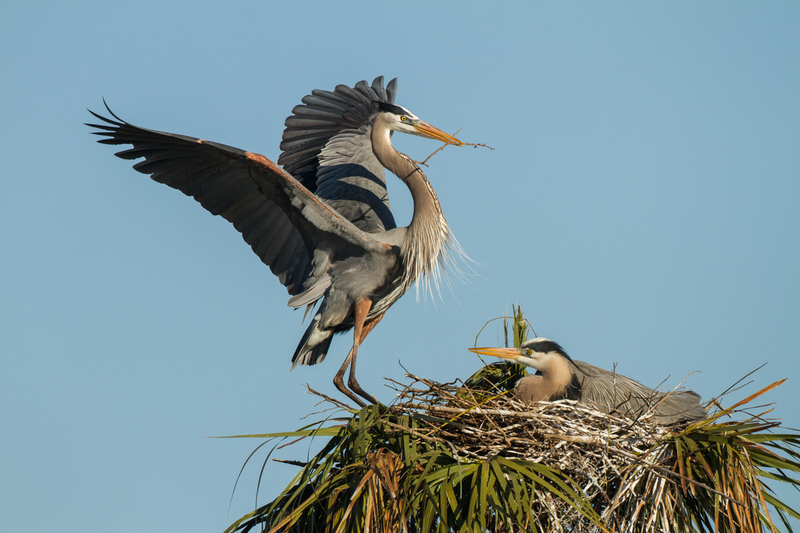 In fact, a volunteer said that they were re-nesting, as a recent storm had destroyed several nests that already had eggs. 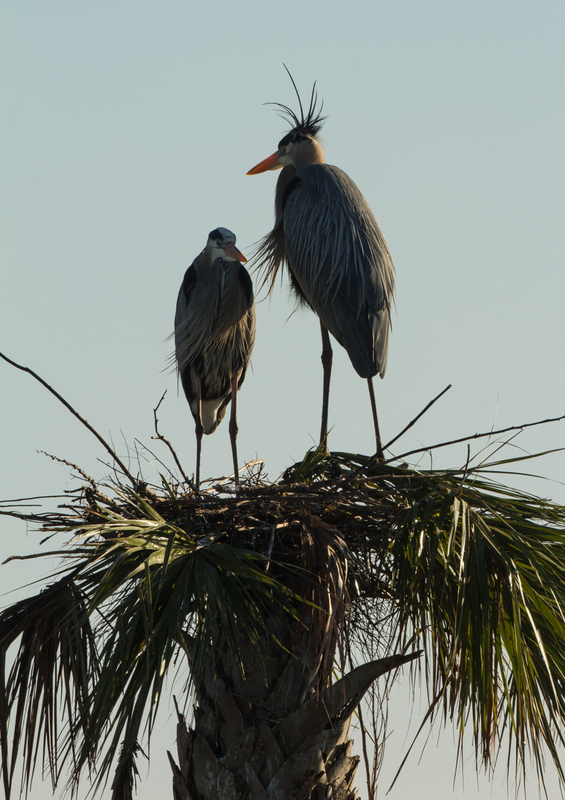 I have seen nesting colonies in NC that were in tall dead trees in swamps, but the ones at Viera were on top of palm trees out in the wetlands. 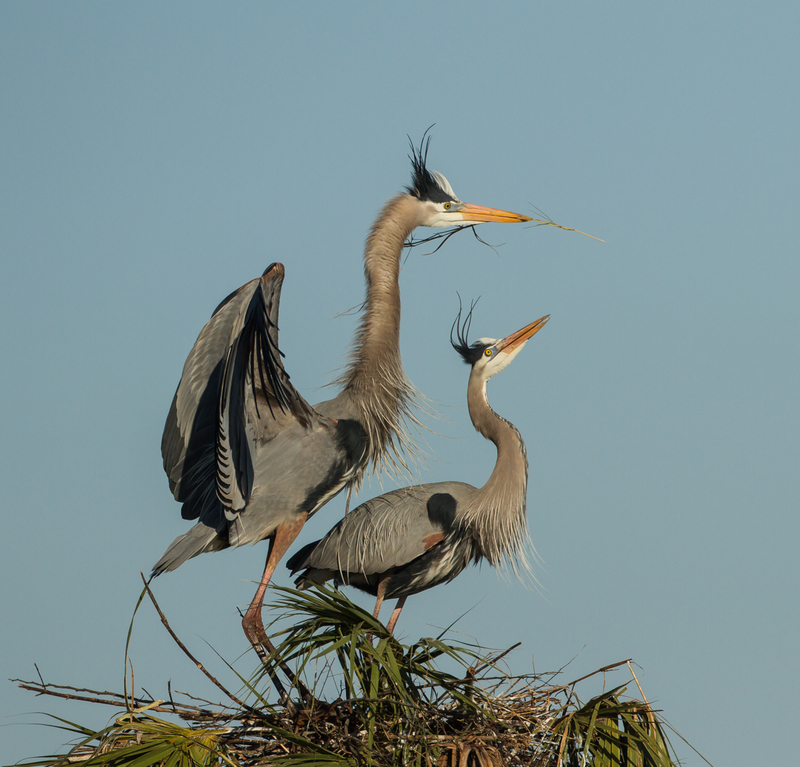 The herons were sitting quietly on their nests early in the day, but as the sun got higher, the male flew off and began collecting sticks. He would drop down to a broken branch laying on the ground and inspect it, before twisting off a section and flying back to the nest. 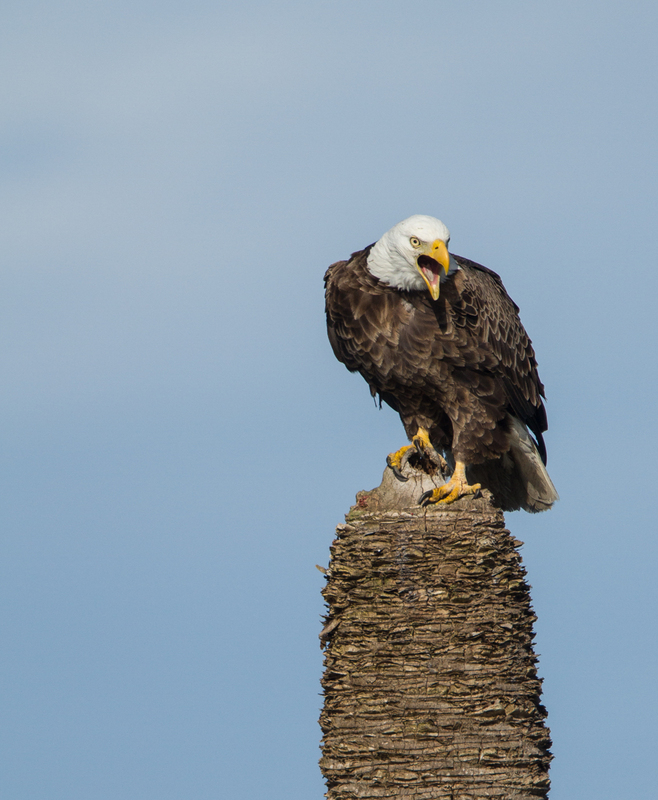 Occasionally, a male would go to an unoccupied nest and steal a stick to take back to his mate. Once he lands, he presents the stick to the female, and she accepts it (not sure what happens if she doesn’t like a stick). 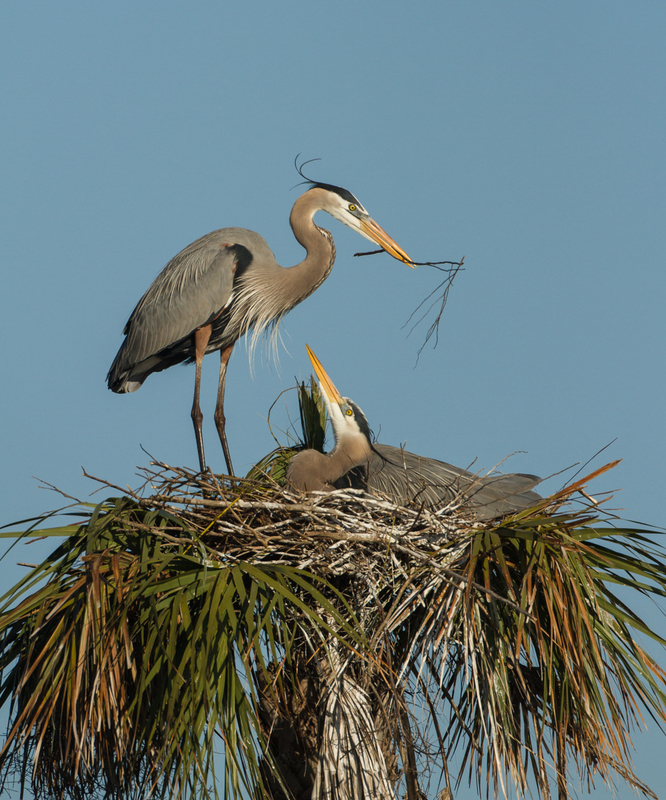 She occasionally simply plucked the stick from him without standing up and carefully placed it in the nest. He would then fly off for another. 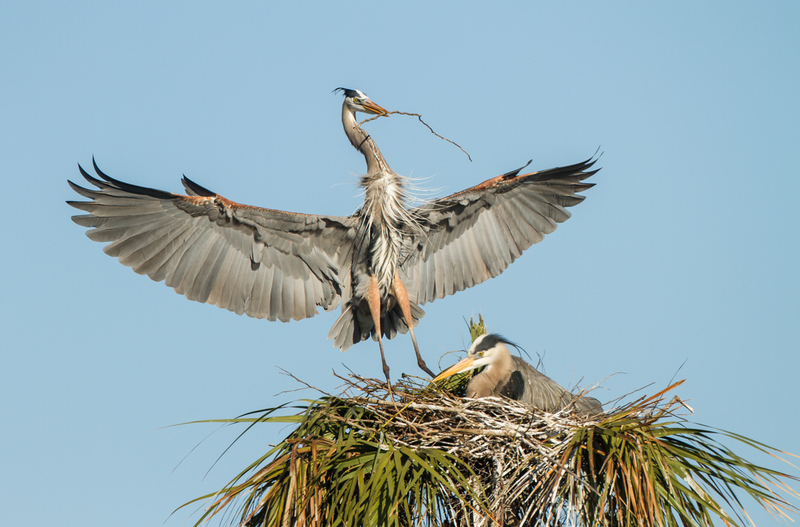 At other times, there was more ceremony involved, with both birds stretching and bill pointing before she accepted the stick. Must have been a really good stick! 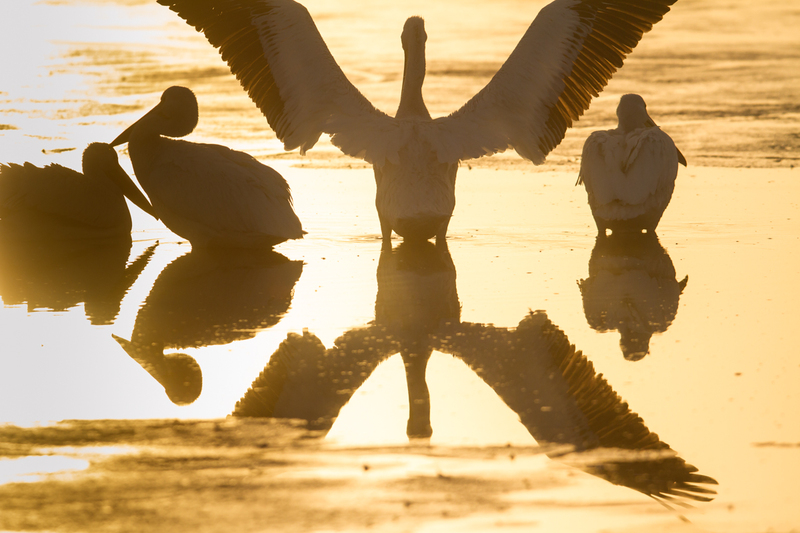 A few times there was a wing stretch display involved in the stick transfer, and often there would be a prolonged period of neck stretching and bill pointing. The stick ferry finally ended for the morning and I walked down the border of the wetland dike. 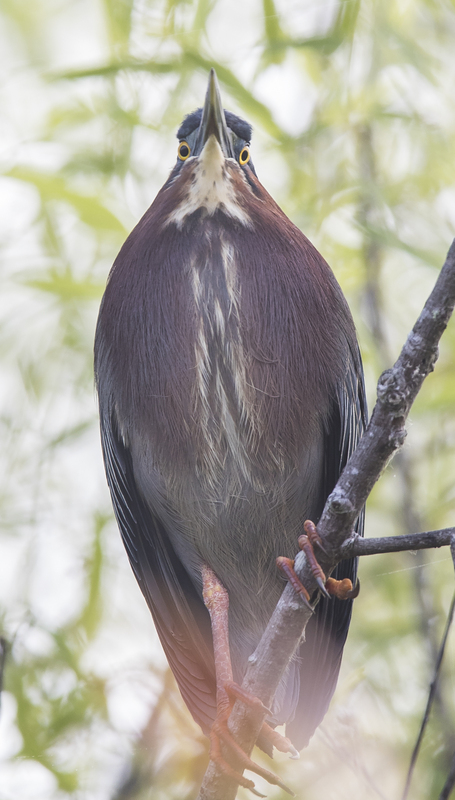 Soon I found one of the many diminutive Green Herons I saw on the trip. 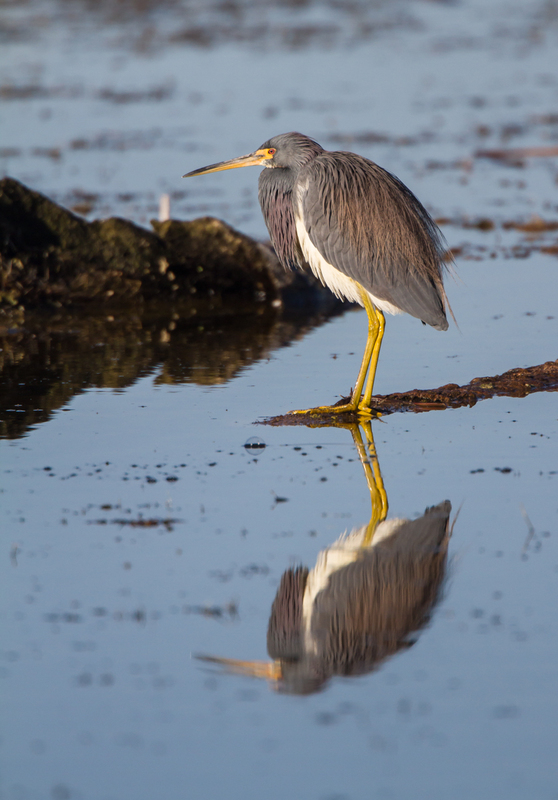 Green Herons are one of our smallest herons, standing only 18 inches tall with neck outstretched, and have a wing span of 26 inches (about one third that of a Great Blue Heron). 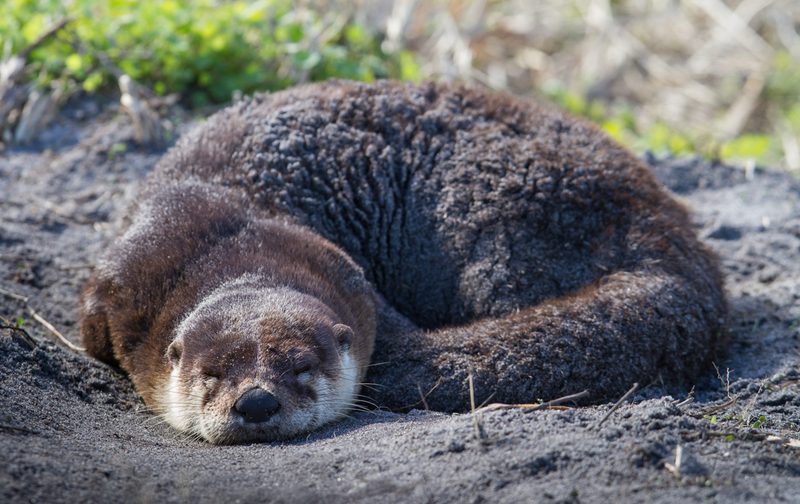 They are found in freshwater swamps and marshes throughout the eastern half of the U.S. and up the west coast. 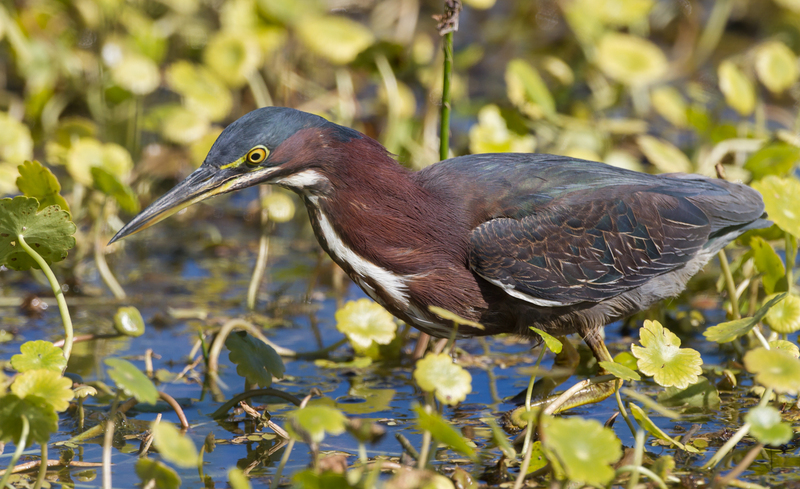 Green Herons are richly colored in shades of chestnut, dark glossy green, and streaks of beige and white. 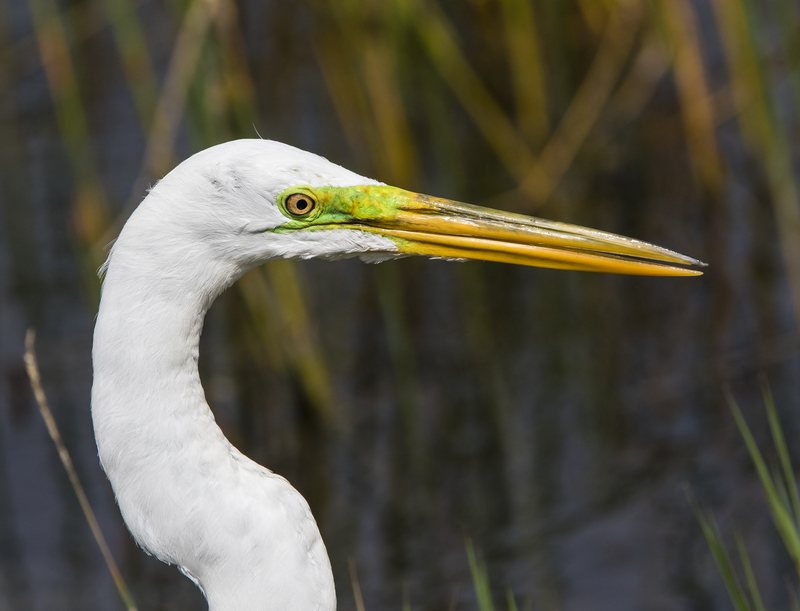 They have piercing eyes and are slow motion stalkers of fish and other aquatic organisms at the edge of marshy areas and open beds of wetland vegetation. 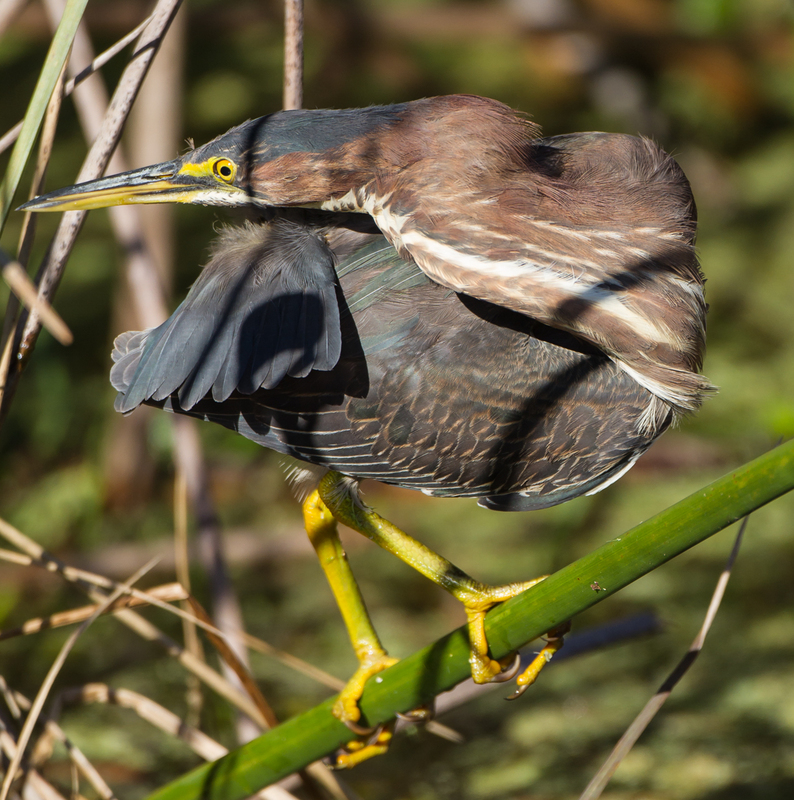 Green Herons are one of the few birds known to use tools to hunt. 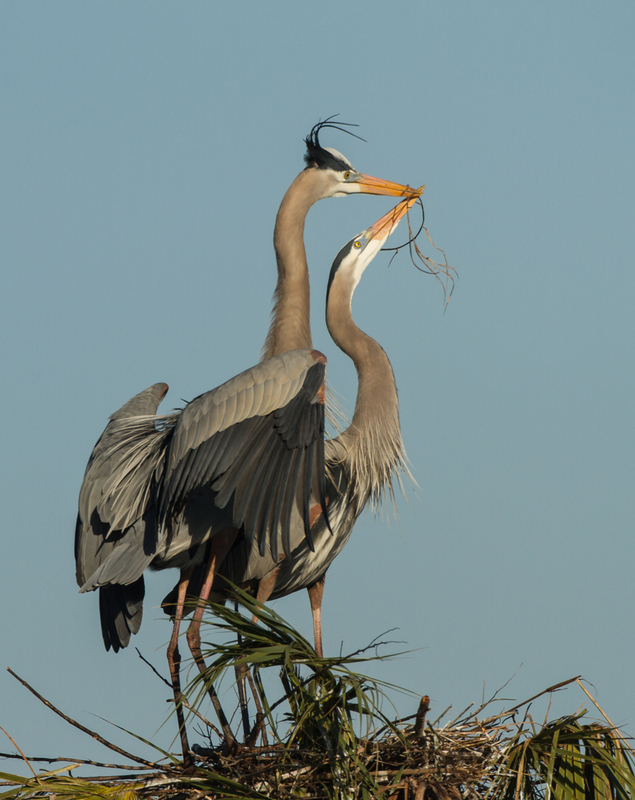 They have been observed using twigs, feathers, and other objects to create “fishing lures”. 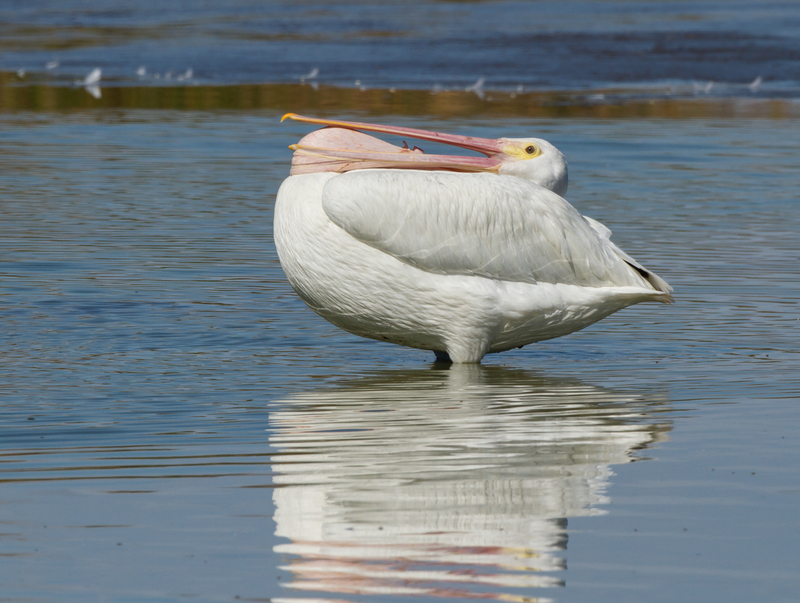 They drop the object on the water surface, luring small fish to within striking distance. 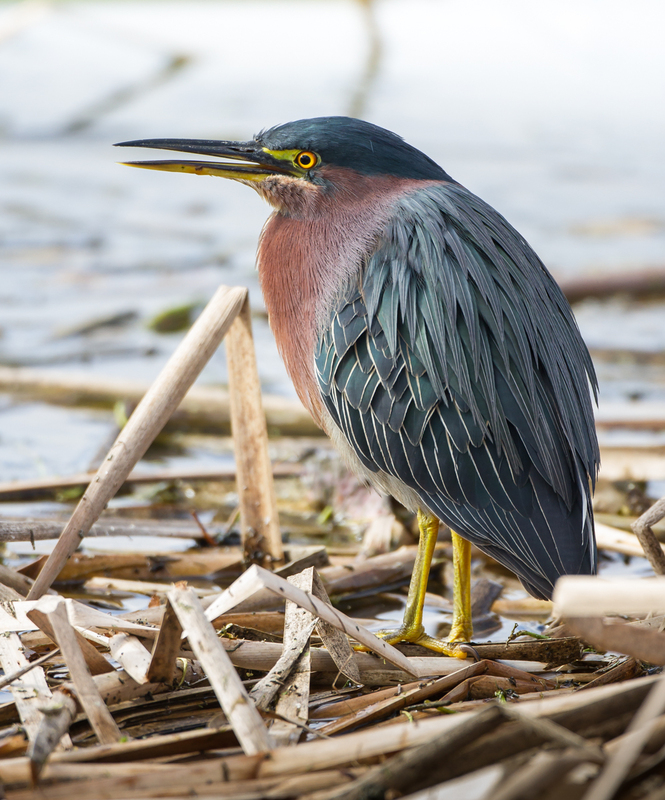 Often, as I prepared to get a shot of one that had momentarily stepped out in the open, it would raise its crest feathers and jump out in pursuit of a nearby Green Heron that had escaped my notice. 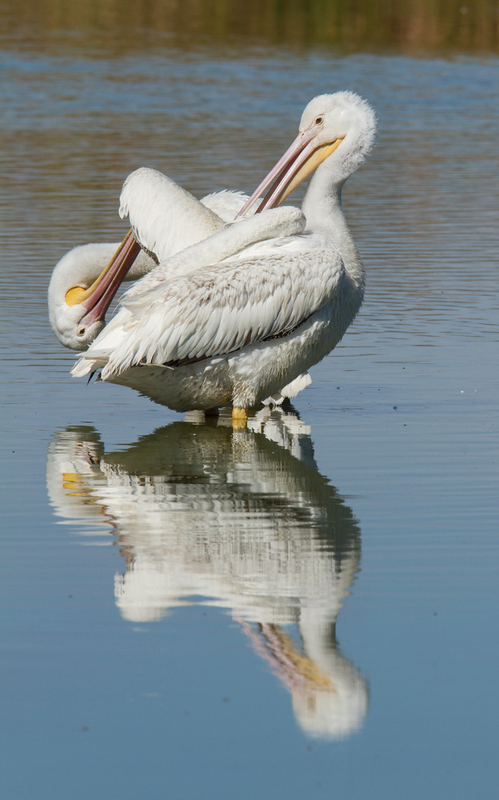 I’m not sure if these were territorial interactions over food, breeding territory, or both. 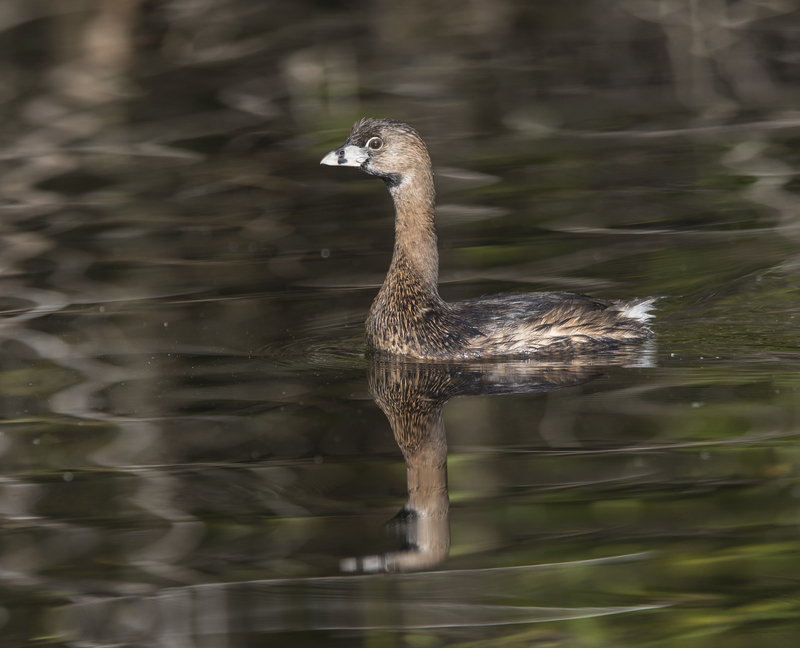 This display was usually accompanied by a neck stretch designed to make this tiny marsh hunter appear bigger. 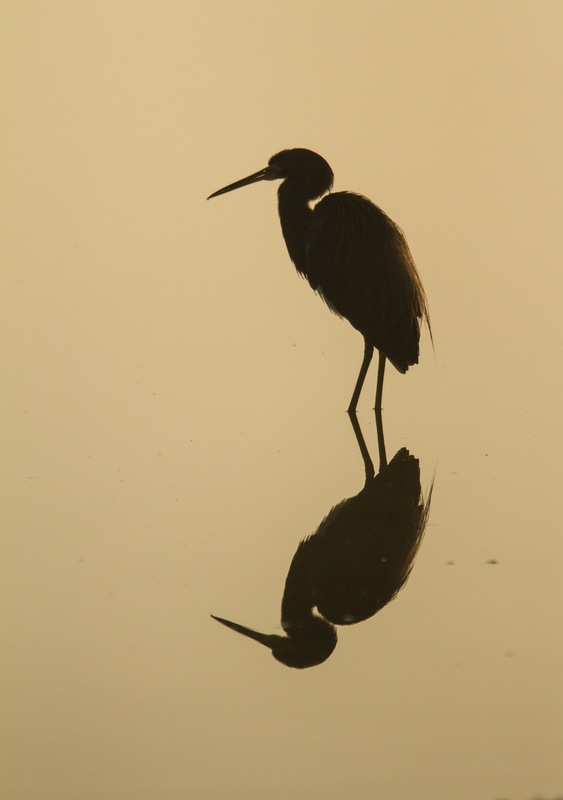 Both species are a joy to watch, and I have decided that time spent with herons, short or tall, is time well spent. 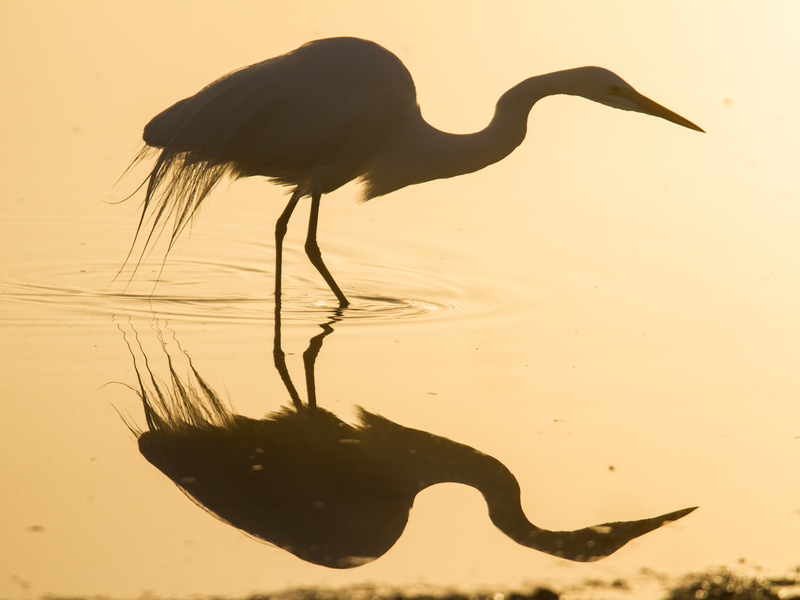 High on my list of places to visit on my trip to Florida was Merritt Island National Wildlife Refuge, adjacent to the Kennedy Space Center. 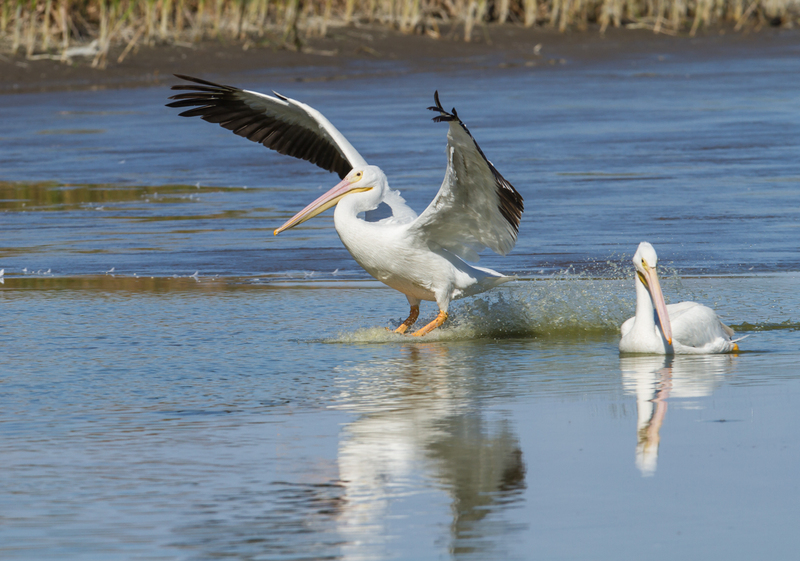 The refuge is huge, over 140,000 acres, consisting of a variety of habitats – coastal dunes, saltwater estuaries and marshes, freshwater impoundments, scrub, pine flatwoods, and hardwood hammocks. 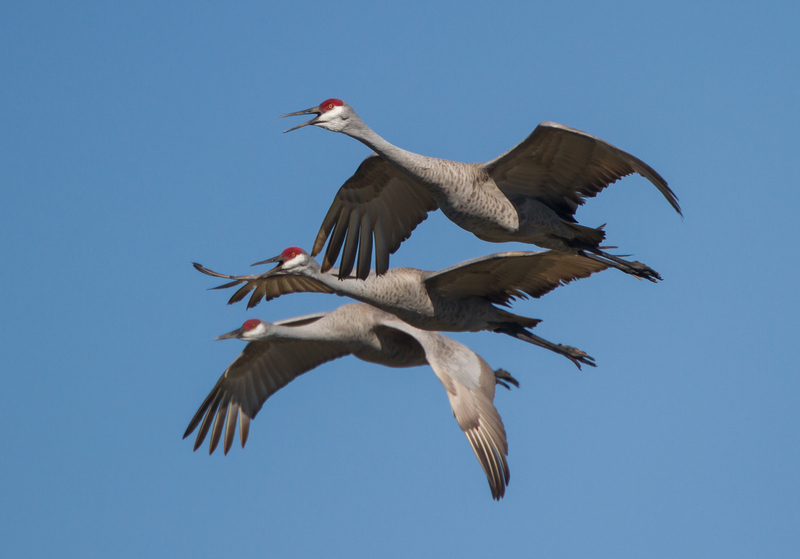 Winter brings tens of thousands of migratory birds to the refuge to join the resident species making this a mecca for birders. 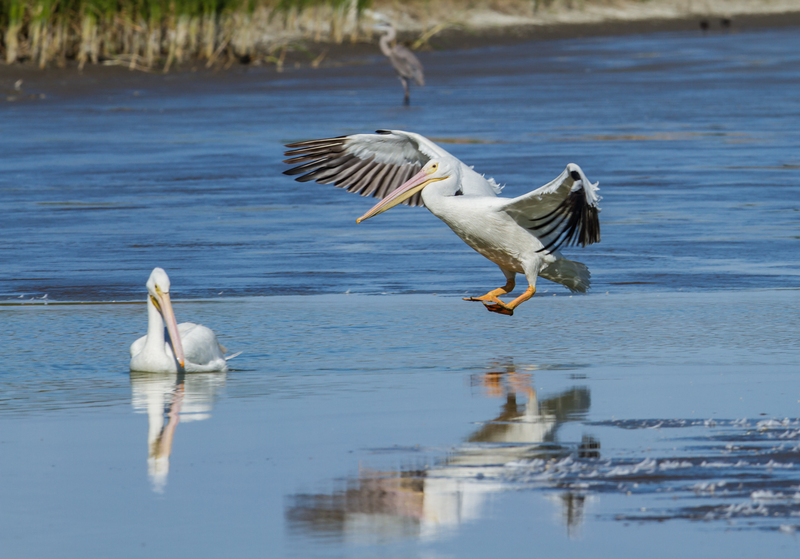 One of the best places for viewing wildlife is the Black Point Wildlife Drive, a 7-mile, one-way gravel road on a dike around several large impoundments. 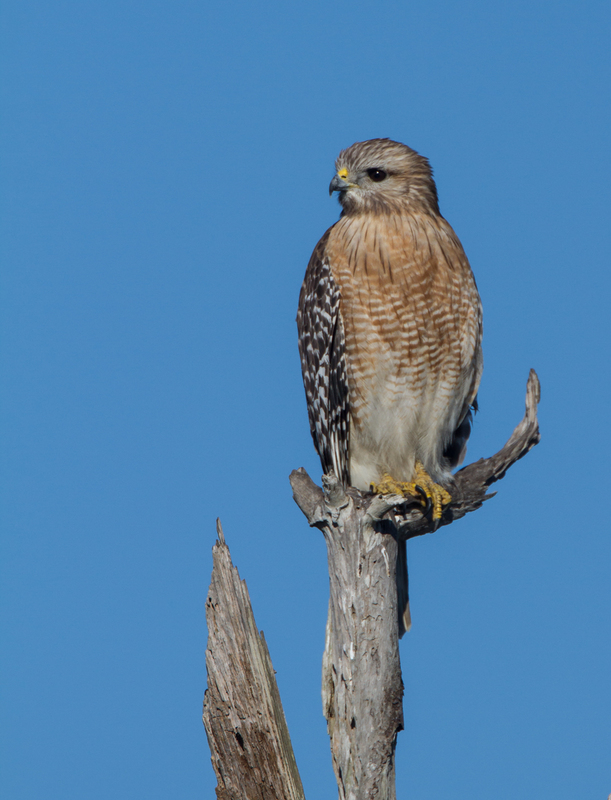 I arrived mid-afternoon, and after a quick stop at the Visitor Center, headed to Black Point Wildlife Drive. I must admit, my first reaction was disappointment. 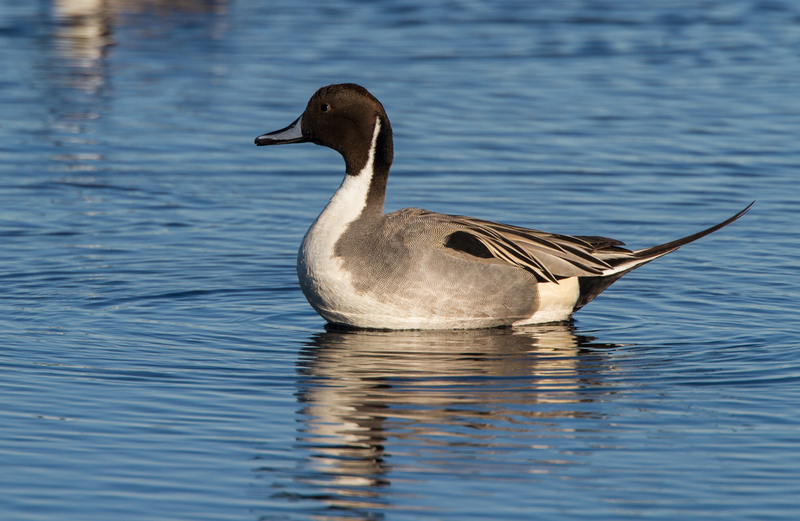 One impoundment had quite a few Northern Pintails and some shorebirds, but that was about it. Had I driven all this way for nothing? I continued on and finished the loop road and then decided to head back through one more time, hoping more activity would now be evident as sunset approached. 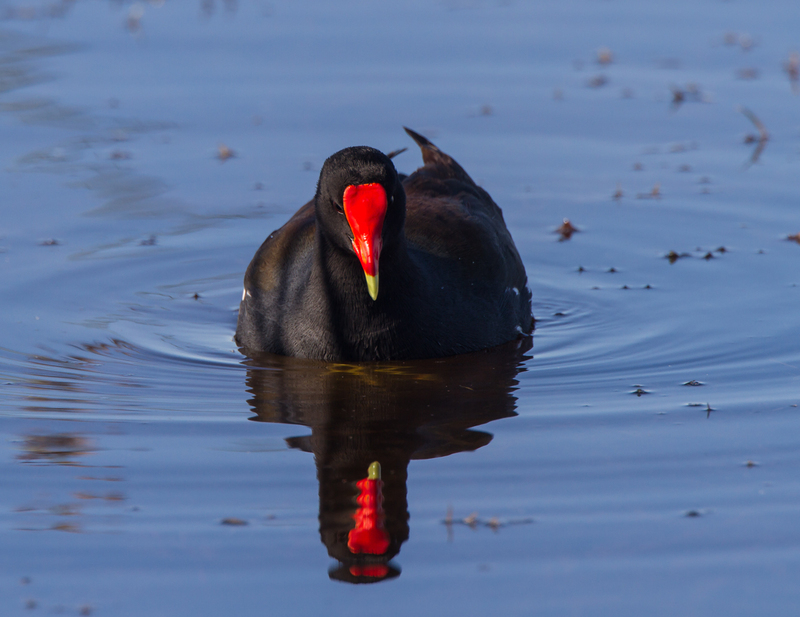 I reminded myself that I have seen quite a few folks do the same thing at my favorite refuge back home (Pocosin Lakes) – drive through in the middle of the day and not see much and then head home wondering where all the birds they had heard about were hanging out. 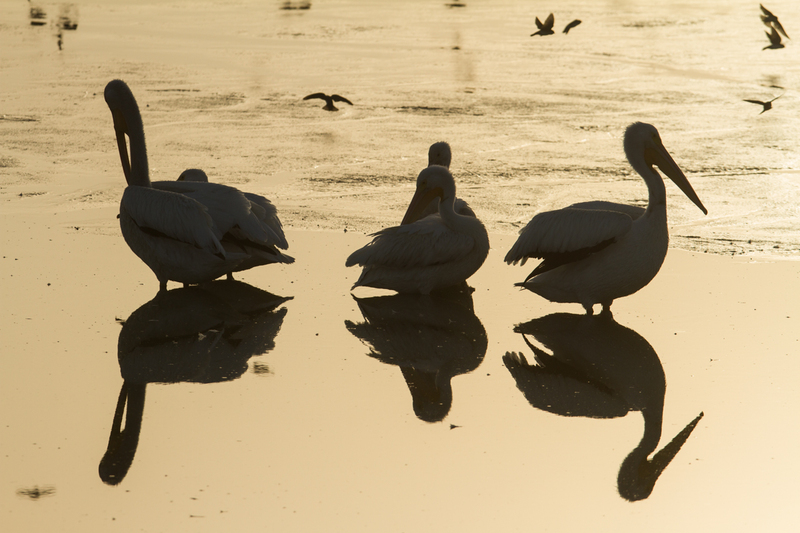 The following scenes took place on two afternoons at the refuge with most of the activity on the first day. Indeed, the second pass proved more fruitful. 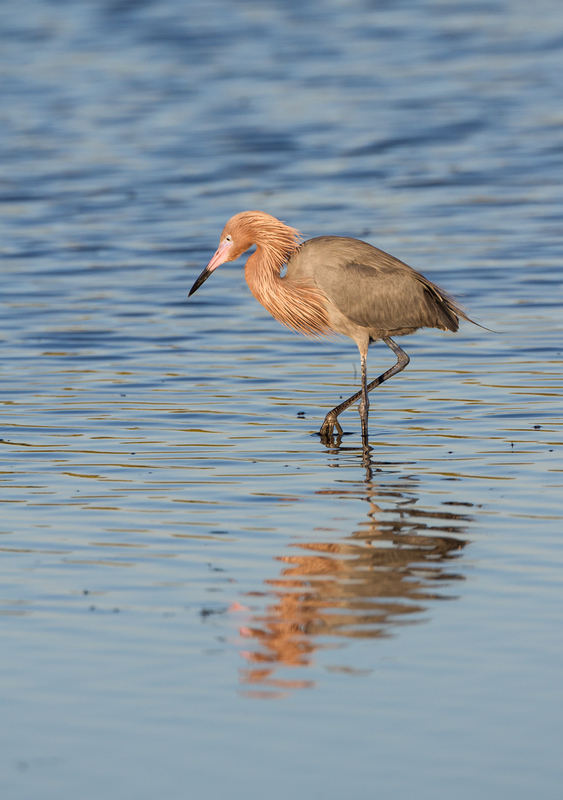 A pair of Reddish Egrets had flown in to one impoundment and were starting to forage. I have seen this species only a couple of times before, but remembered how energetic they can be as they scramble around the shallows looking for a meal. 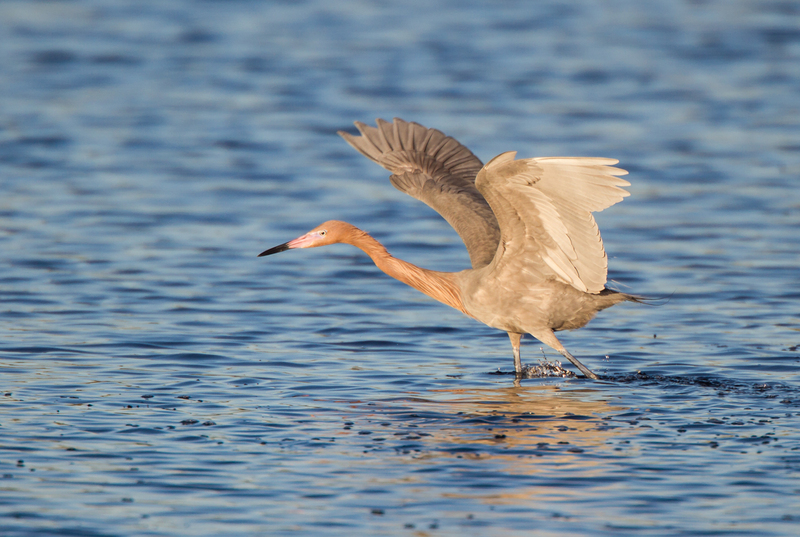 In addition to mad dashes and sharp turns, Reddish Egrets also use a “canopy” technique, where they spread their wings and hold still for a few seconds, creating shade which can attract small fish within striking range. 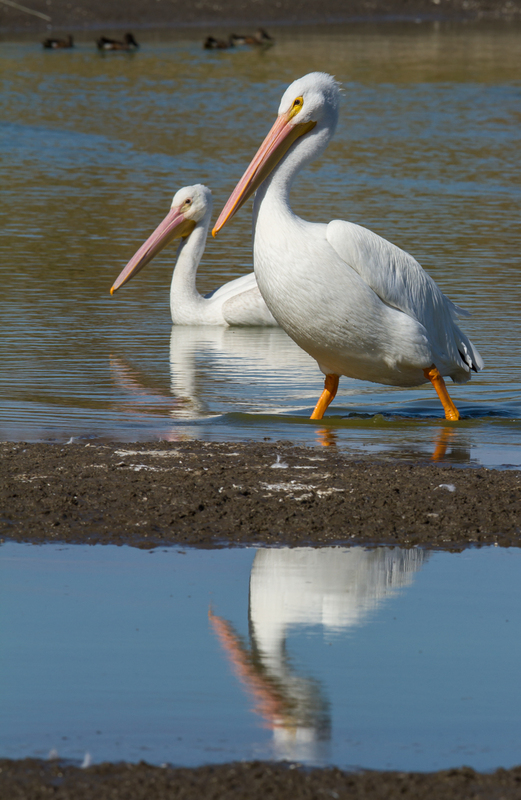 After about 30 minutes watching these two run all over the shallows, they moved to the far side of the impoundment and I drove on. 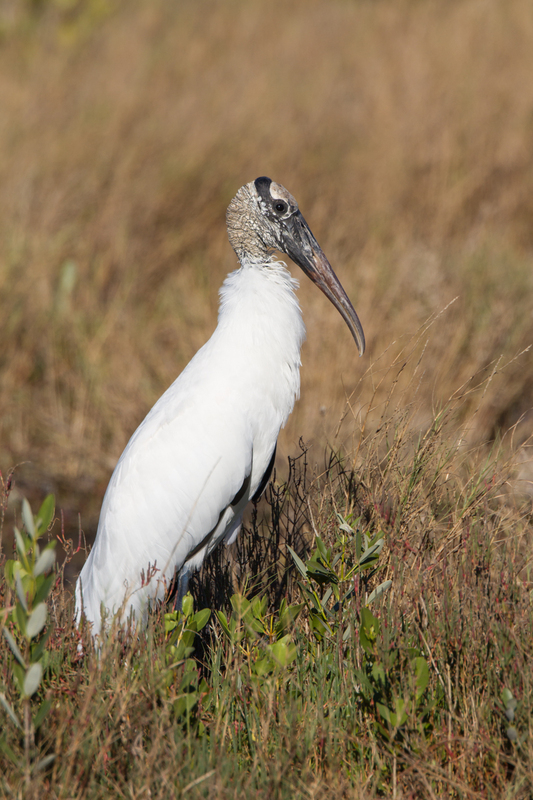 Another quintessential Florida species, a Wood Stork, greeted me at the next stop. 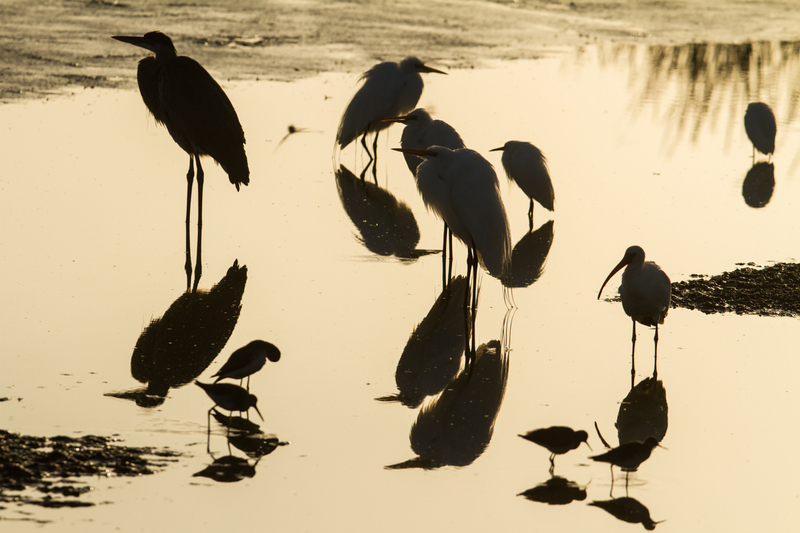 These tall waders have a prehistoric look to them and are always a treat to see, especially in the soft light of late afternoon. 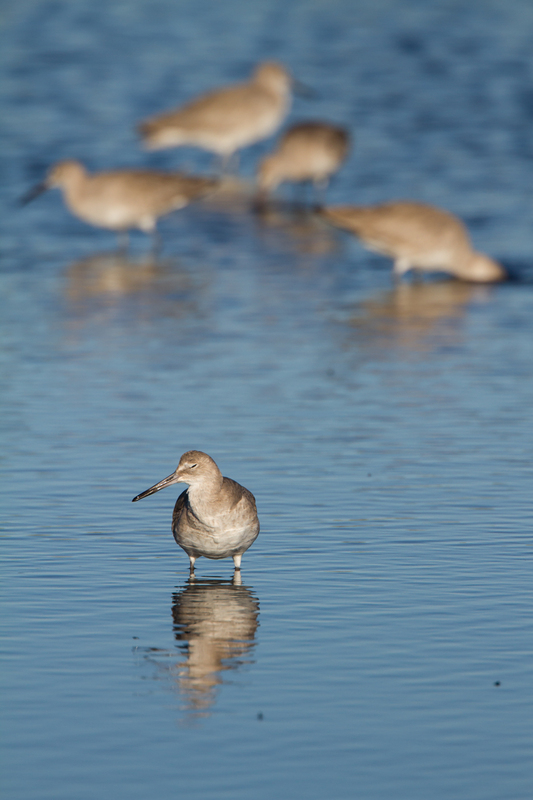 There were many shorebirds out in the impoundments, mostly Dunlin and small groups of Willets. 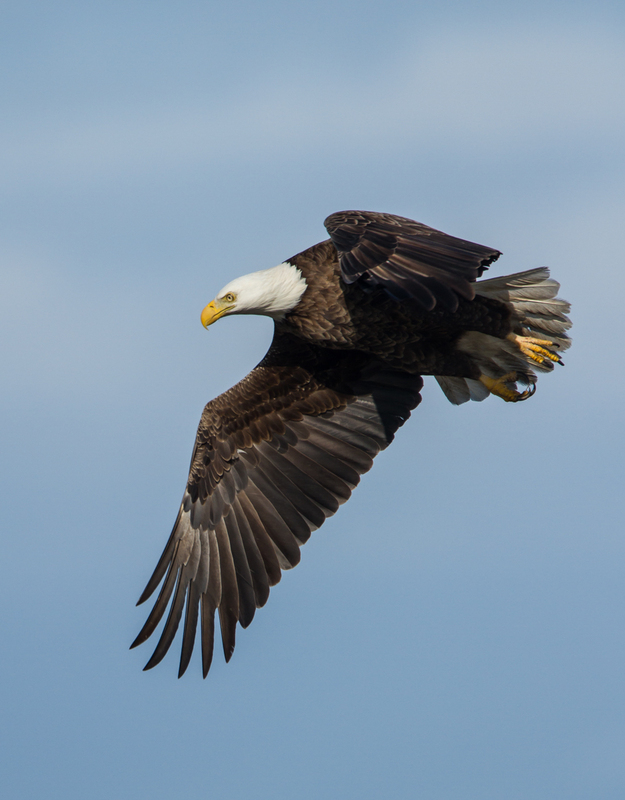 A Bald Eagle flew over and both the ducks and the shorebirds erupted from the shallows in circling clouds of wings before settling back on the water. 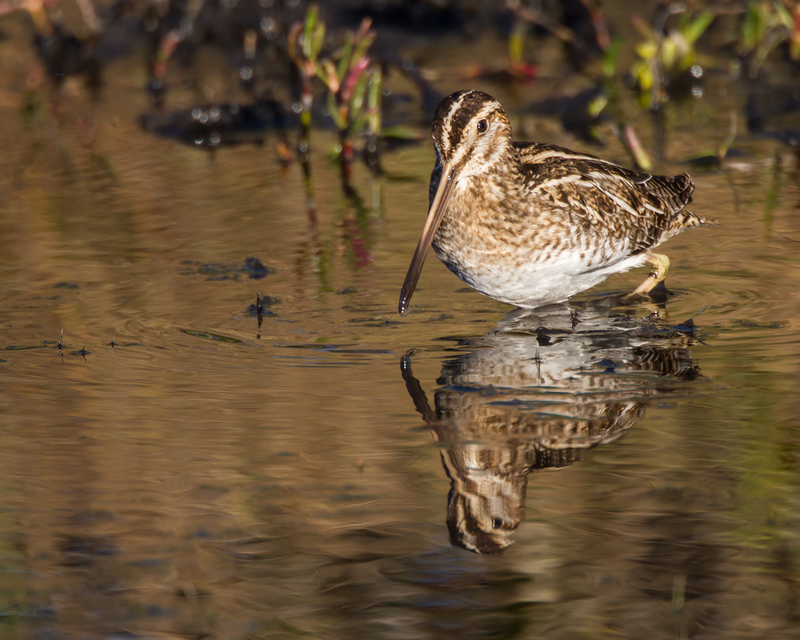 On my first pass on Wildlife Drive I was pleased to find a Wilson’s Snipe foraging along the edge of a small island adjacent to the road. 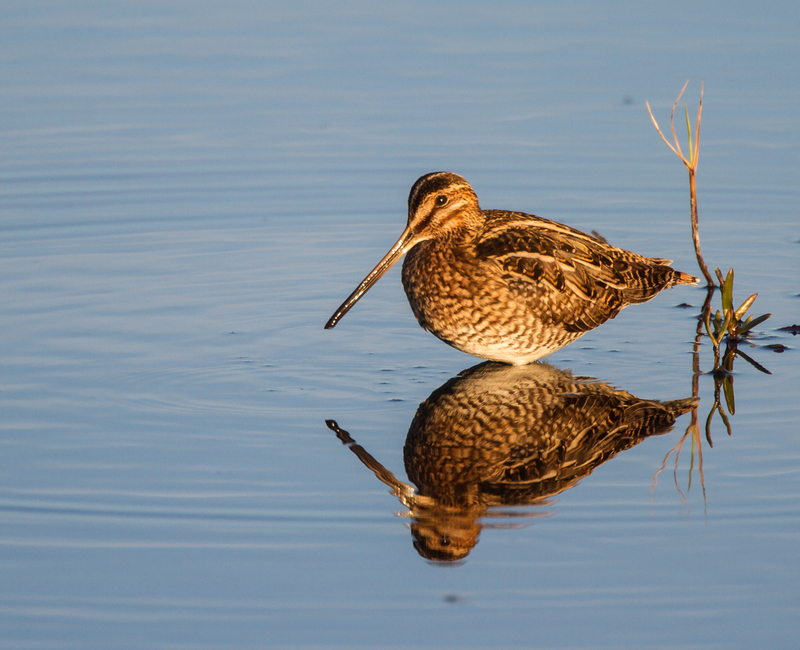 On my next trip, the snipe was still near the island and was glowing in the low angle light. 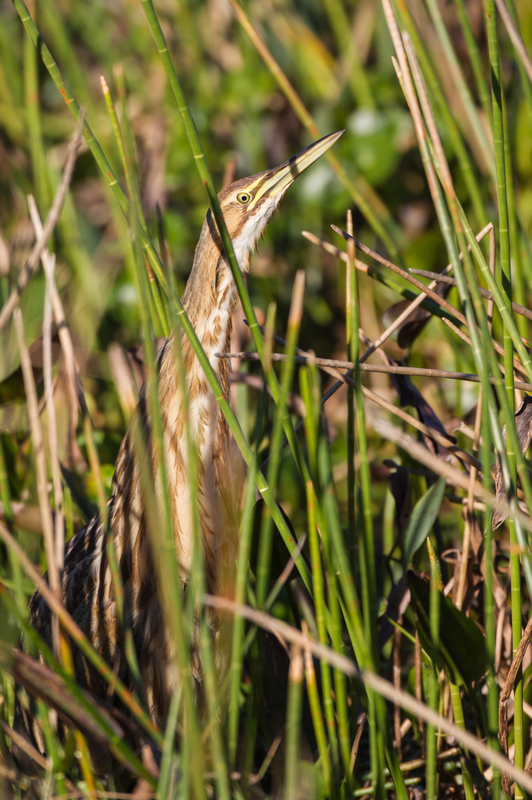 Usually, I see this camouflaged bird in grasses and marsh edges where a decent shot is tough to come by, but this one was more cooperative as it hunted for aquatic worms and other invertebrates in the shallows just off the edge of the island. 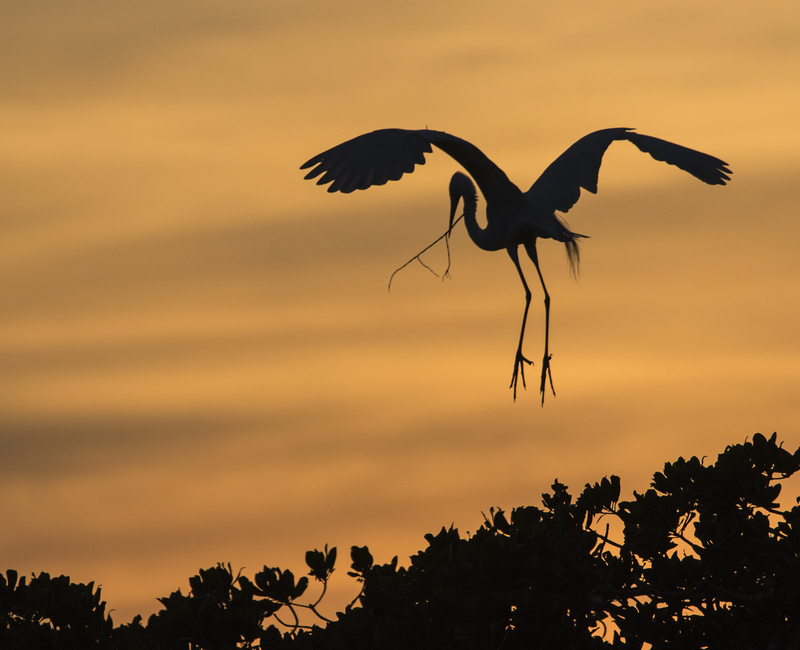 I returned to Merritt Island on my last afternoon in Florida. 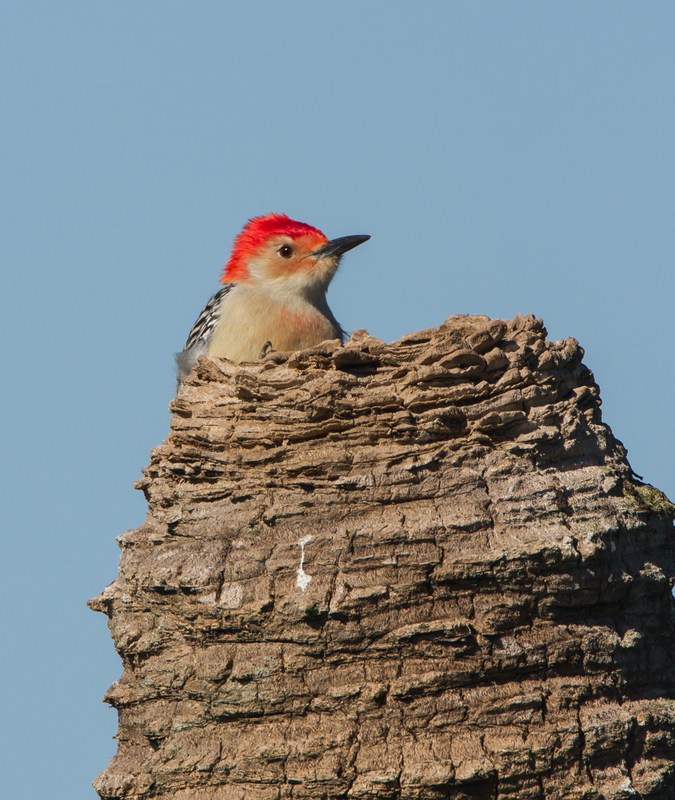 There were more visitors but fewer birds along Wildlife Drive. 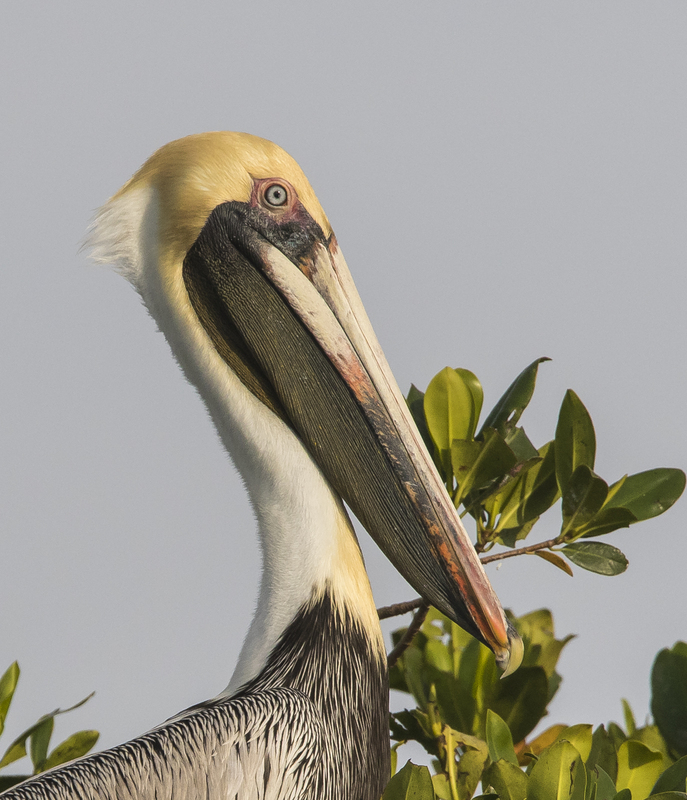 A local birder explained that the bays were much higher salinity than normal, perhaps due to a lack of any major tropical systems hitting this part of Florida the last few years. 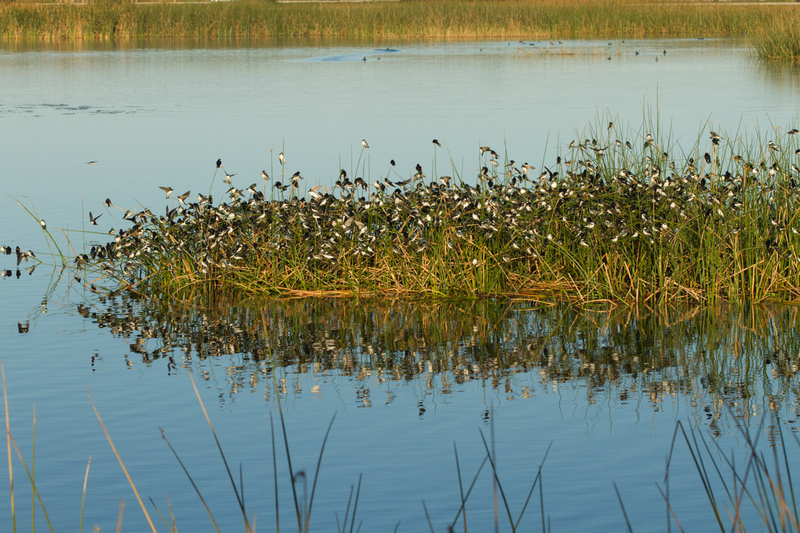 This has caused a reduction in the usual abundance of birds foraging in the shallow marsh impoundments. 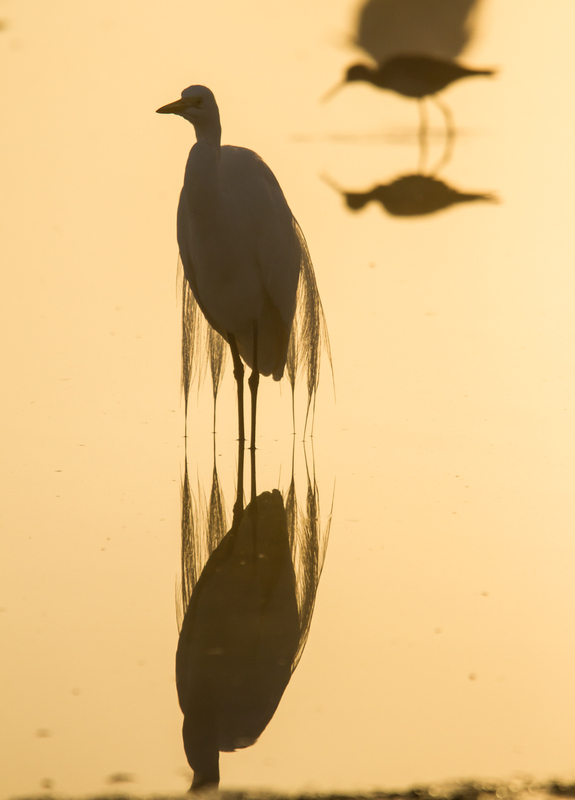 As the sun was setting, the dreaded no-see-ums (tiny biting flies) started to appear and most of the birders/photographers retreated to the safety of their cars and headed out, leaving me to look for a last few images by myself. 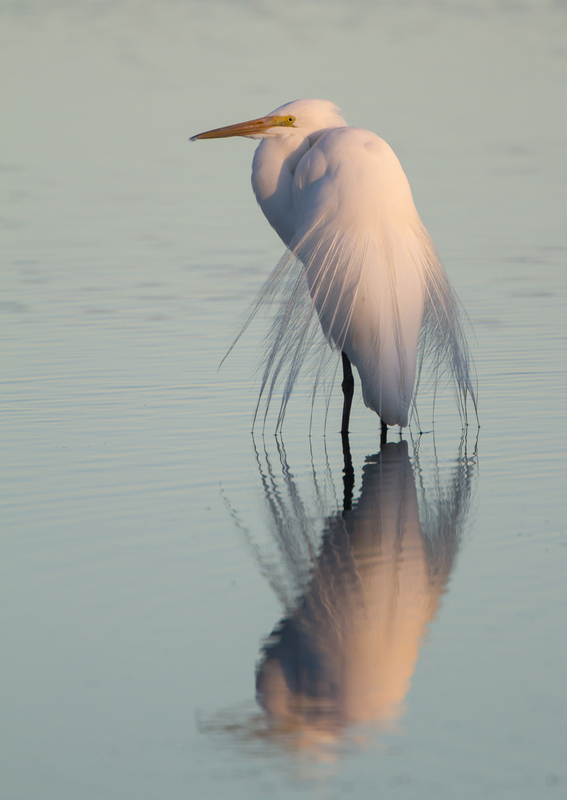 I stopped at the impoundment where I had seen all the ducks and found a lone Great Egret bathed in soft light. Clouds were moving in to the west so my time was getting short. 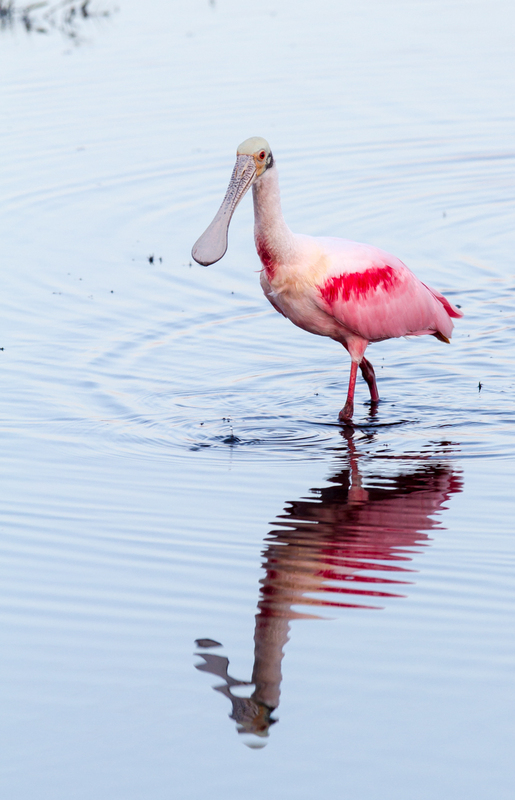 I looked down the marsh and was stunned to see something I had hoped for, but had yet to see in Florida – a Roseate Spoonbill. 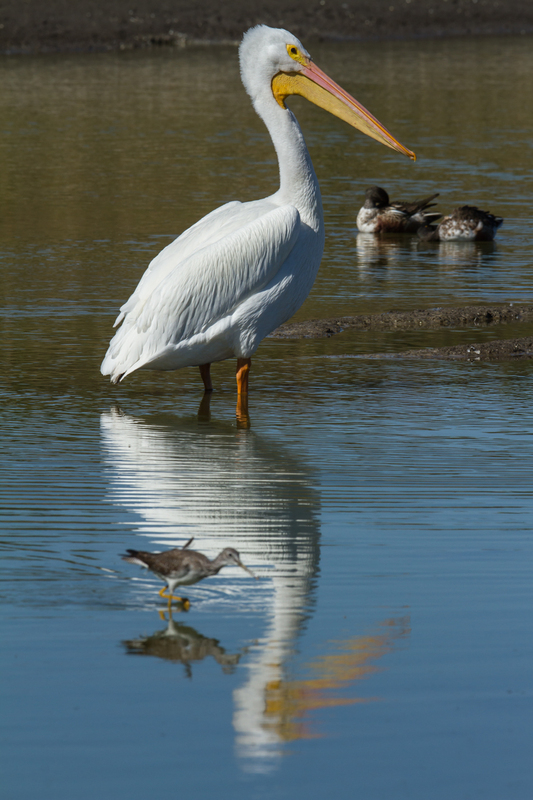 I must have missed it flying in while I was focused on the egret. I glanced down the road, and to my amazement, there was no one else around. 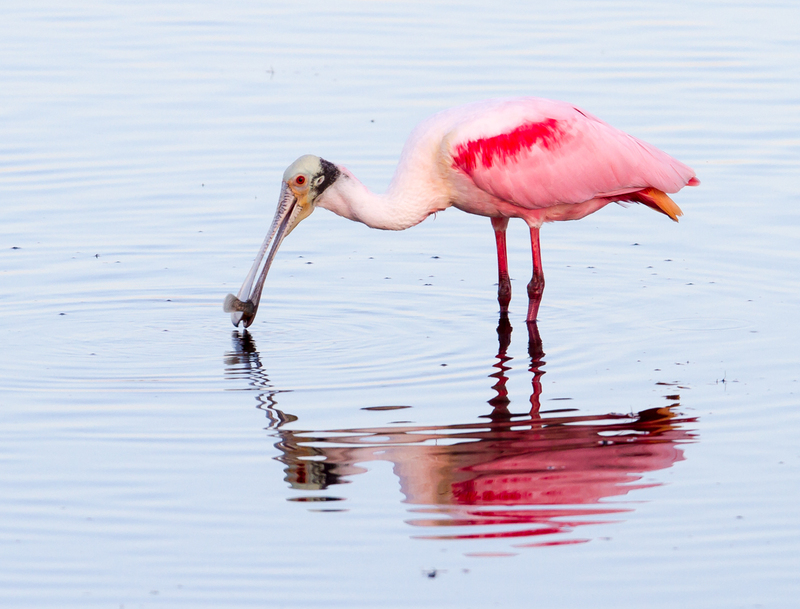 The spoonbill was in perfect light to highlight its gaudy pink colors and I was surprised at how small it looked relative to the ducks feeding around it. I grabbed my gear and ran down the road to get in position and got off just a couple of shots before the sun was swallowed by the cloud bank. So, my remaining shots were taken in darkening conditions, with the no-see-ums coming out in force (but it was worth it). 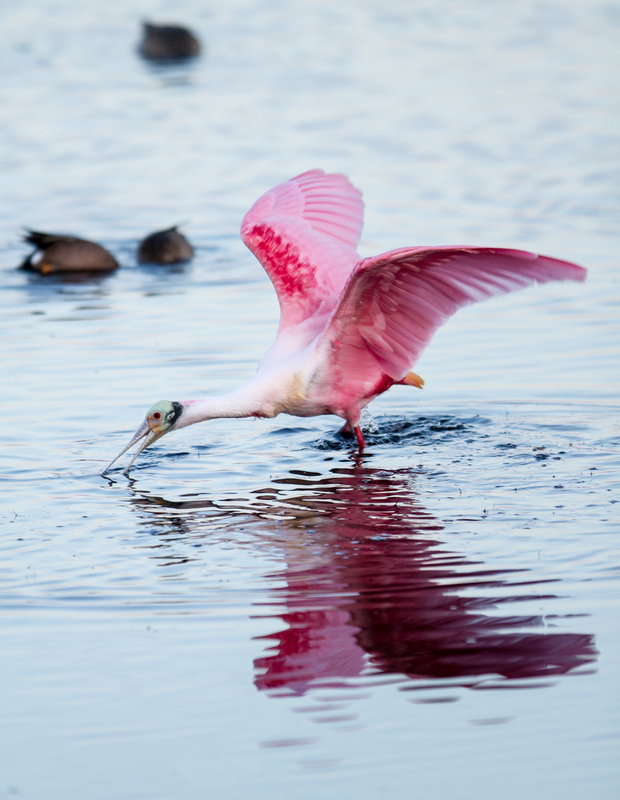 Roseate Spoonbills are the most brightly-colored of six spoonbill species in the world, and are the only one found in North America, primarily along our Gulf Coast states. 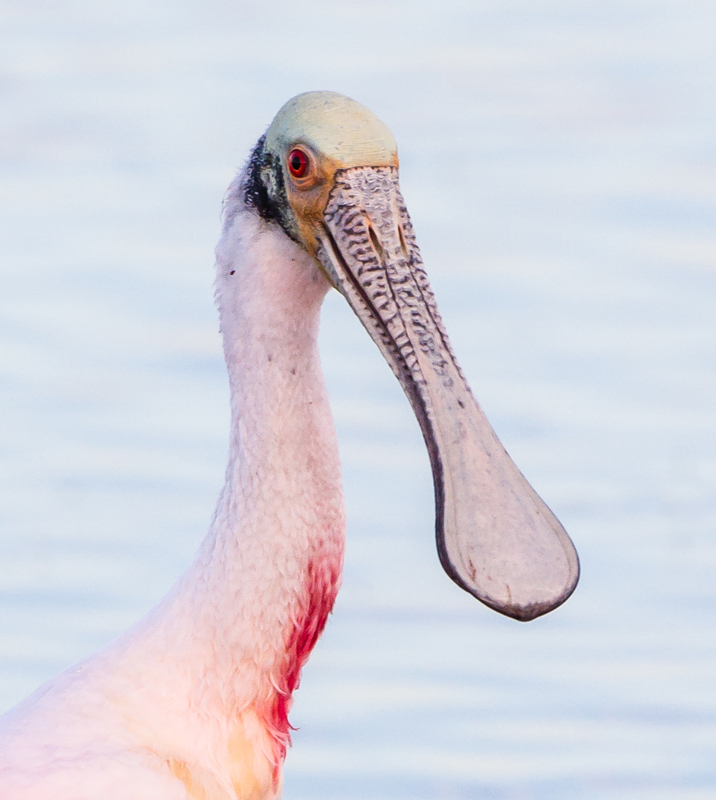 Their common name refers to two obvious physical traits: 1) their bright pink color, which is believed to be derived from eating crustaceans (like shrimp and crayfish) that have fed on red algae ; and 2) their unusual spoon-shaped bill. 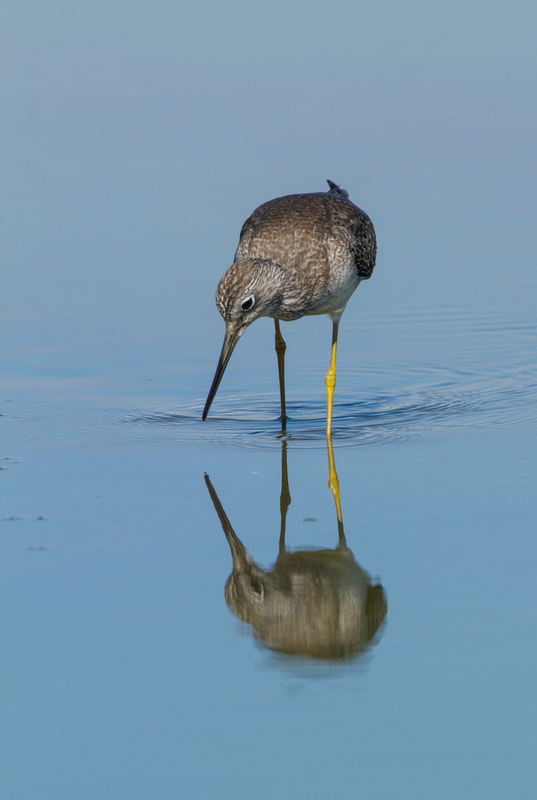 The odd-shaped bill is an adaptation for the bird’s tactile feeding style in shallow waters (which allows it to feed in murkier water than many other waders which rely more on sight to grab their prey). 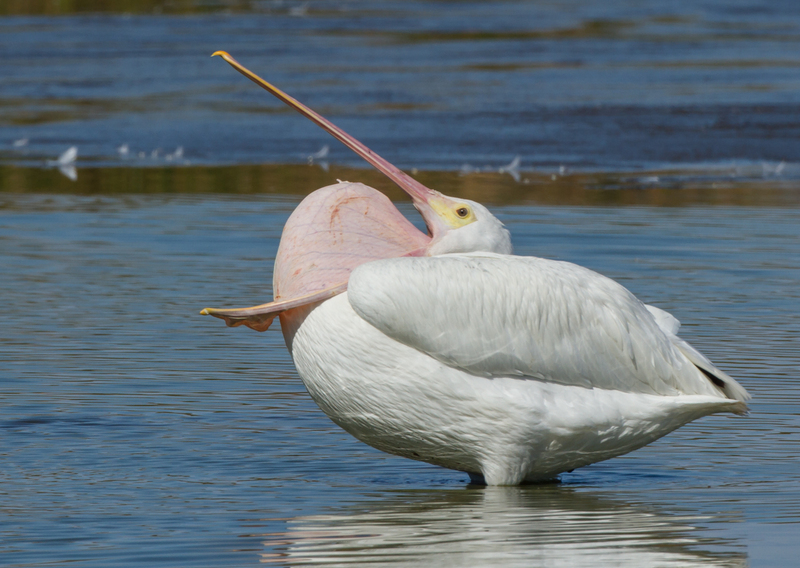 Spoonbills wade in shallow water with their bill down in the water, slightly agape. 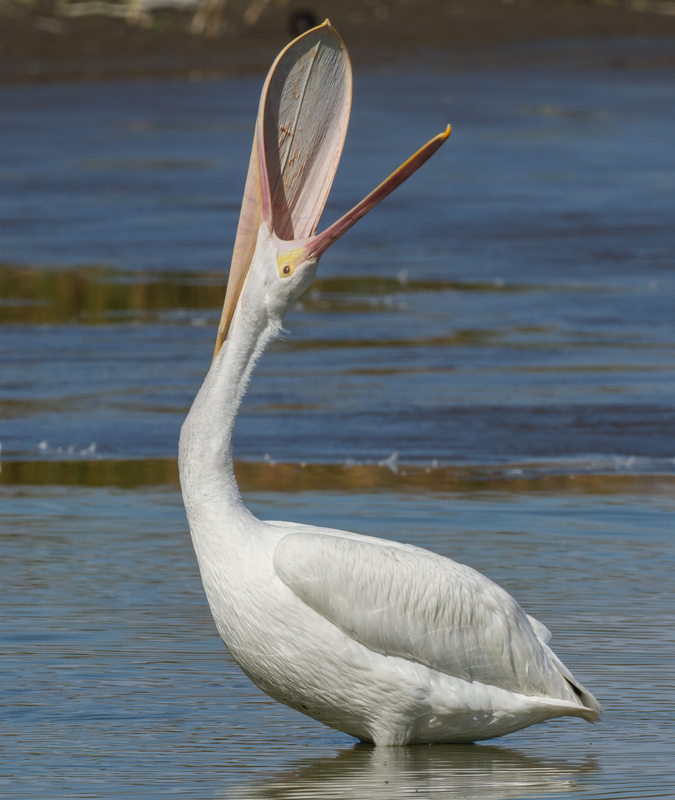 They feed by swinging their head back and forth and snapping the bill shut when their sensitive touch receptors located inside the bill detect prey. 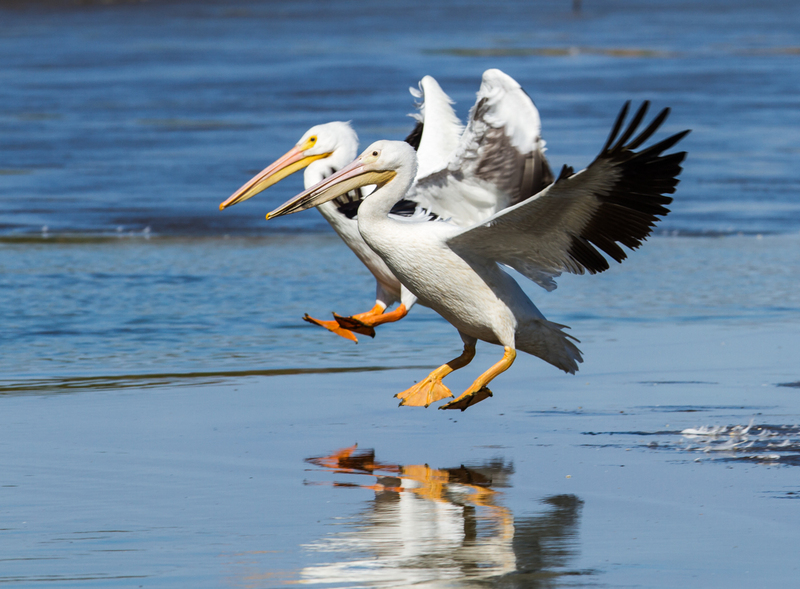 In clearer water, they may chase after fish they see by running and flapping (as was the case in the image above). 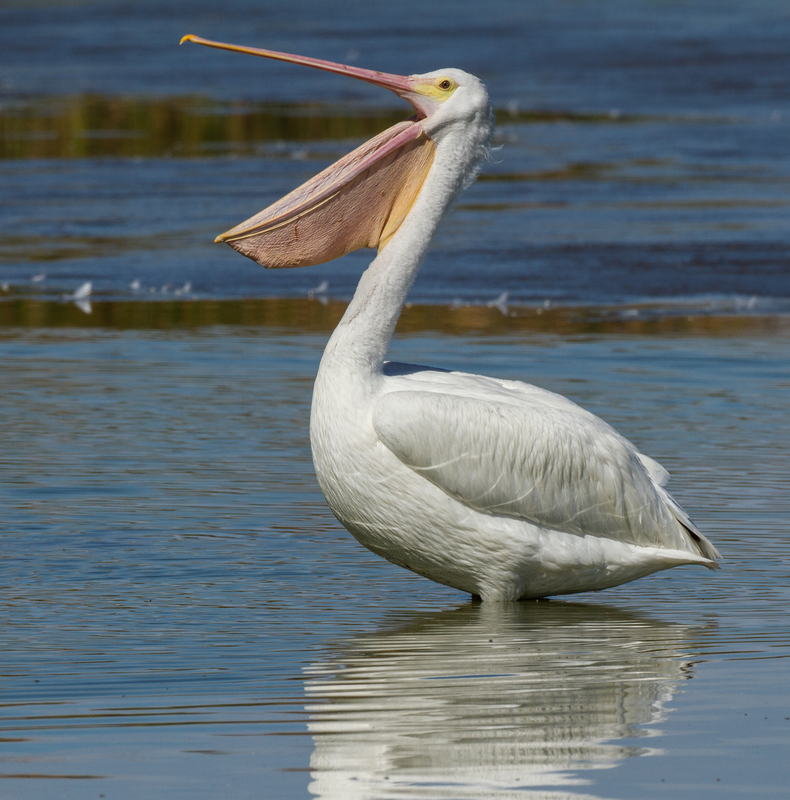 I stayed with this bird for about 30 minutes, watching it move hundreds of feet back and forth in the impoundment as it swung its bill in search of food. It caught several fish and some other prey too small for me to see. 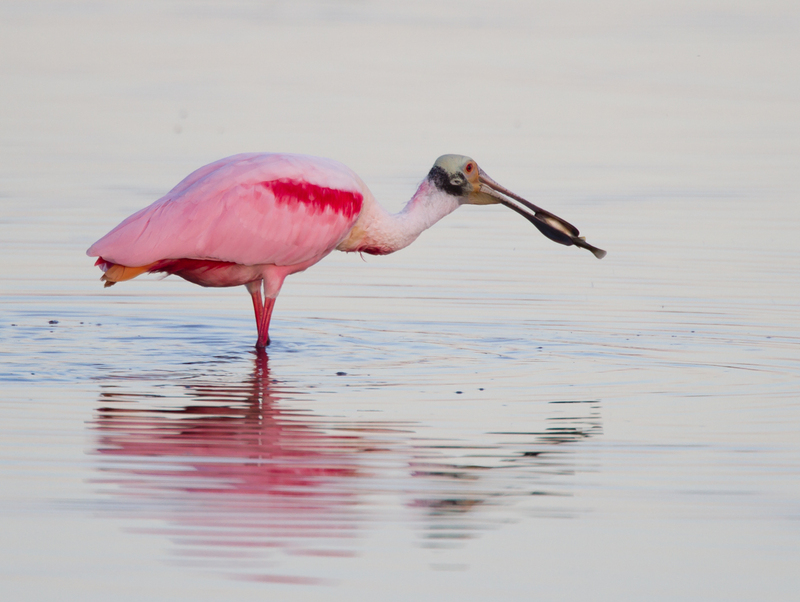 Roseate Spoonbill populations plummeted in the early 20th century due to hunting for the plume trade and habitat destruction. 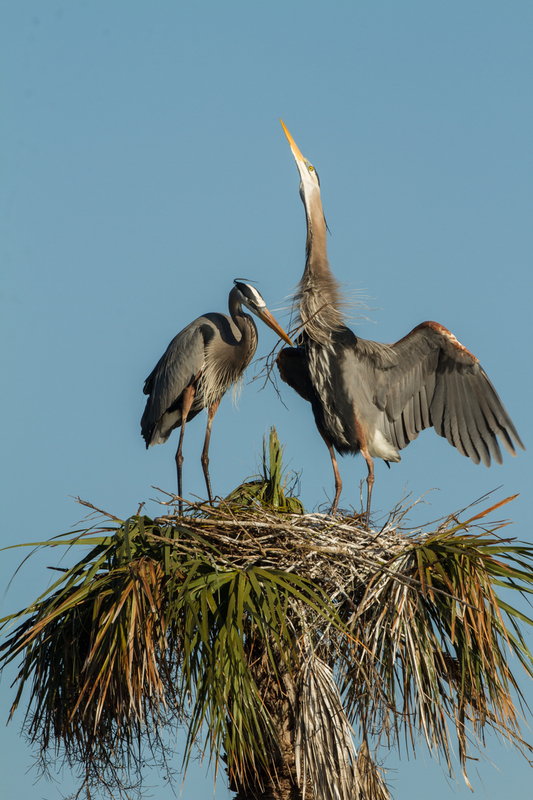 Their numbers were reduced to only a few dozen breeding pair in Florida, but with protection, they have recovered, much to the delight of nature enthusiasts and photographers. I finally had to call it a day as the sky turned a beautiful pink and gray. 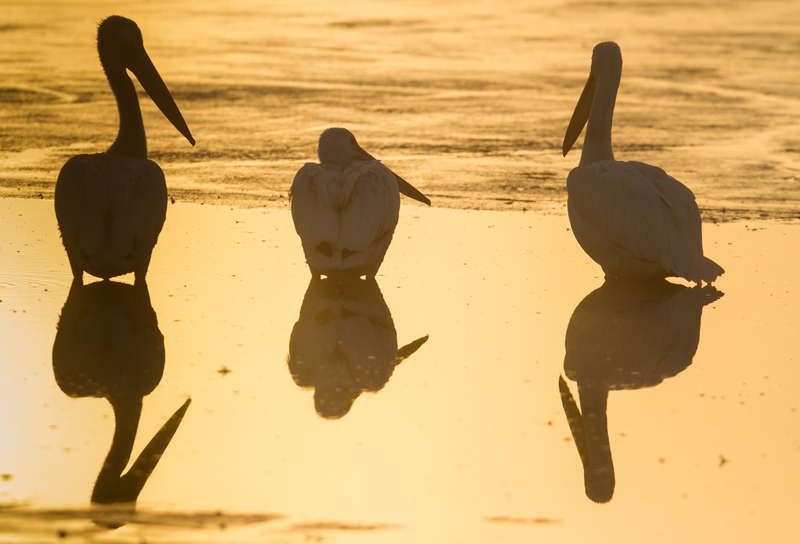 Even though people said it was not as good as usual, my brief time at Merritt Island had proven it to be well worth it.